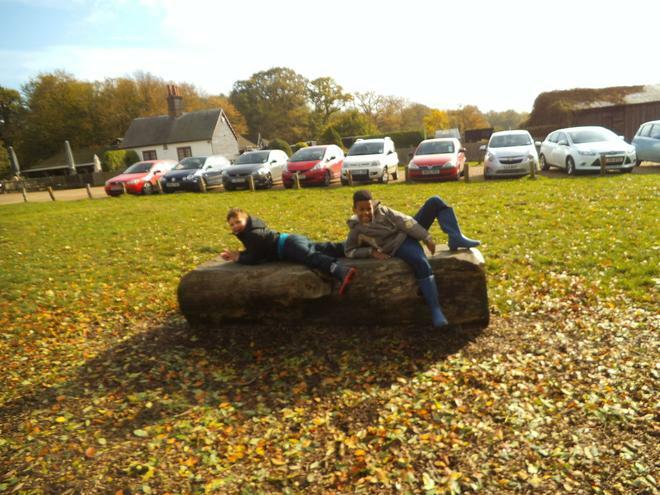 Hi and welcome to the Gold Class web page. 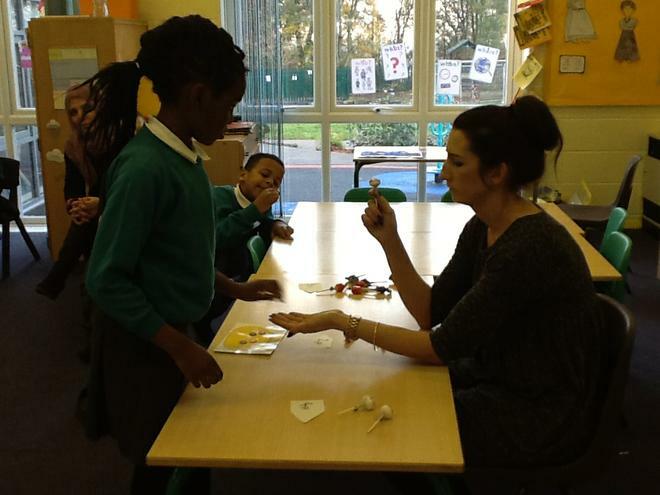 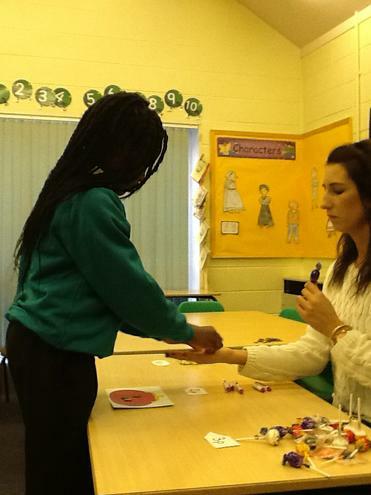 I am Emma the class teacher and working alongside me are Mandy, Sam, Rosa and Michelle. 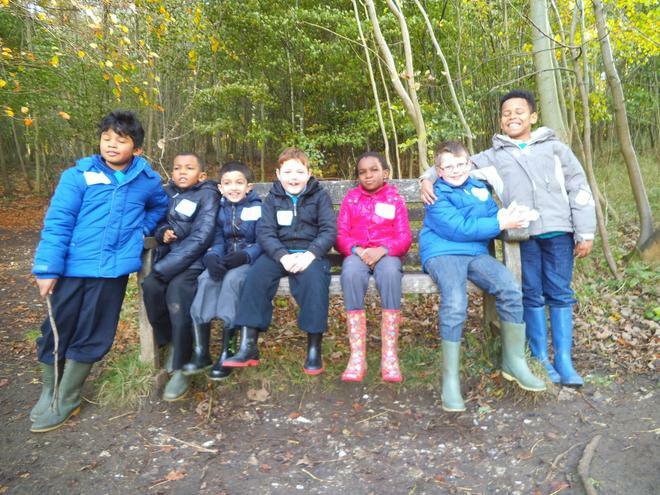 The photos and pieces of work that you will see on this page are from: Junior, Dorcas, Alex, Lionel, Damian, Alisha, Ellis and Waseem. 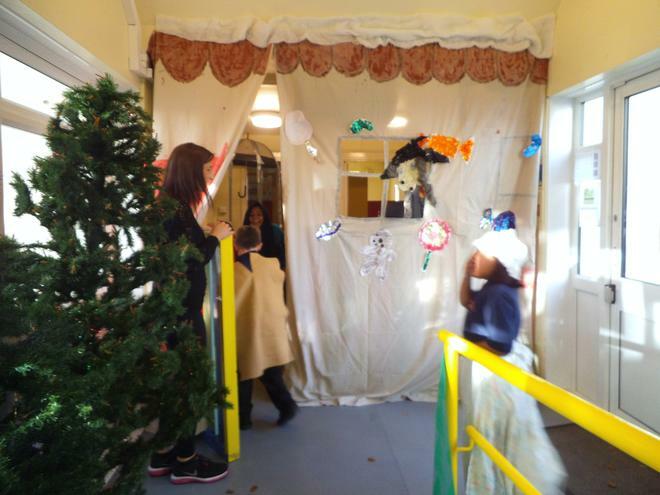 What we have enjoyed this year! 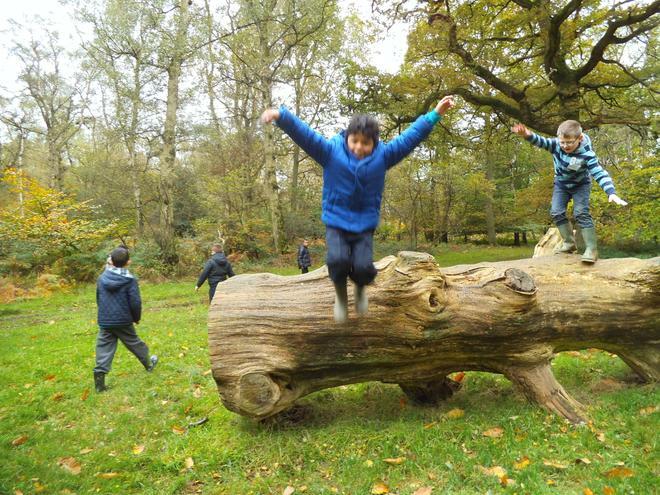 We can't believe it is our last half term of this school year! 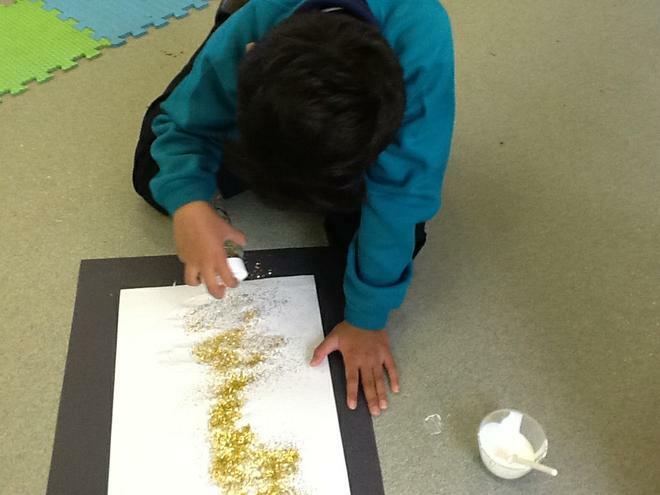 In Gold class we're going to make it a good one! 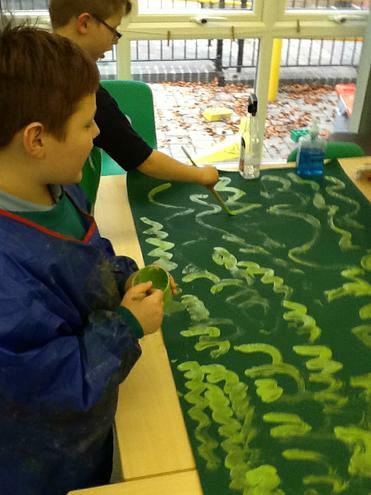 This half term our topic is 'How does your garden grow?' 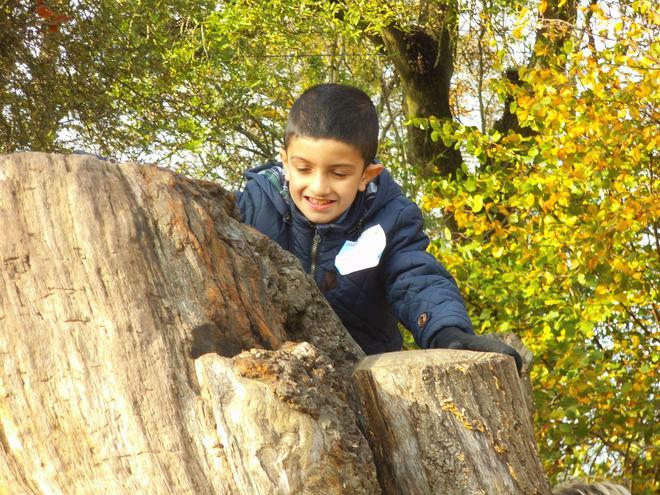 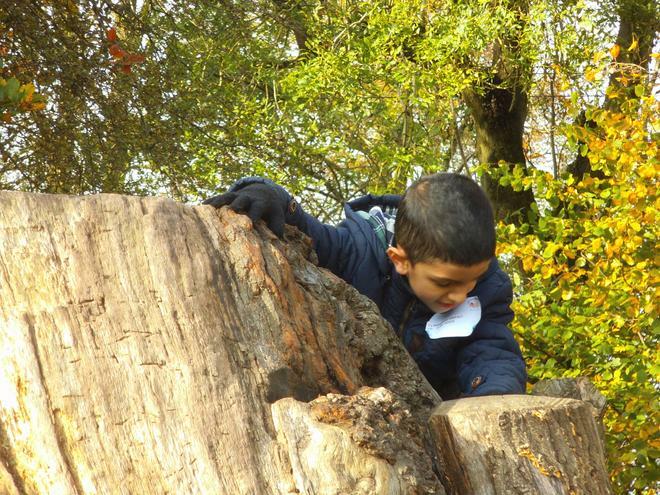 We will be exploring living and non-living thing, carrying out a science experiment on what plants need to grow, we'll be looking at the life cycle of trees, parts of plants and types of trees/ plants as well as looking at other types of mini beasts that live in our garden and a special project on bees. 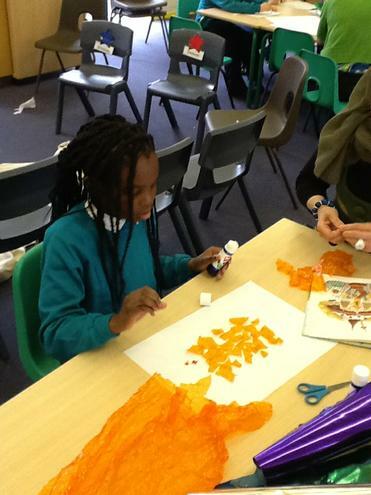 Our literature for this half term is another Roald Dahl book- 'James and the giant peach'. 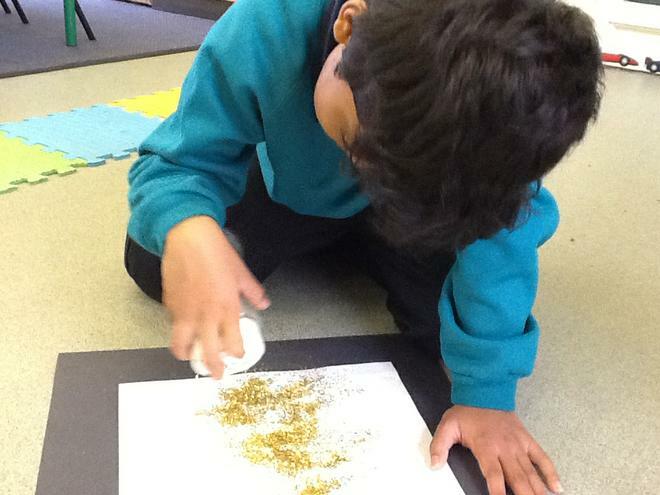 We're in full swing already and are having our own 'Gold Garden' which will be outside Maggie's family room towards the end of term. 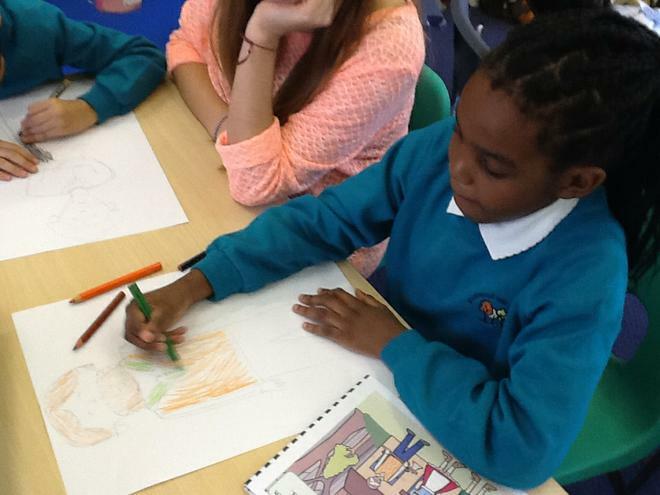 This half term in Gold class we are continuing to study texts from the author Roald Dahl. 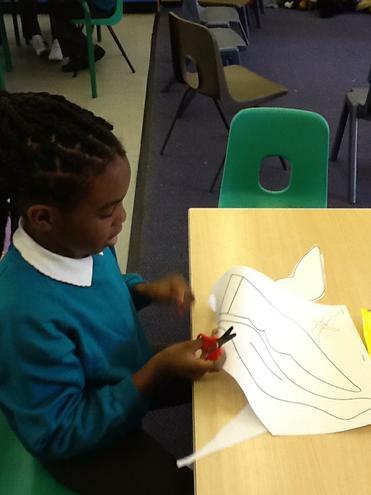 We will begin by reading 'The Enormous Crocodile'. 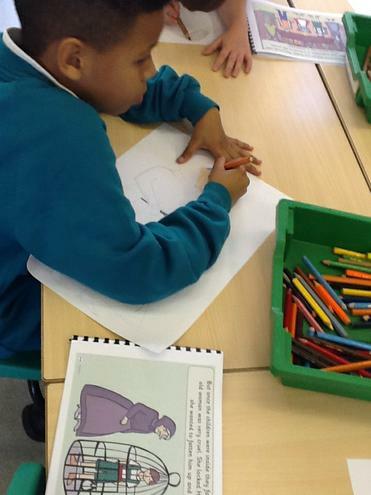 This is a story about a naughty crocodile who comes up with some clever tricks to try and eat some juicy children! 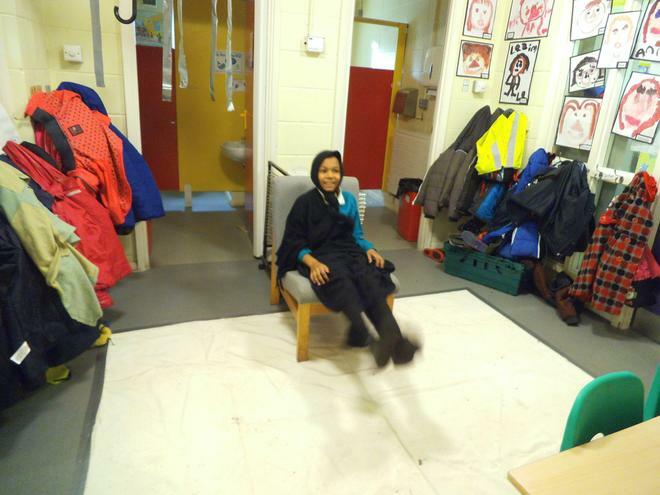 Here is a lovely Jackanory version of the story for you to watch. 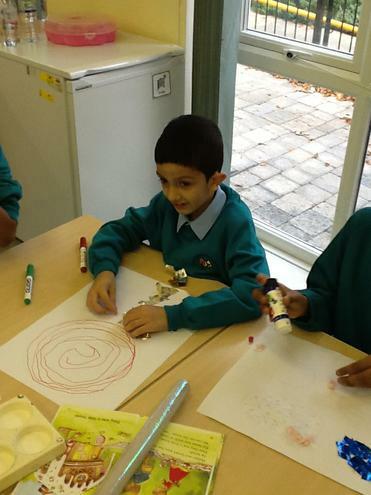 Our topic this half term is 'Show Time'. 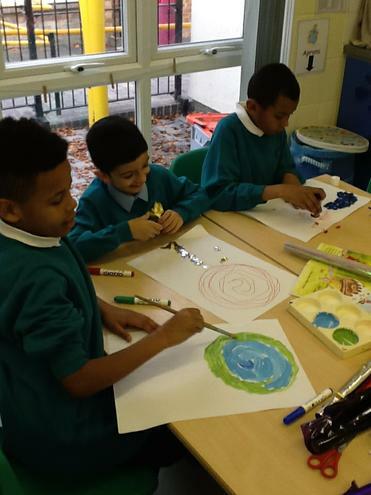 We will be dressing up as clowns and acting silly, practising circus skills and putting on a year group performance at the end of term. 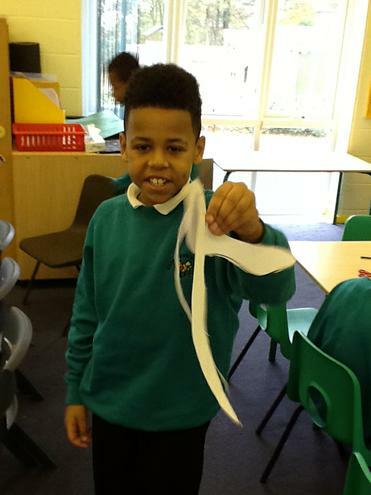 The children have previously learned their addresses, and are now practising their telephone numbers! 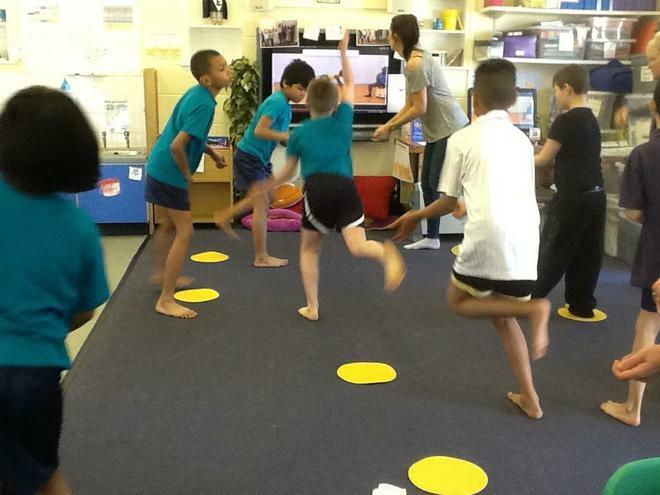 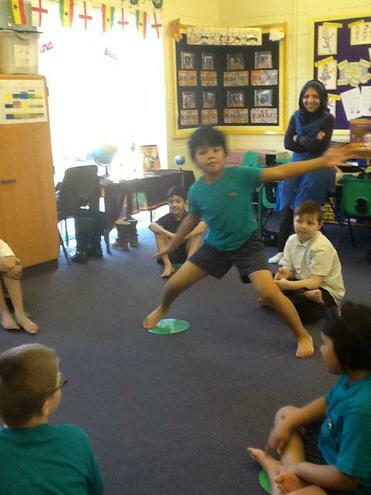 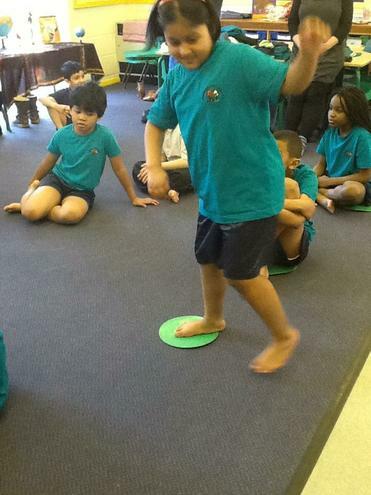 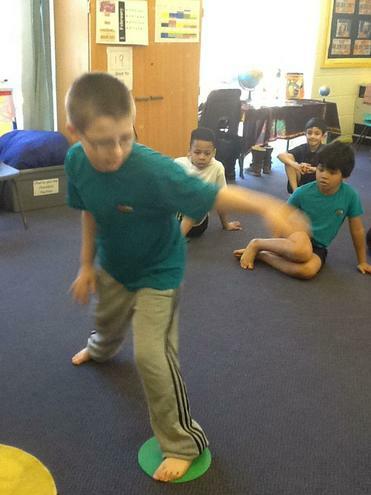 We are also learning about our bodies and what we need to live. 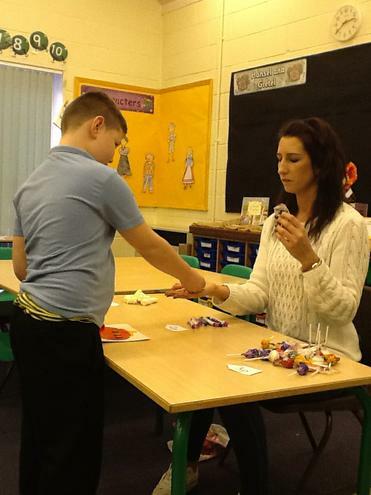 We will also be finishing off our Chocolate bar adverts at the elearning centre. 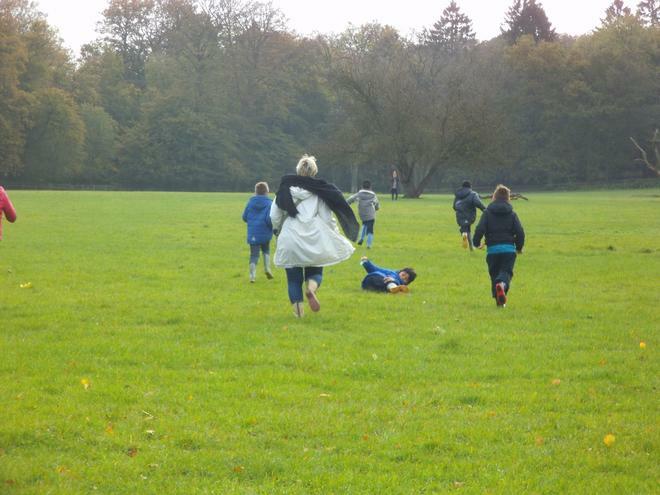 Trying to make Emma disappear! 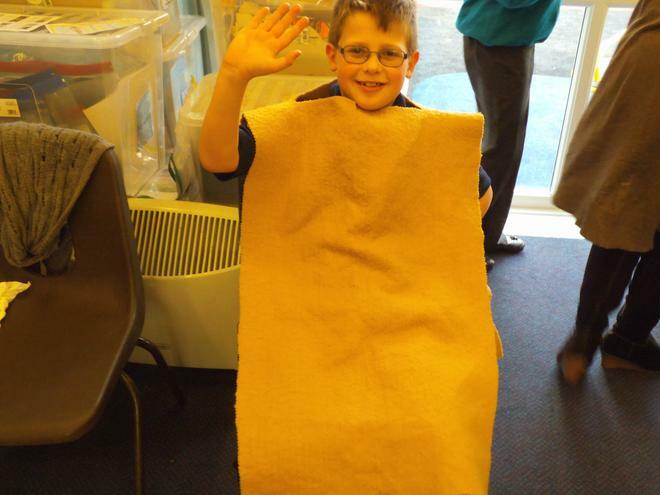 In Gold class we have dressed up as characters from Charlie and the Chocolate Factory! 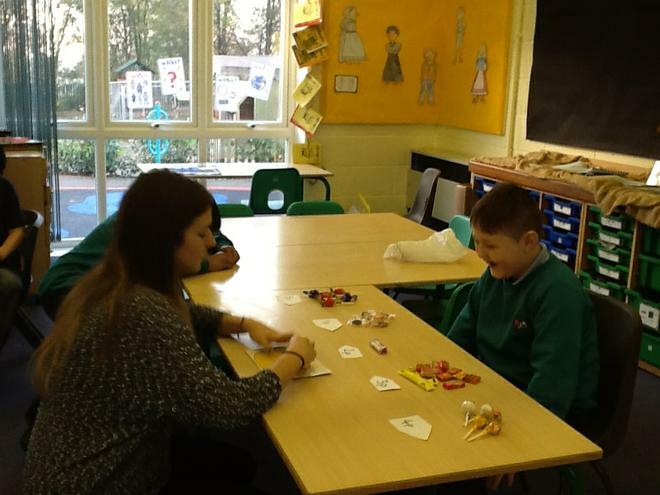 The children have had a fantastic day and they are addressing each other as the characters name rather than their own!!! 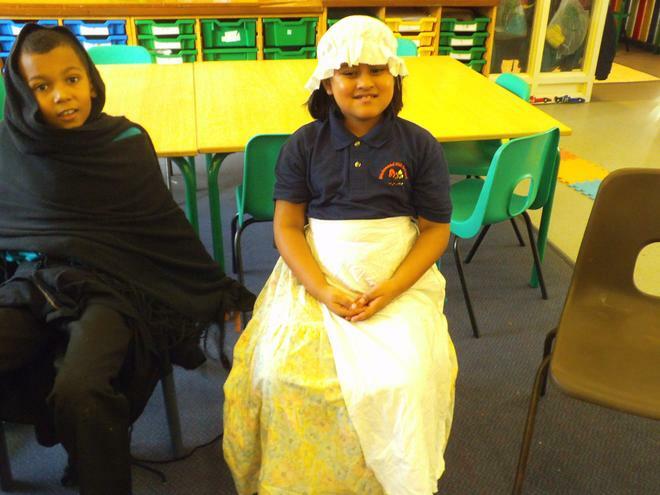 Our topic for this half term is 'Town and Country'. 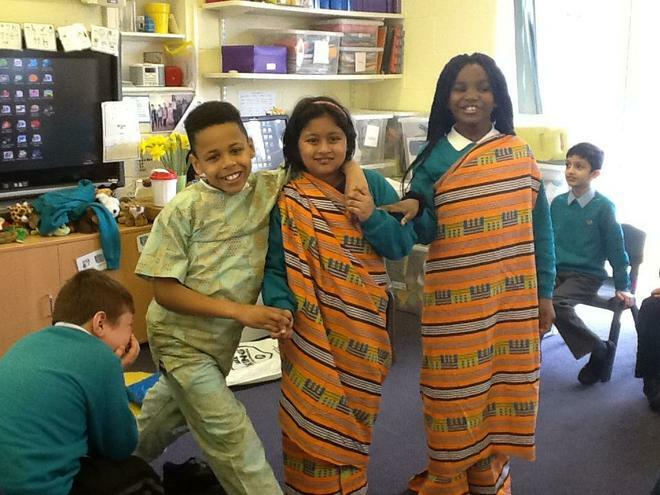 in Gold class we are going to look at the differences between Luton, England and Ghana, Africa, and comparing traditions and locations. 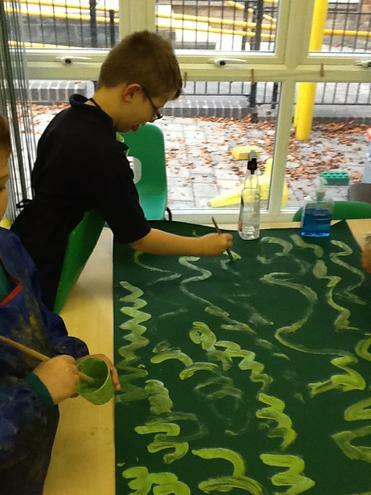 This will follow on from our work in Literacy on Charlie and the Chocolate Factory last half term, which the children really enjoyed. 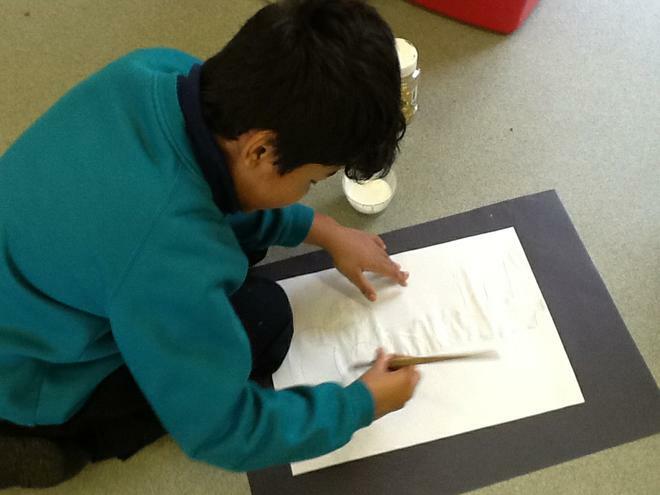 This half term, in Literacy, we will be looking at non-fiction texts to learn about how chocolate is made and where it comes from- 'From bean to bar'. 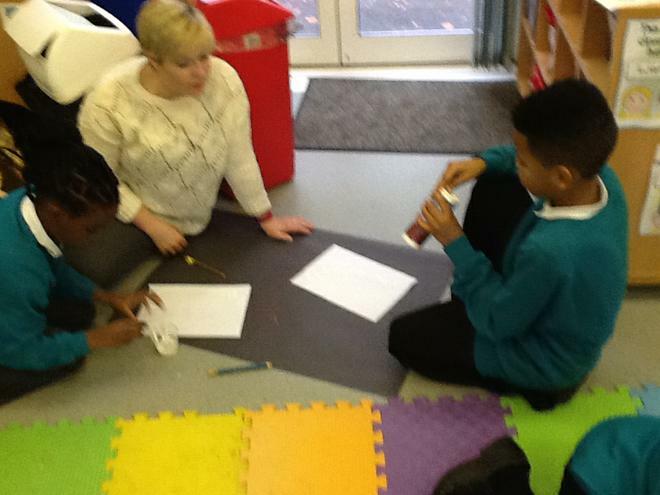 The children will be choosing ingredients to make their own chocolate bar, design its wrapping and then plan a storyboard to make an advert for their bar at the e-learning centre, which they will star in at the end of term! 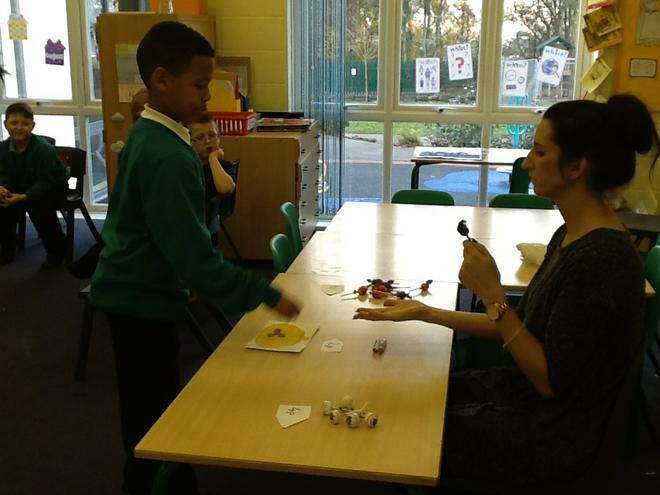 The videos will be uploaded onto Richmondhill TV. 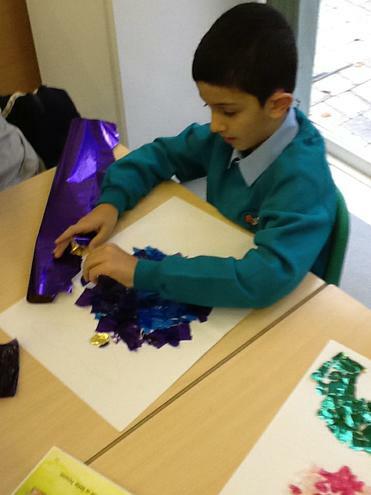 We have also got our amazing trip to Cadbury's world. 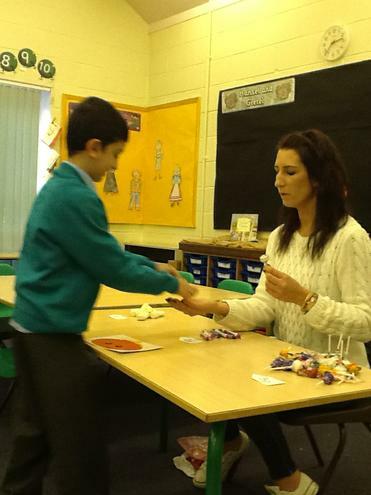 The children are working hard and behaving well to earn pieces of their golden ticket to get into the factory! 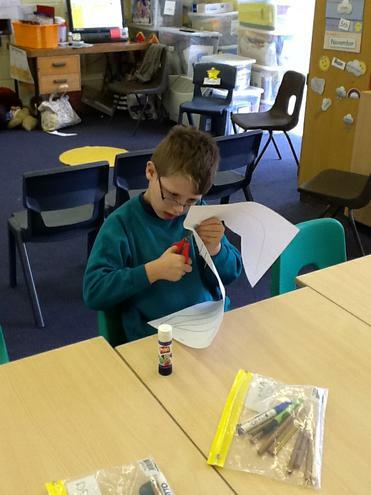 Letters will be going out to parents following our meeting early this half term. 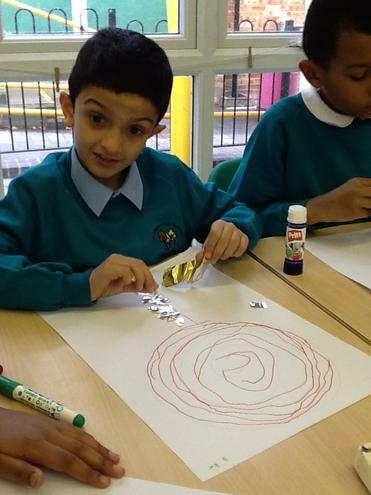 In computing we will be focusing on sounds and music, using programs to record and make their own music and soundboards. 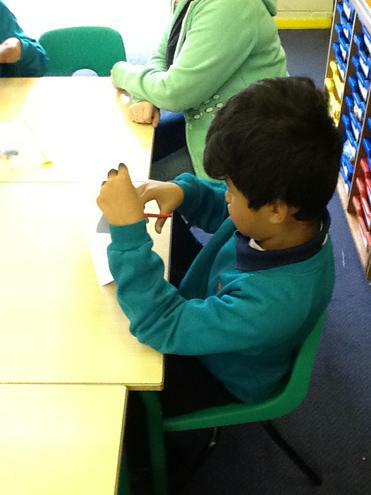 We will be using an app called 'Mad pad' on the iPads to support our computer work. 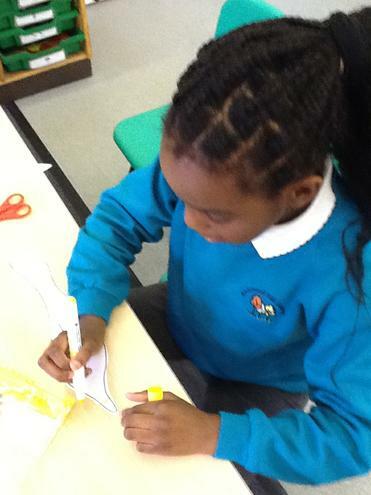 Some of the children will also begin work on programming using an app called 'Daisy the Dino' as well as purplemash. 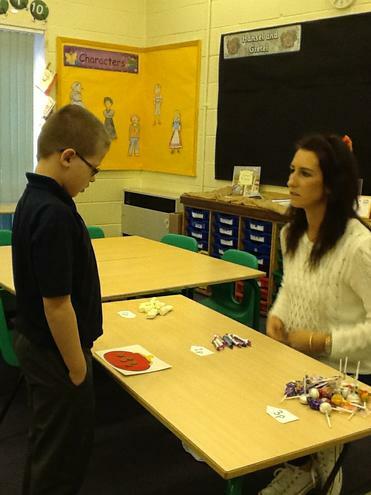 We will be cooking up some tantalising chocolatey treats in cookery, with recipes taken from the Cadbury's world website. 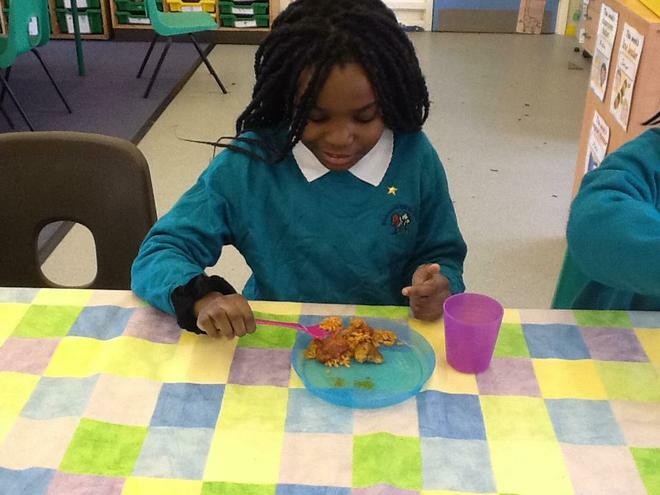 If the children don't eat it all, hopefully you will get to taste some at home! 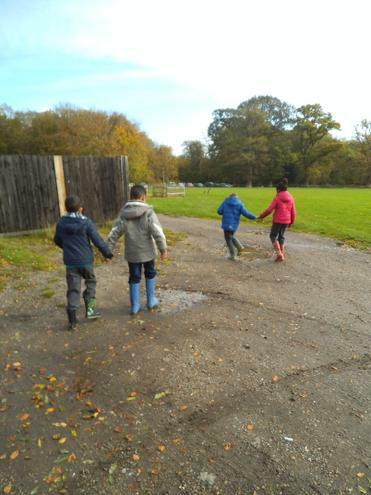 Unfortunately we will not be swimming now, the children made amazing progress so please do try to take them swimming to keep up their water confidence! 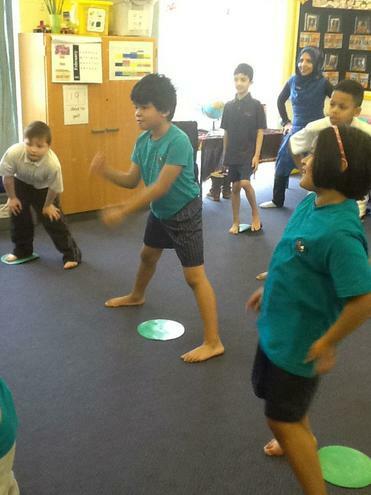 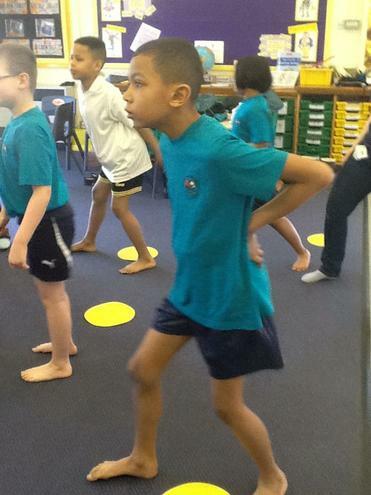 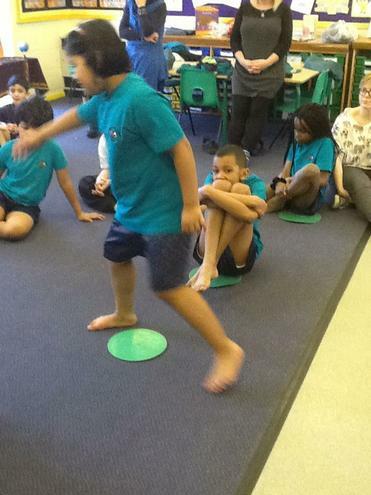 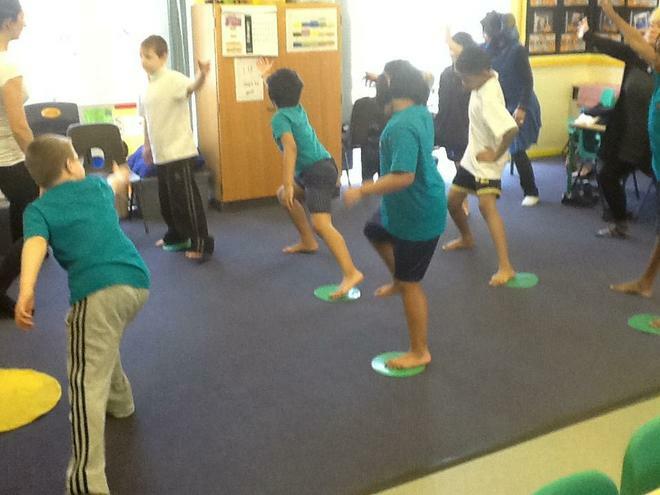 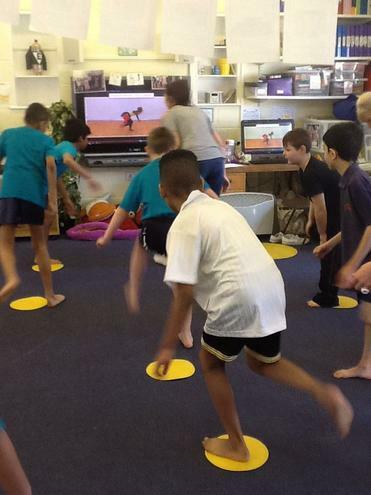 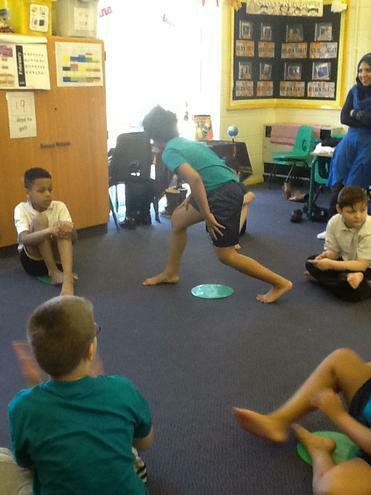 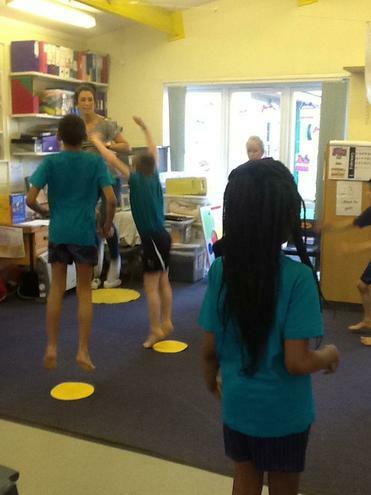 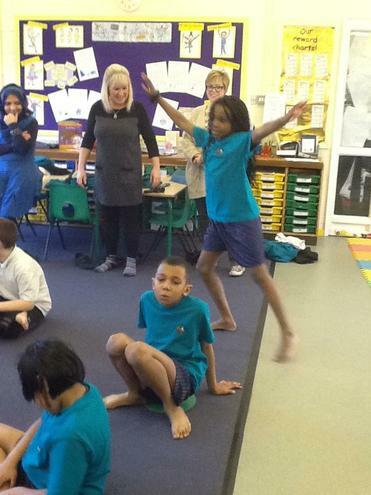 Instead we will be having an extra PE lesson which this half term will be focused around traditional African dance. 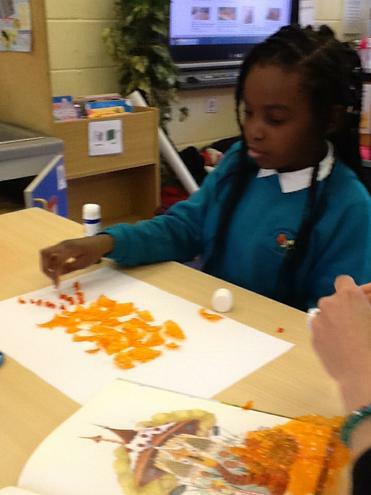 Comparing Ghana, Africa to Luton, England. 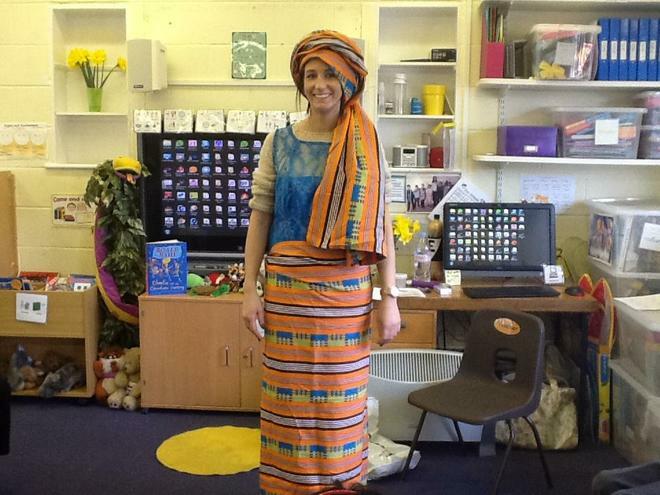 In topic we are comparing our town to a town in Africa. 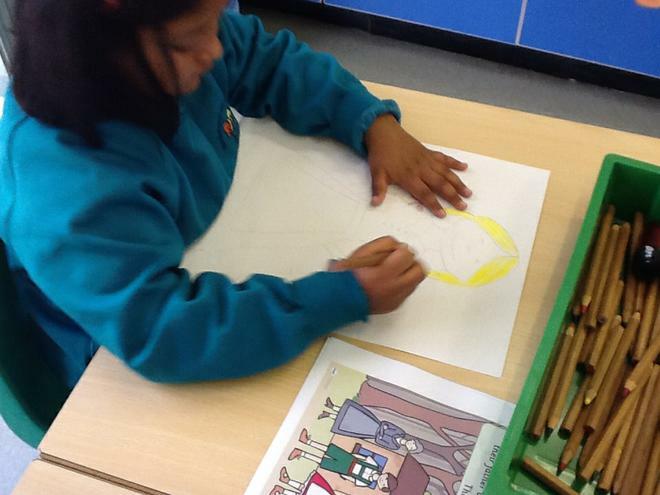 This we we have compared the houses, landscapes, foods, animals and clothing. 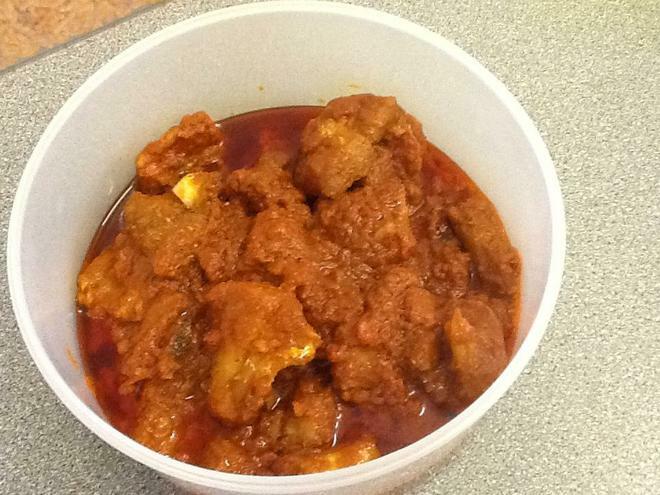 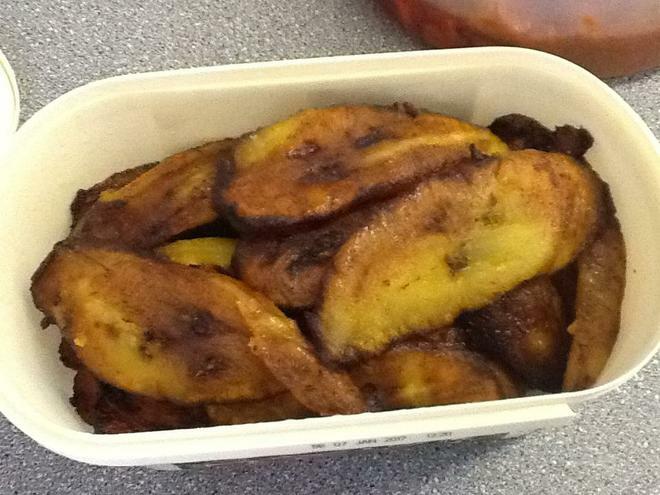 We were lucky that one of Sam's friends Elsa cooked us some traditional African foods- Fish Stew, Jellof rice and Plantain. 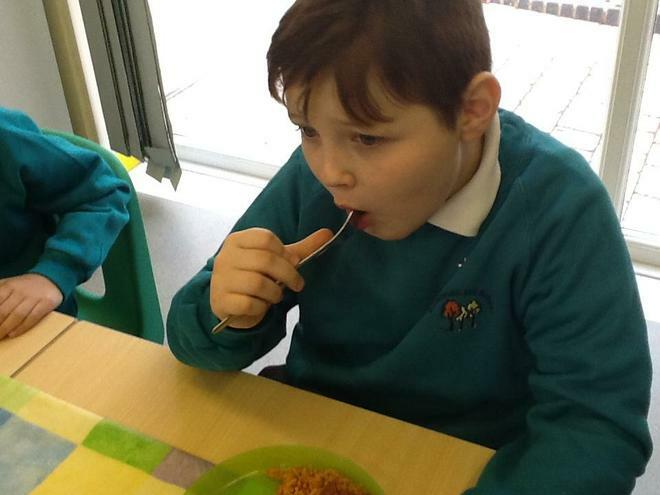 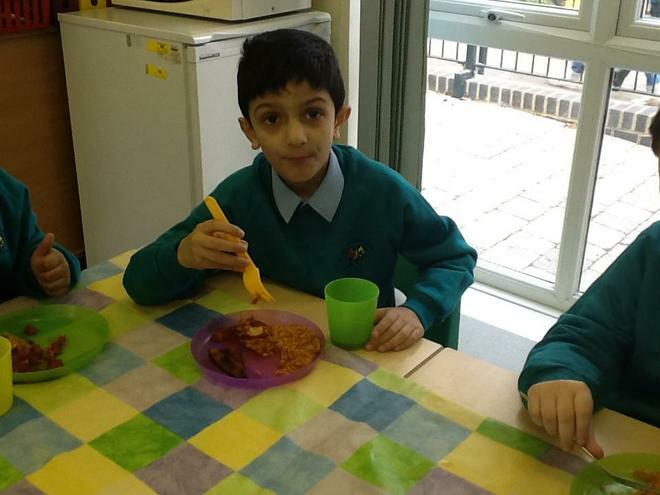 This went down well with the children and next week we will be tasting traditional English foods. 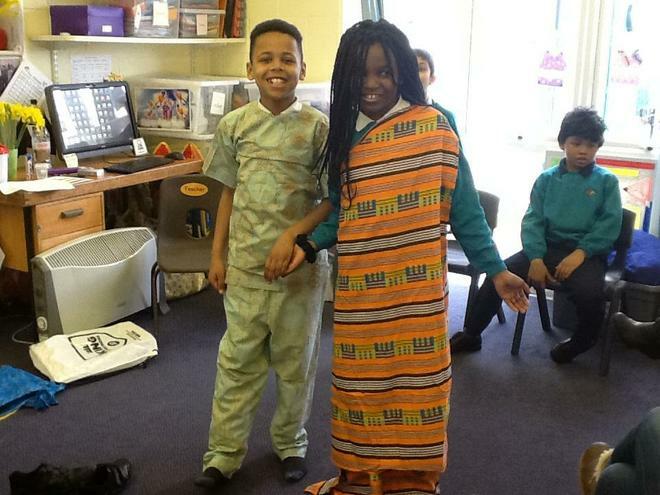 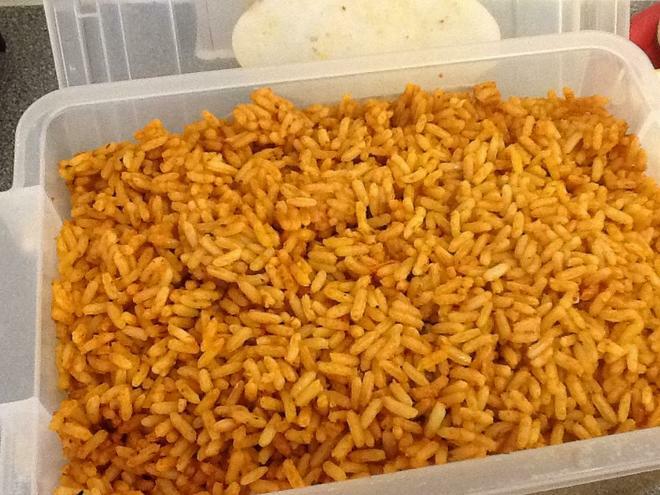 African food tasting, African dressing up and African dancing! 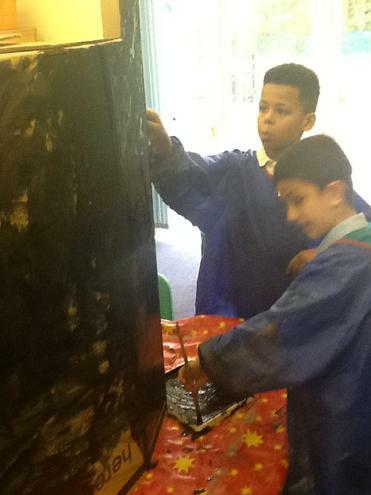 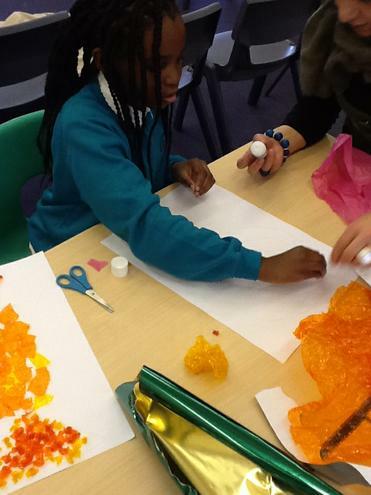 This half term Gold Class will all become artists! 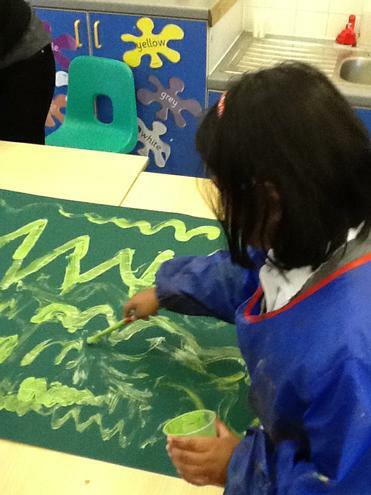 Our topic this half term is Pictures, paintings and photographs. 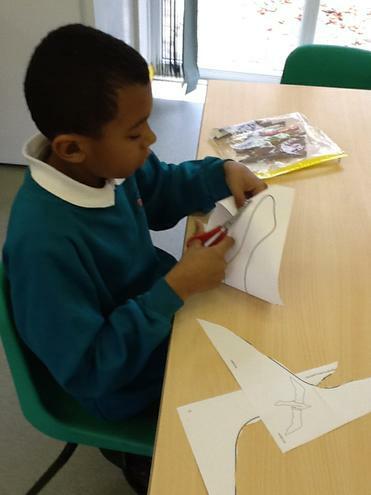 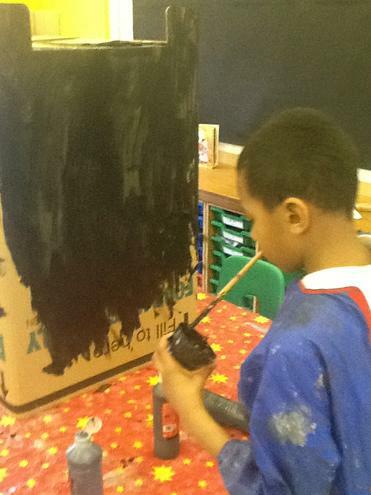 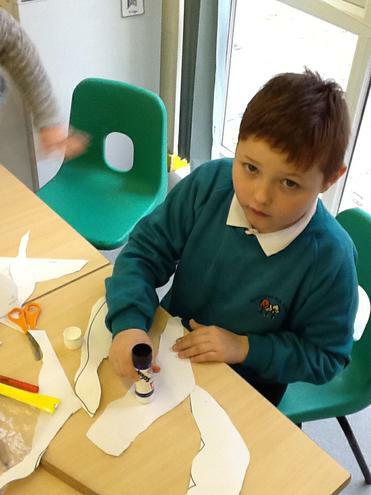 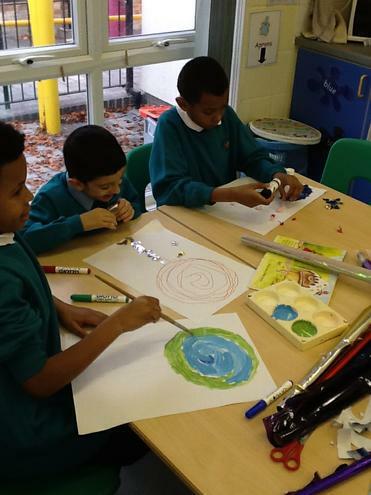 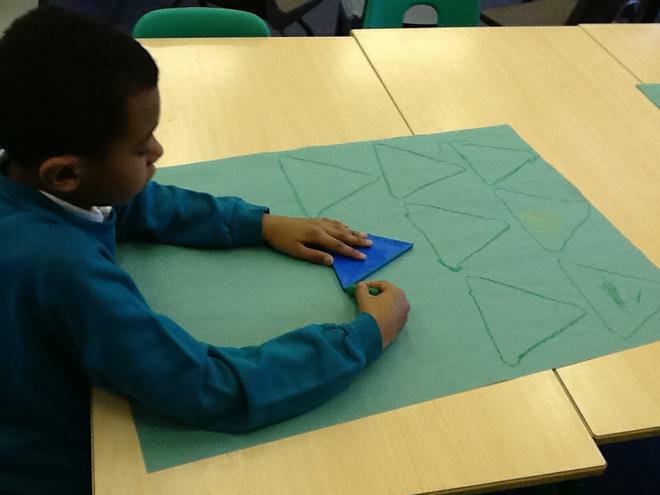 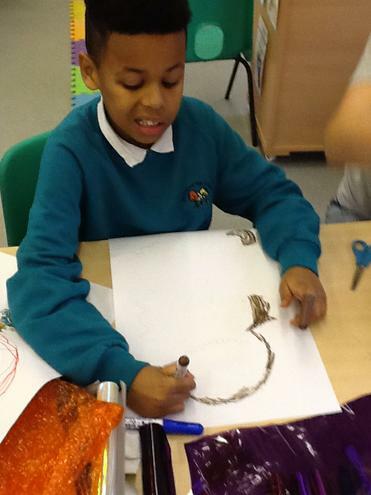 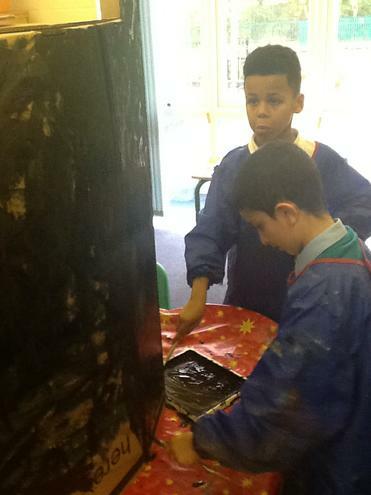 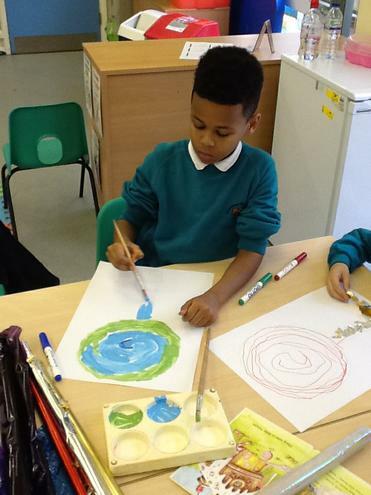 Each week we will be creating masterpieces in the style of different artists. 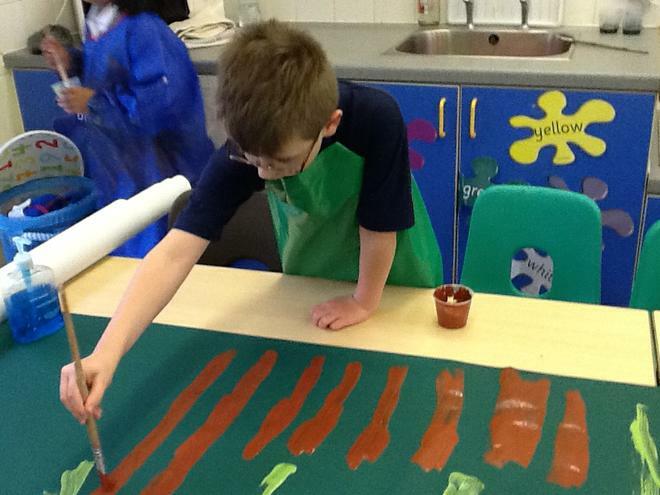 Week 1- Andy Warhol- popart. 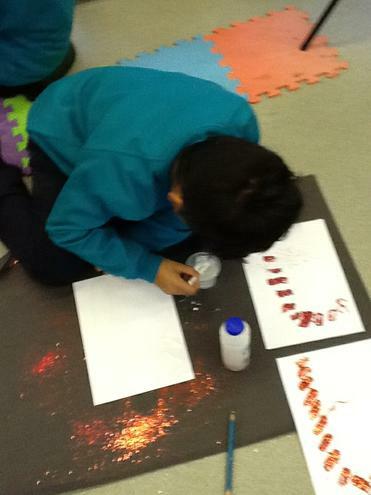 We will also be learning about primary and secondary colours and light and dark shades of colours. 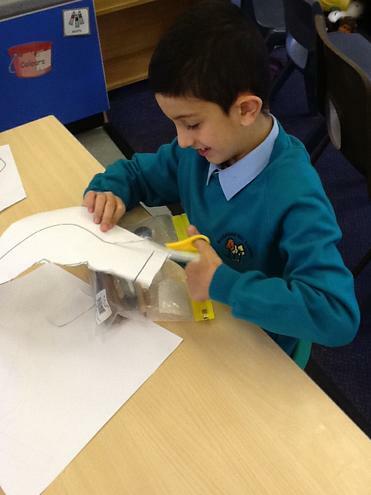 In science we will be learning about sound. 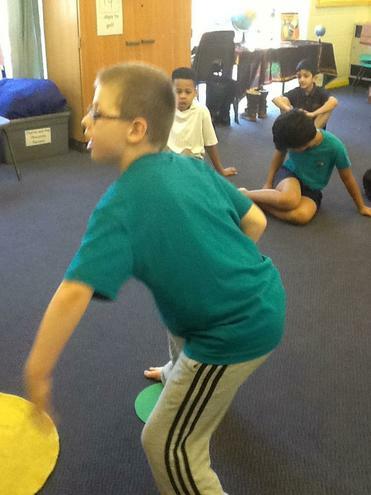 How we hear, different volumes and pitches of sounds and different types of sounds in our environment. 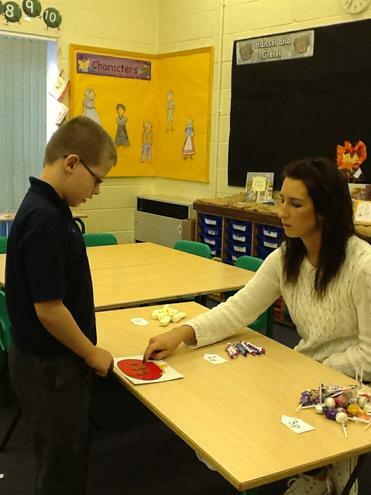 In literacy we will be learning about ‘Charlie and the Chocolate Factory’. 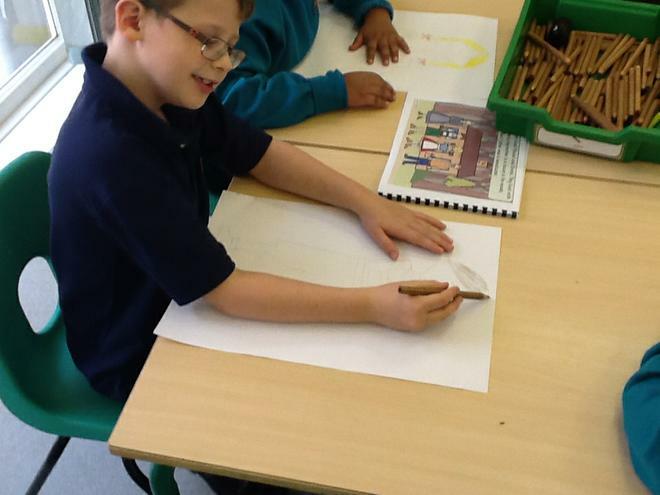 This half term we will be studying the plot and characters and next half term we will be designing their own chocolate bars and wrapping. 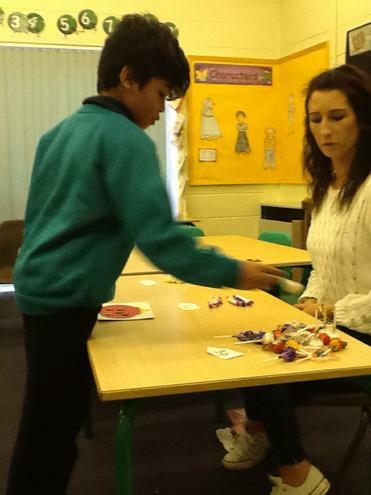 We will then create our own advertisement for our chocolate bar and go to the e-learning centre to film it! 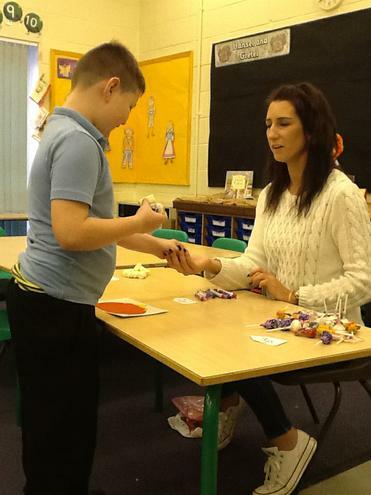 We will also run a chocolate shop to help raise money for a trip next half term! 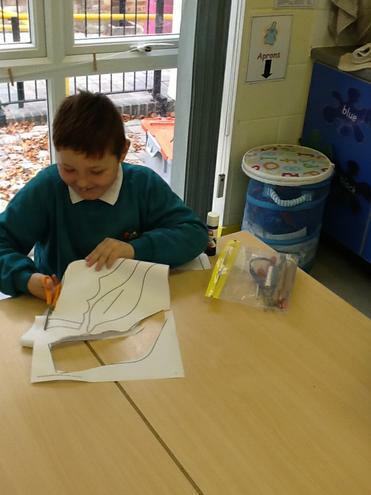 Gold class are off to a busy start this half term, we have started by securing our understanding about shapes from last half term and are now going to learn about money, then maps! 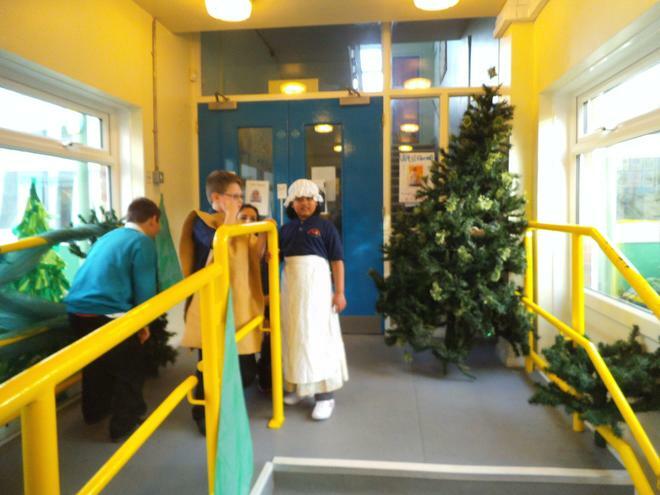 This will all link to our traditional tale- Hansel and Gretel. 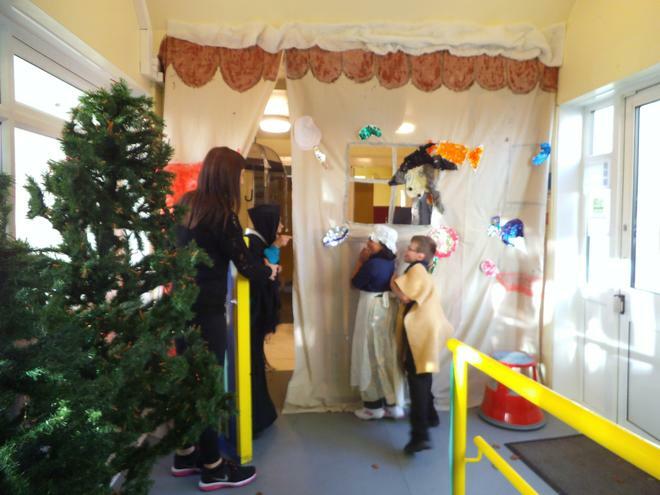 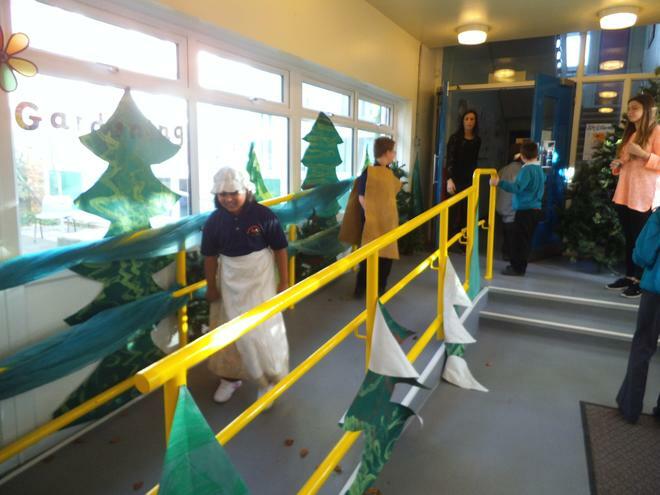 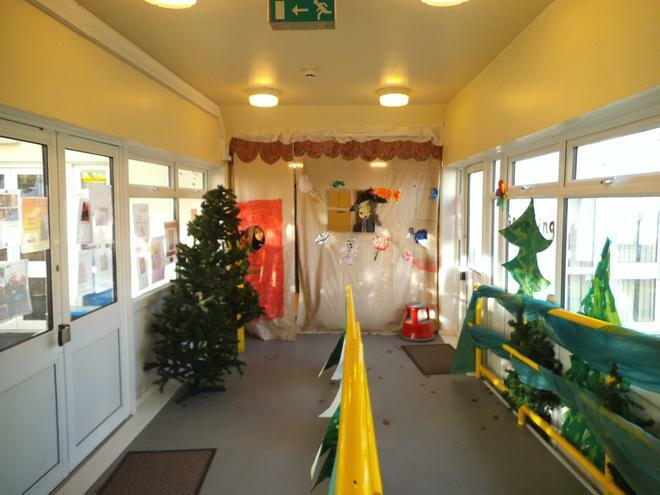 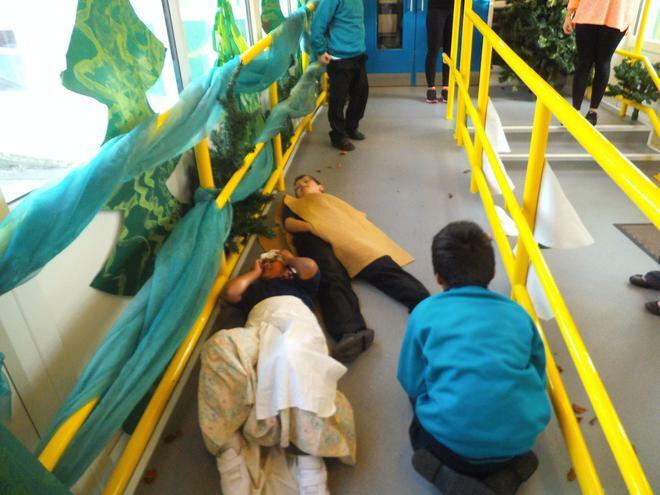 As you can see from the photographs below we have created a spectacular role play area with Silver Class in our corridor. 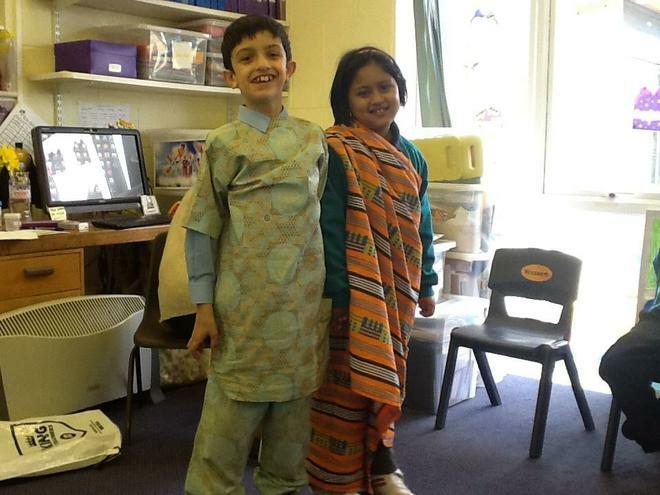 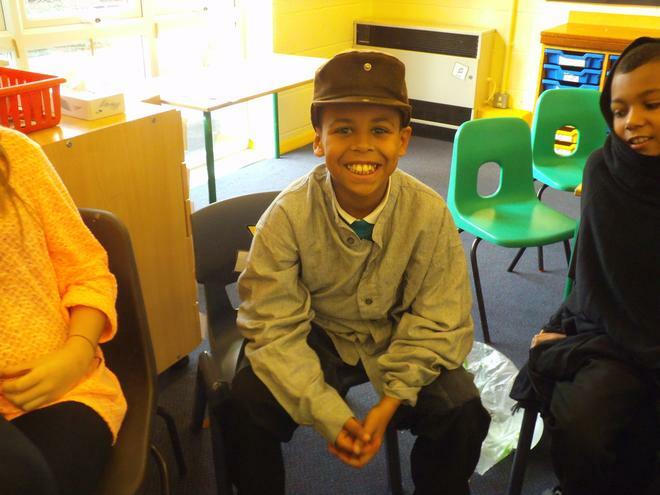 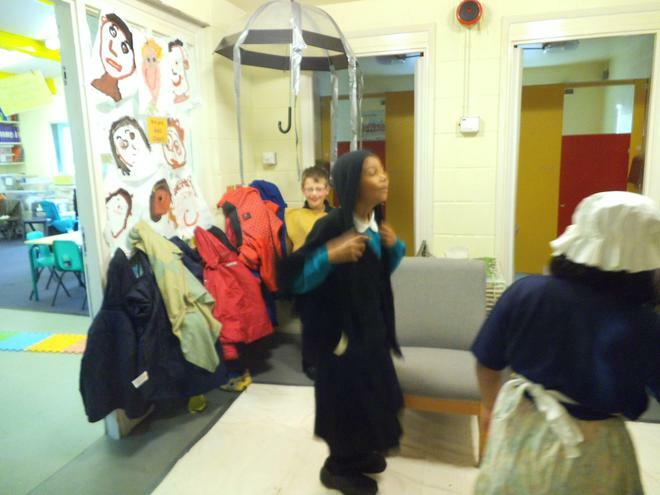 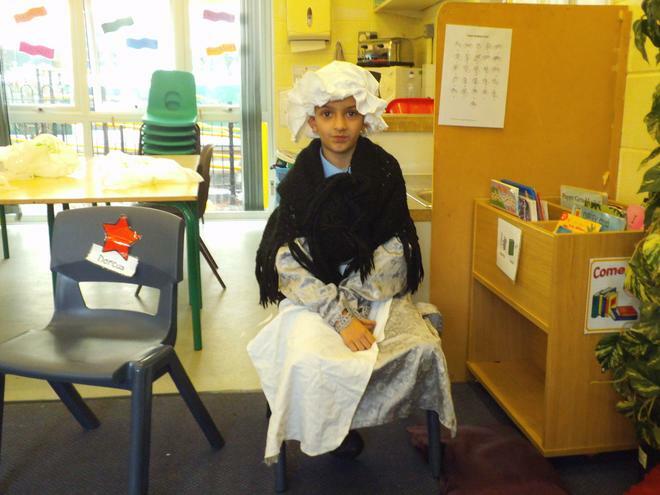 The children enjoy dressing up and acting as the different characters at any possible moment! 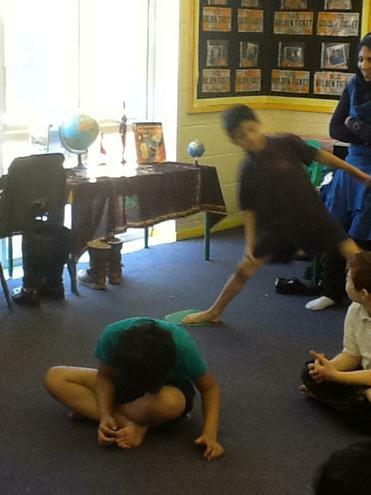 We are developing our acting skills to put on a year band performance of the tale near Christmas. 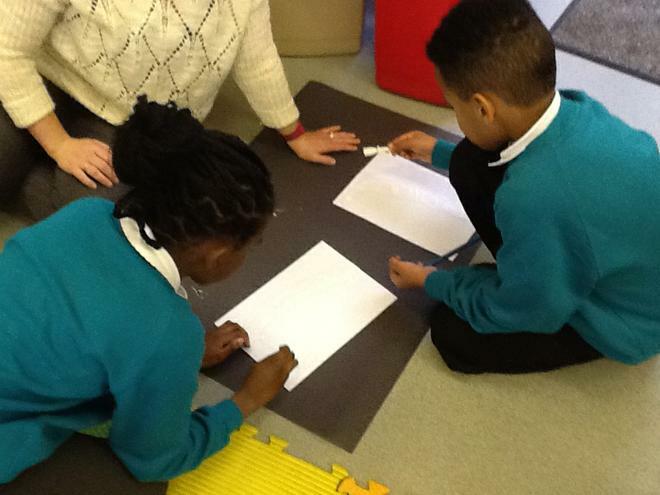 Our topic is 'Let their be Light' where we are exploring night and day, dark and light, shadows, light sources and electricity. 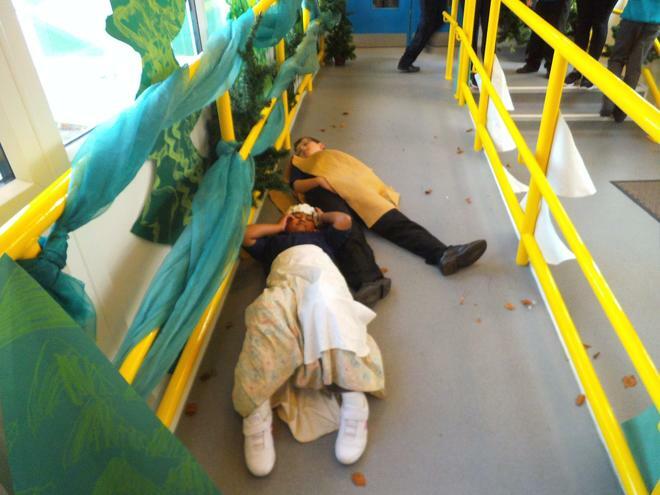 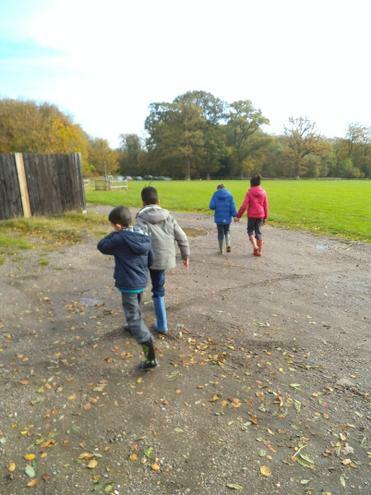 Keep looking back for photos of what we have been up to! 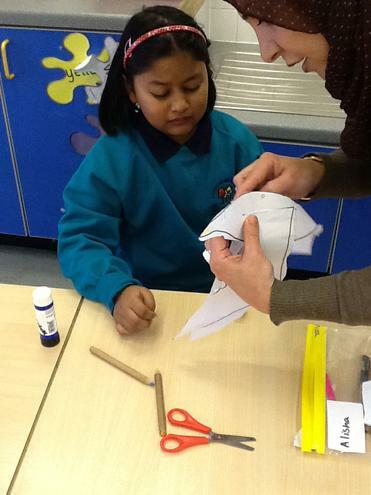 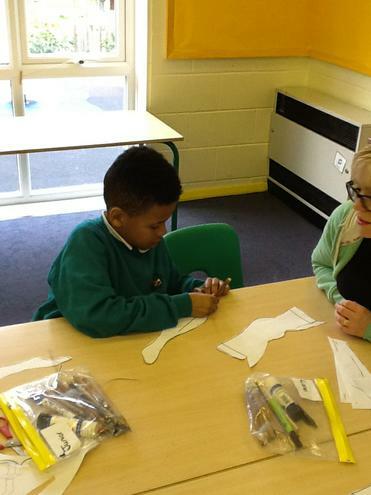 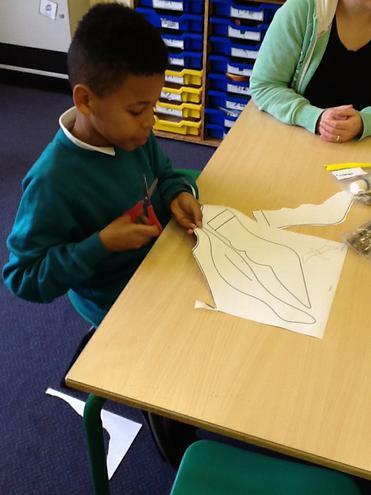 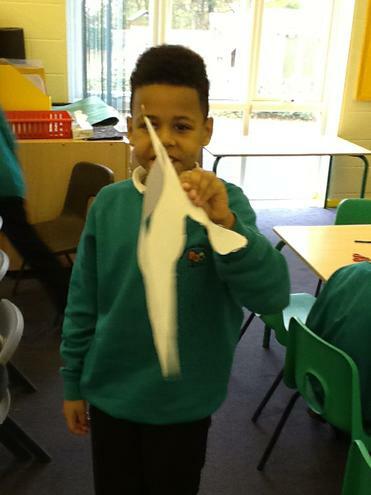 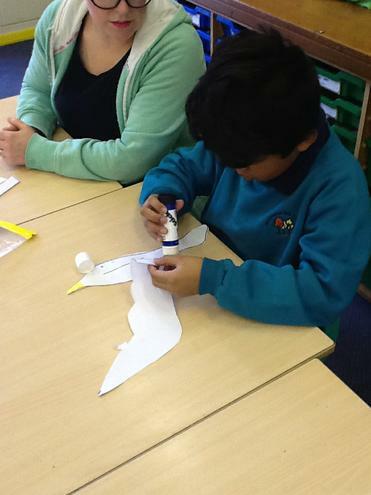 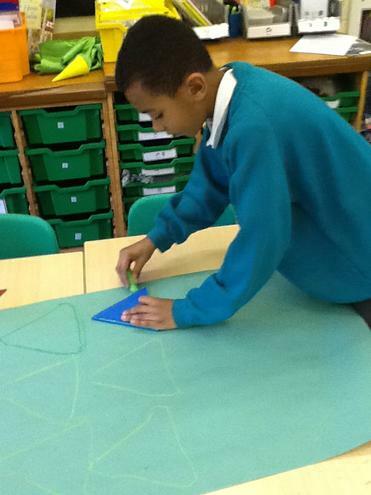 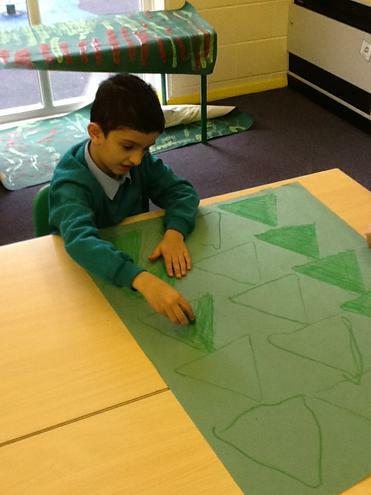 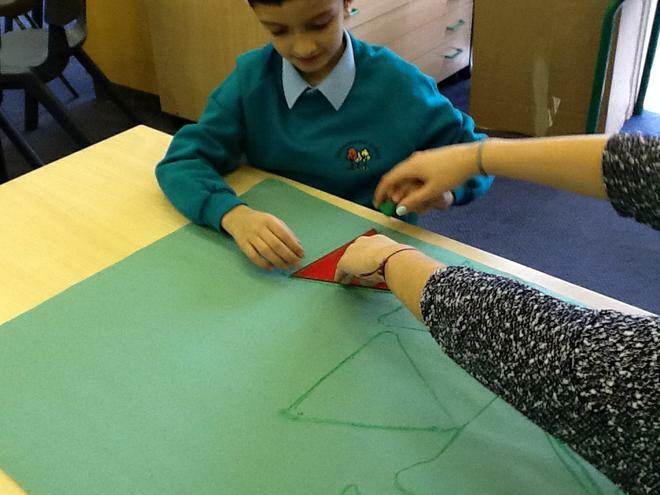 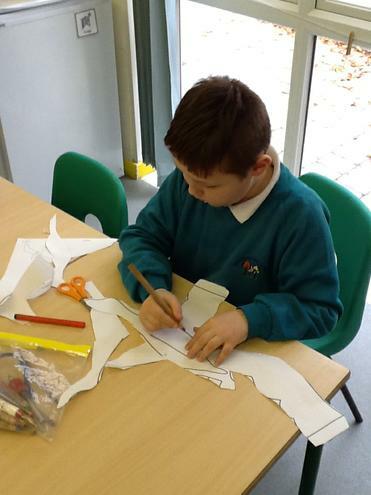 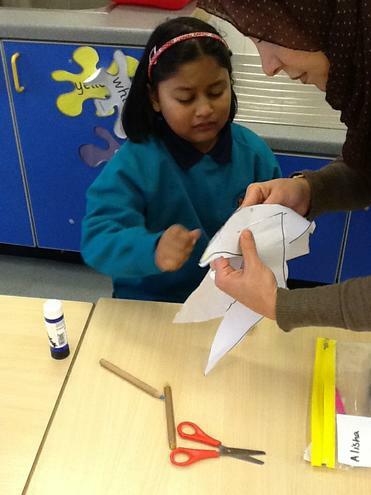 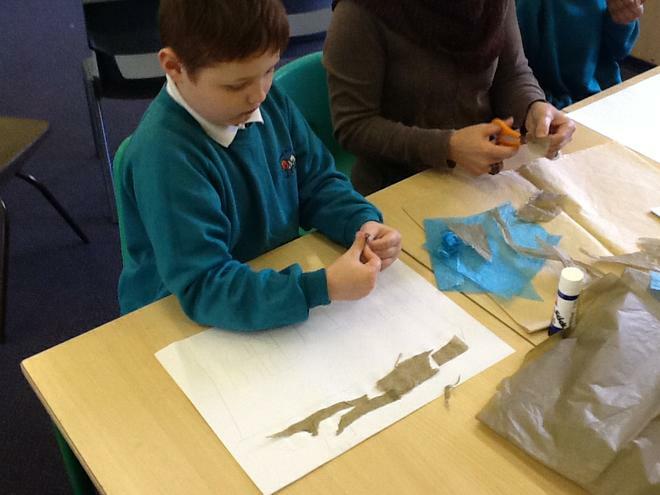 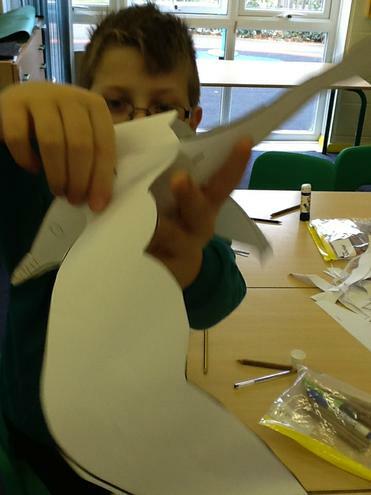 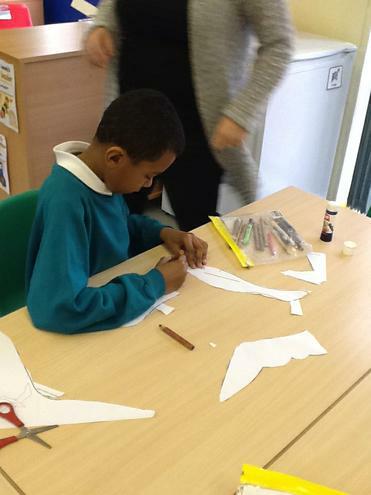 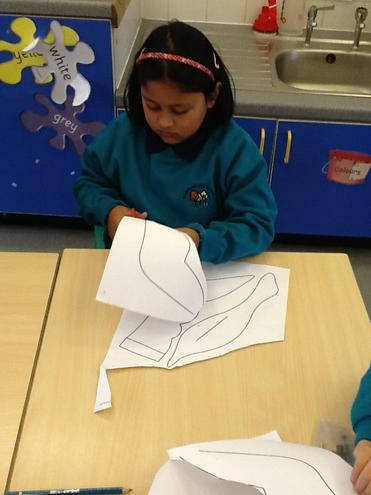 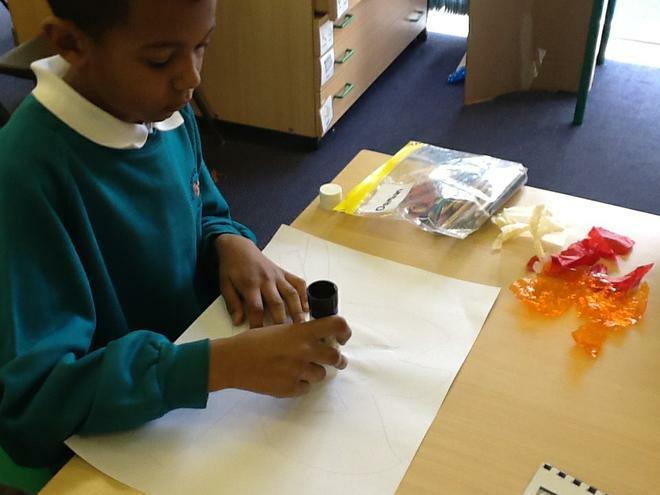 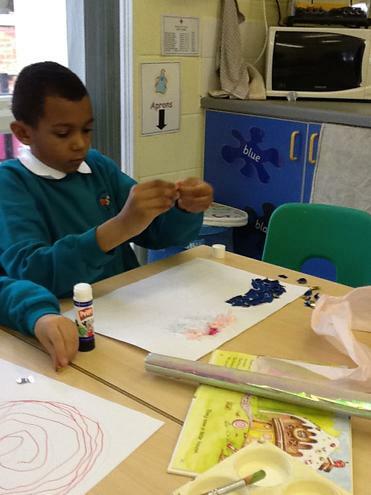 Making props for our Hansel and Gretel role play area and performing the tale. 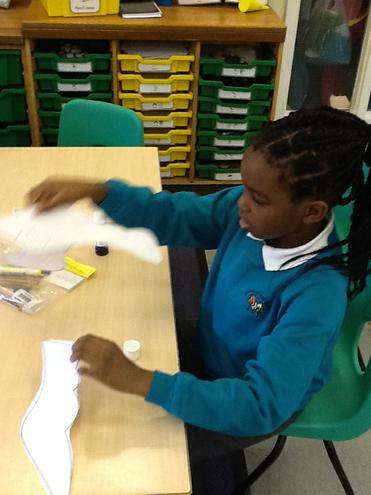 This week we have begun exploring our lovely, new Hansel and Gretel hand puppets. 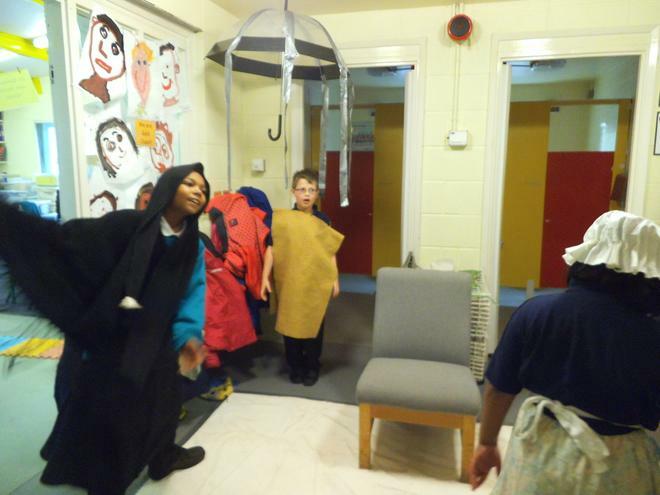 The children enjoyed using them and really took on the characters and props. 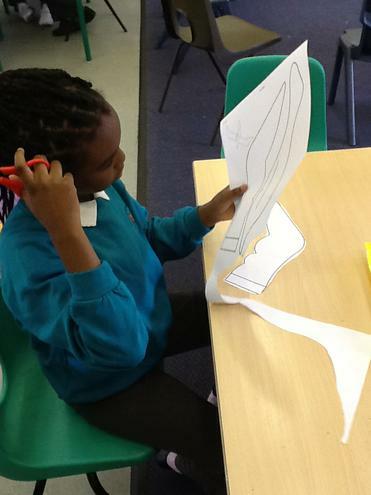 They were able to work together using their hand puppet to re-tell the traditional tale with narration from Junior. 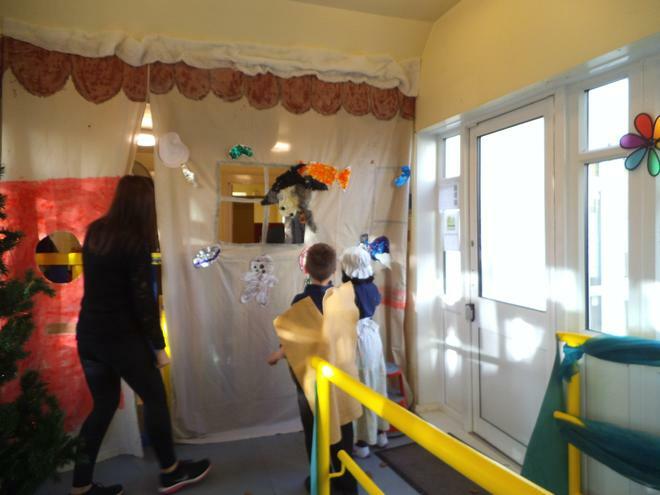 Look back next week when we will have used the puppet theatre to video our show. 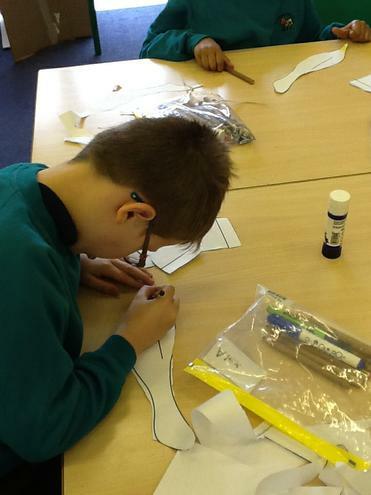 Hansel and Gretel hand puppets! 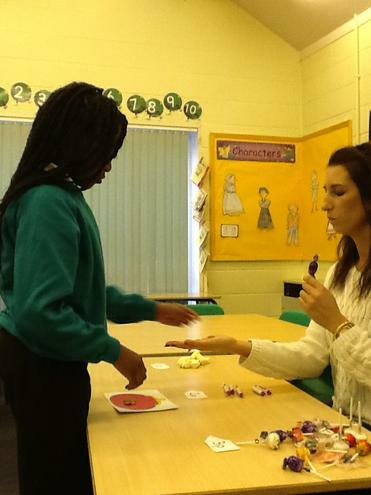 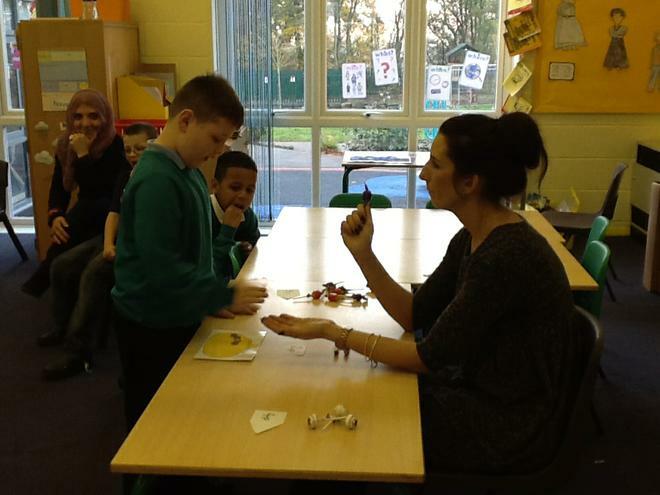 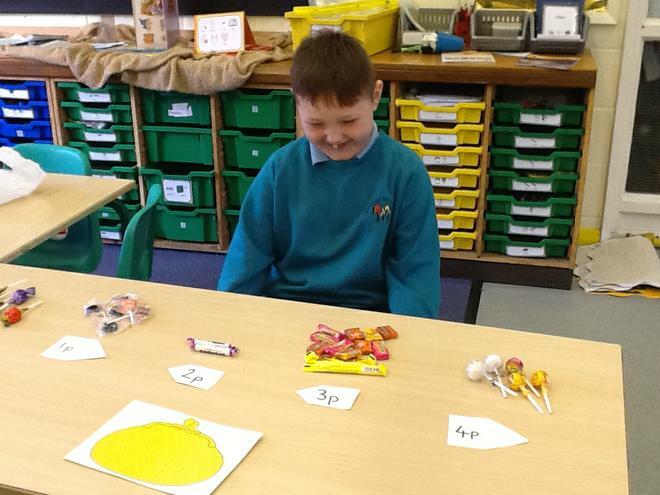 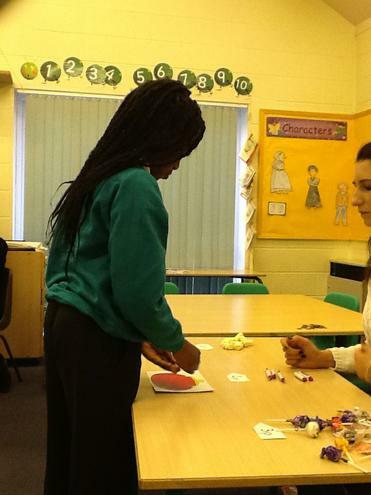 Numeracy- The witch's sweet shop! 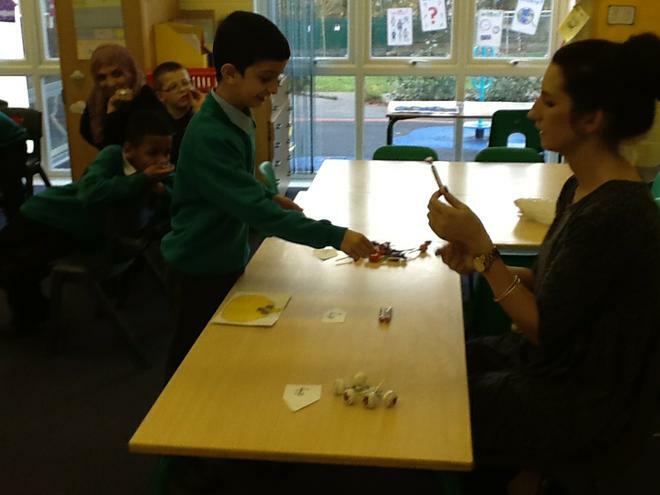 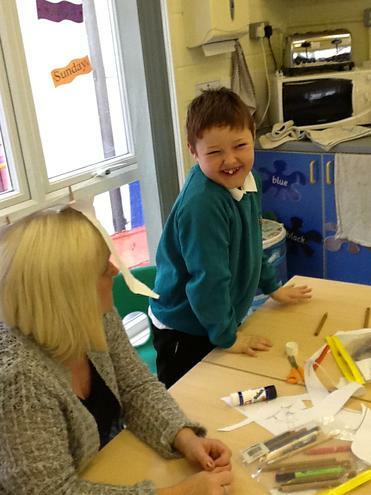 We have had great fun in Numeracy this week. 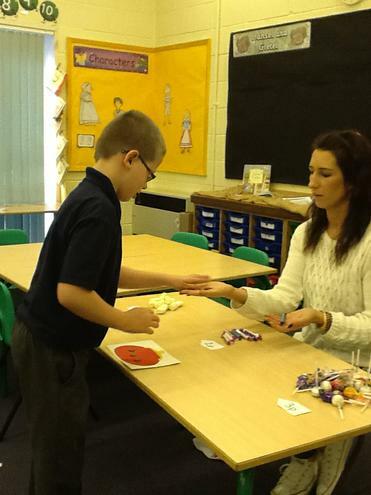 We have had our very own sweet shop that has been selling sweets from the witch's house! 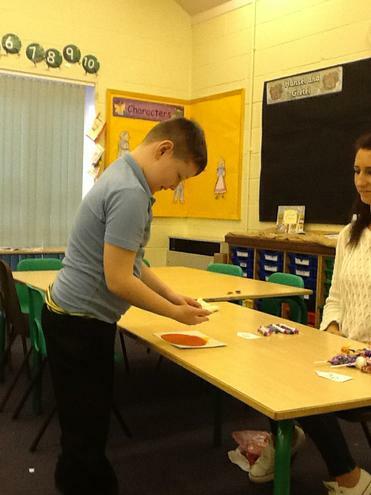 The children have been learning how to use 1p coins up to 10p. 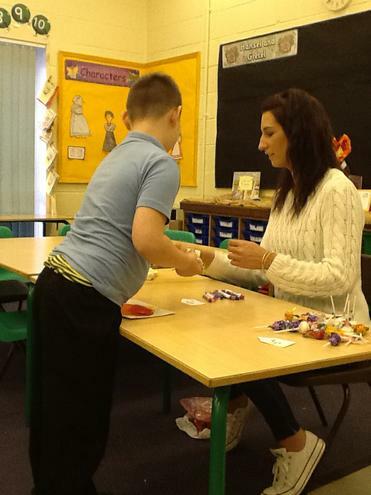 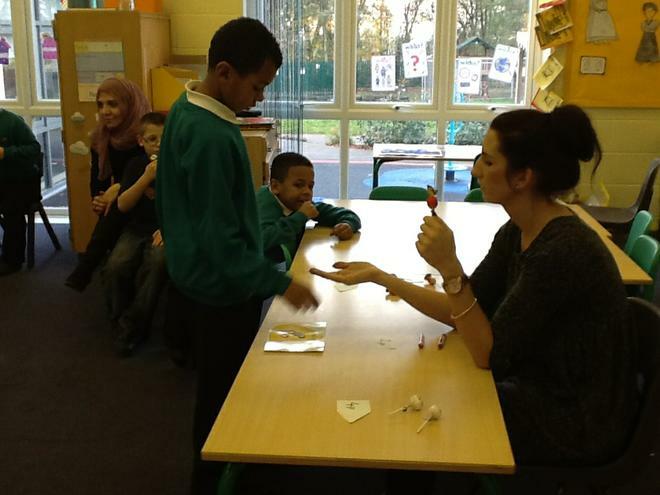 They have been given some pocket money each day and then spent it in the sweet shop. 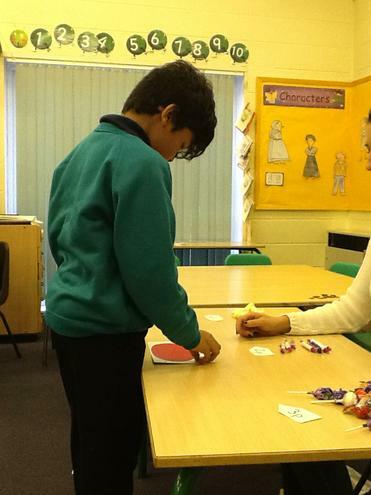 We've taken turns in being to shop keeper too. 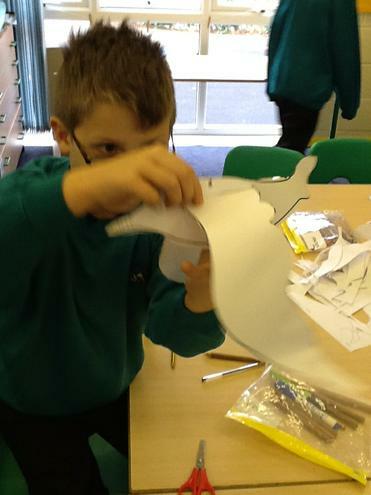 This half term our topic is 'What a Load of Junk!' 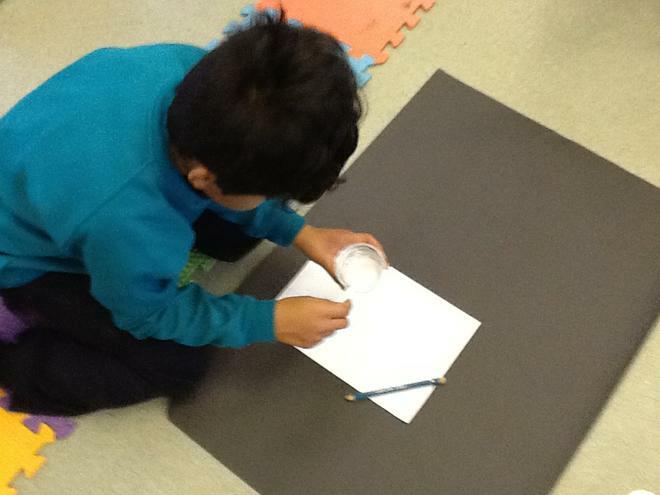 Where we will be exploring how things feel, how they look and words to describe them. 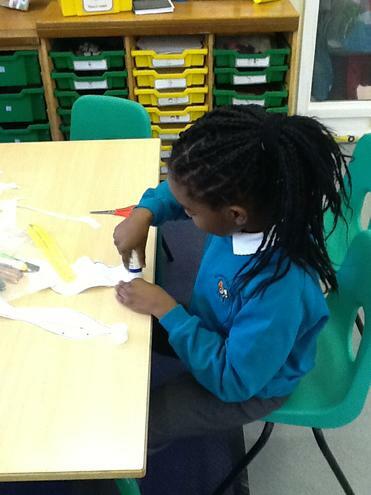 We will be finding out what materials things are such as wood, metal, plastic and fabric. 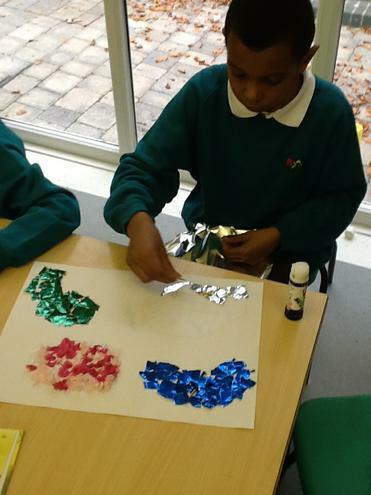 We will be doing some science experiments to find out which fabrics are waterproof, taking part in a 'Keep Britain Tidy' campaign and learning about recycling. 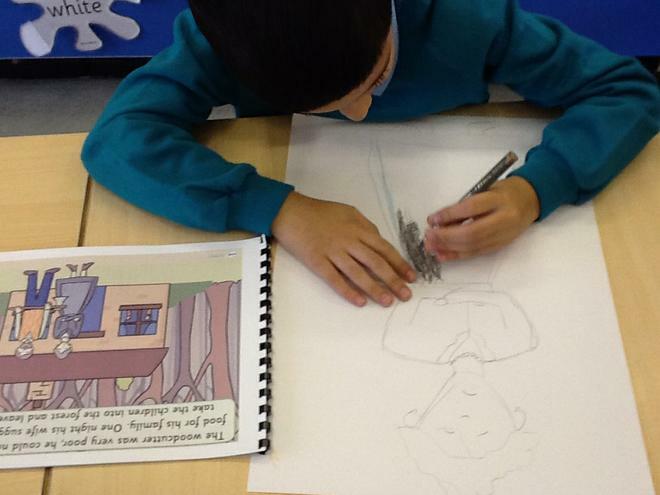 In literacy our focus is on the traditional tale 'The Three Little Pigs'. 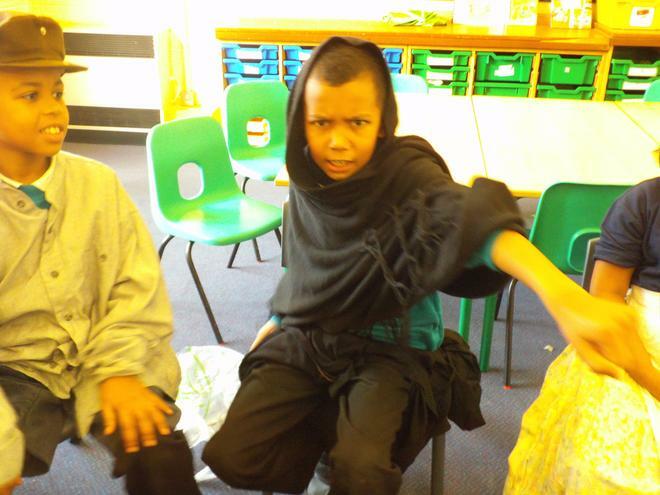 We will be learning the repetitive verses from the tale, doing some character hot seating, learning the Three Little Pigs song and doing lots of drama acting out the tale, as well as looking at non-fictions texts about pigs, wolves and houses!!! 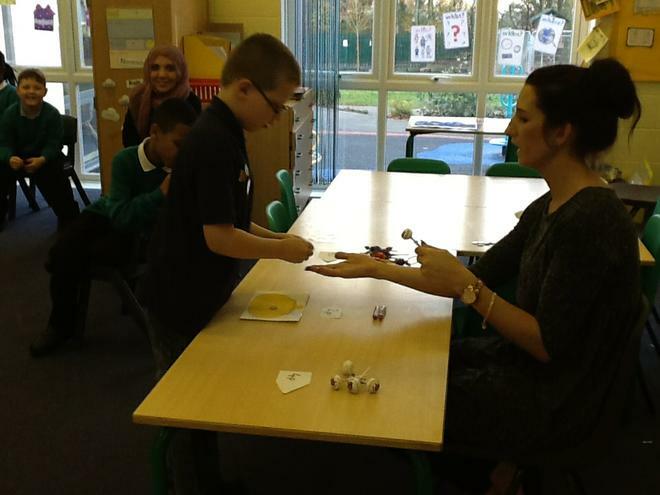 Our ICT focus for this half term is learning to use the beebots and remote control toys starting off with the WII. 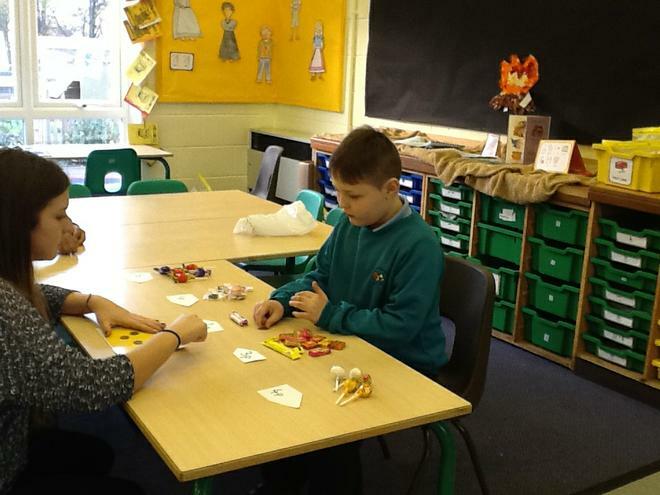 We will be covering all areas of numeracy and focusing on numeracy games to teach us dice skills as well as turn taking and playing by rules. 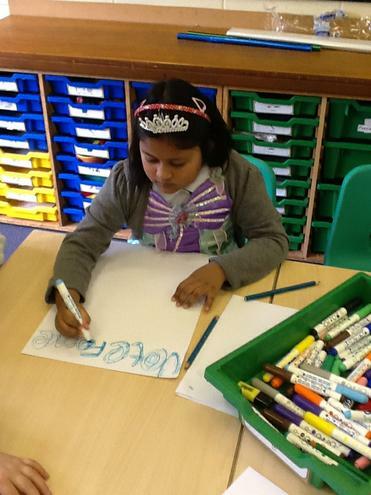 As you can see we have a busy term ahead! 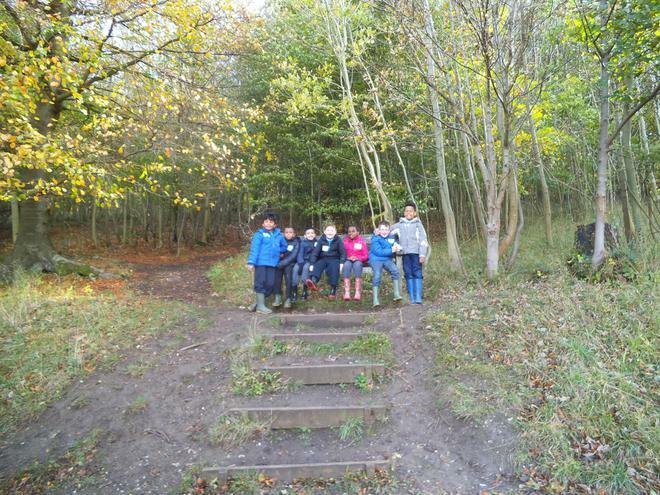 Keep looking back to see the children's hard work and photographs of where we have been and what we have been up to! 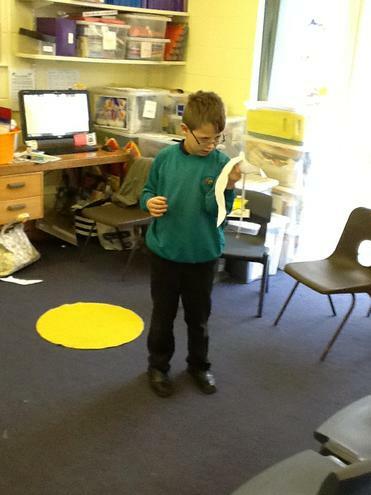 Alex used the puppet pals app on the iPad to recreate and tell the story of The Three Little Pigs. 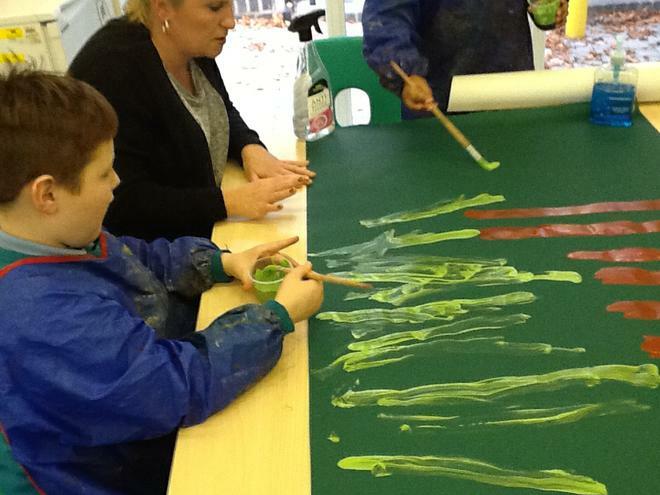 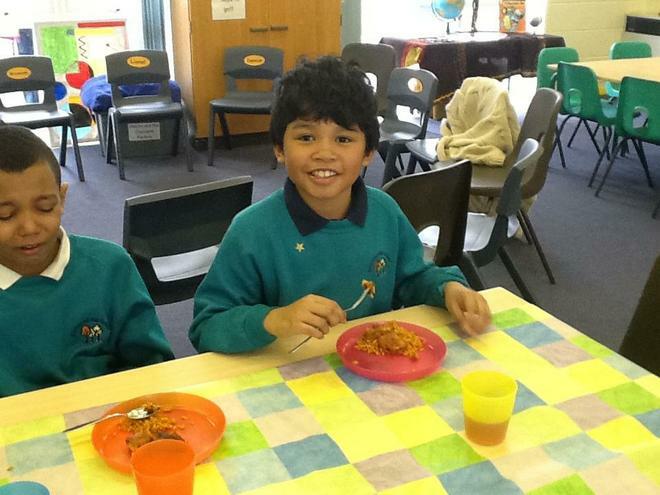 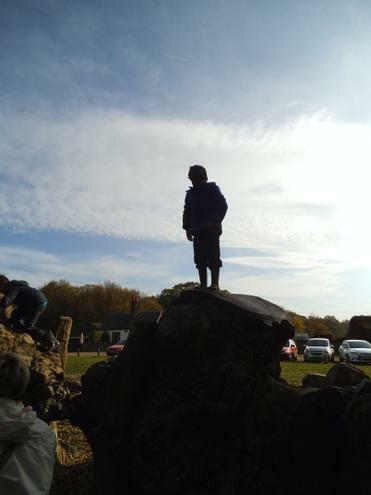 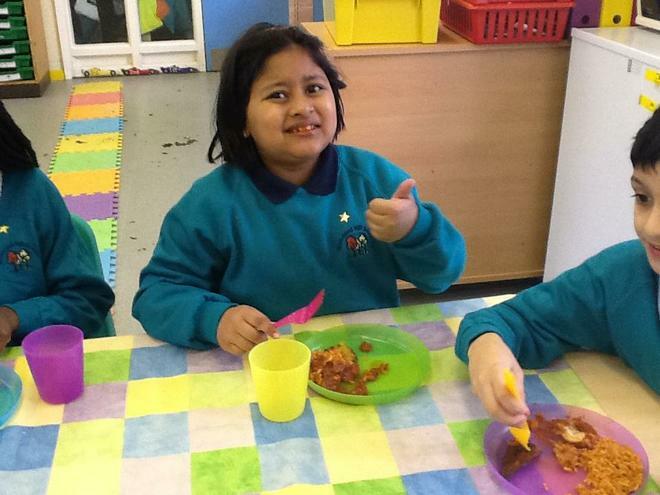 What an exciting half term, the children have all settled in well and have worked very hard. 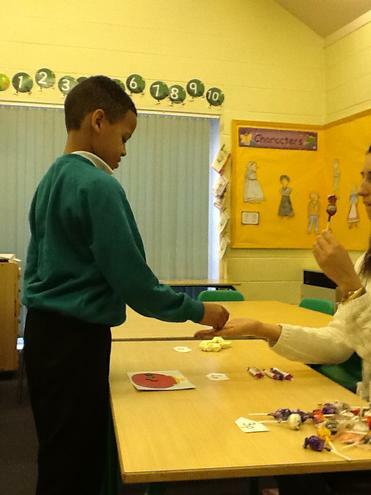 We have learnt all about the traditional tale- The Three Little Pigs. 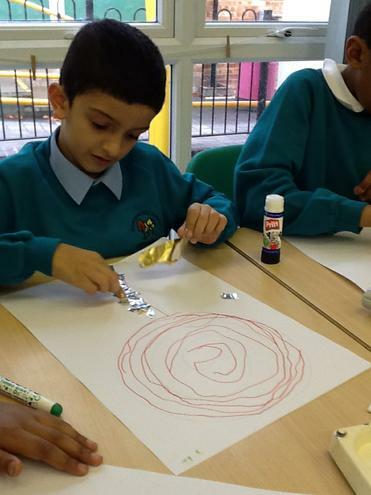 The children acted out the story, learnt signs and symbols associated to the tale, met the big bad wolf, made 'Wanted' posters, learnt the repetitive verses and made some fantastic pictures of the characters. 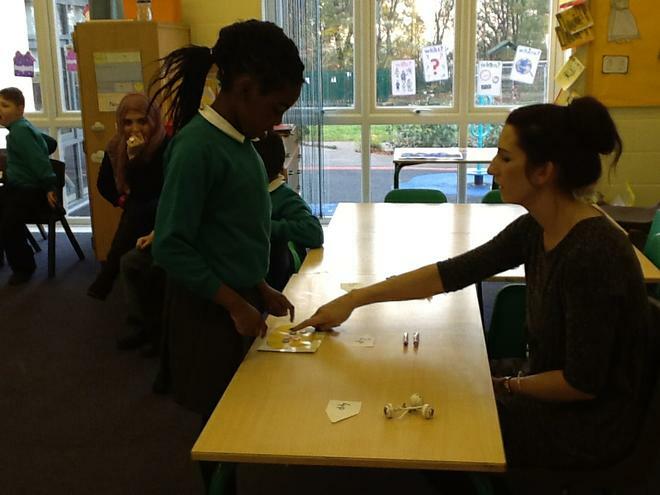 The little pigs even helped us learn about length, height and size in numeracy. 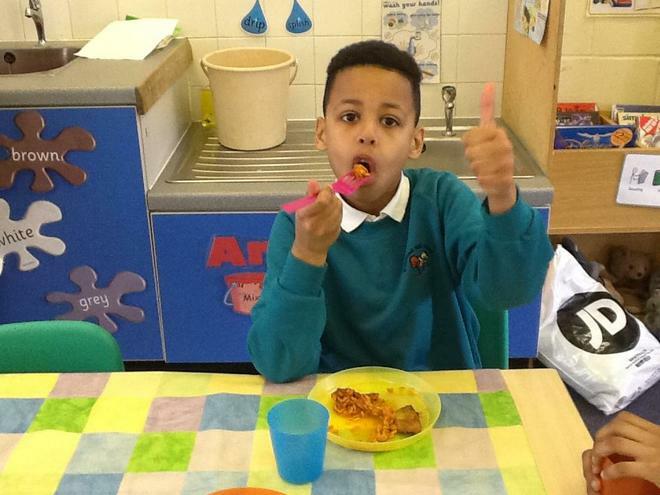 We have baked some delicious fruit based cakes to encourage the children to try new foods. 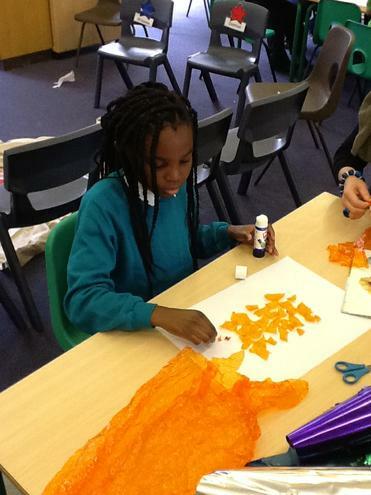 A favourite being a mango and passion fruit roulade!! 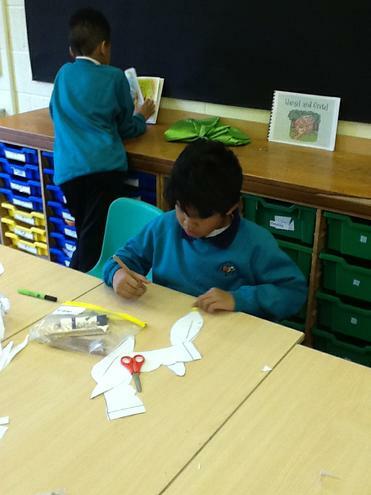 This week we have focused on the story Room on the Broom by Julia Donaldson. 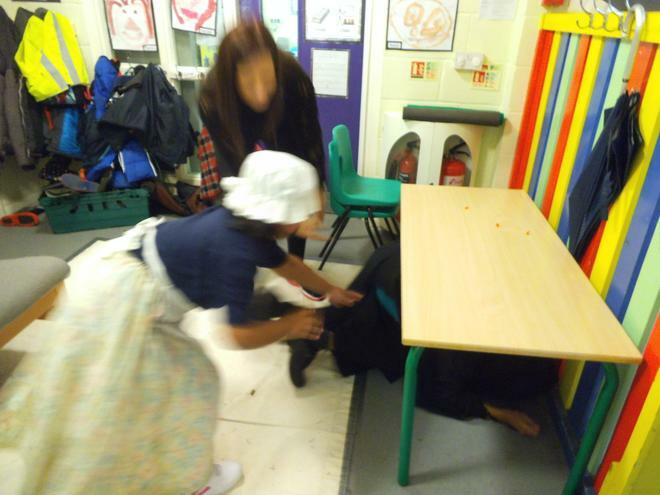 A rhyming story about a witch and her broom. 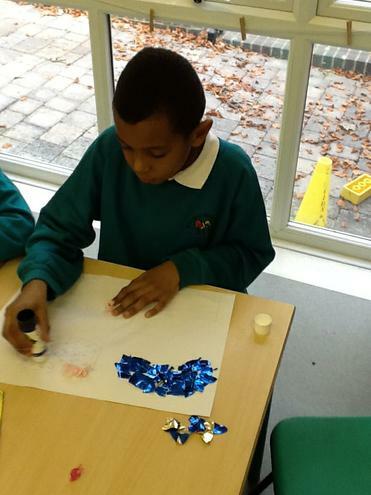 The children have made an activity book and written their own witches potion recipe and made it with the ingredients! 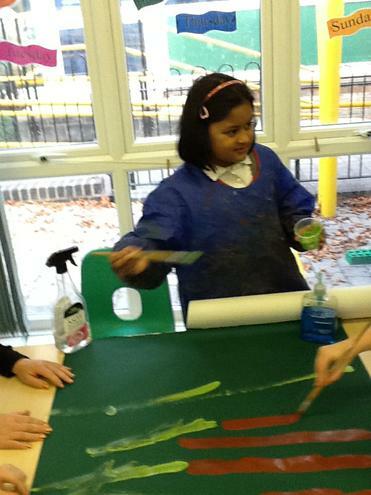 We even turned Rosa into a frog!!!! 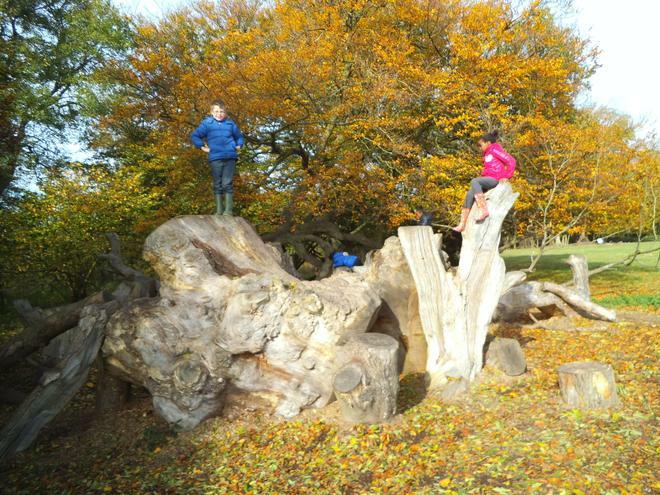 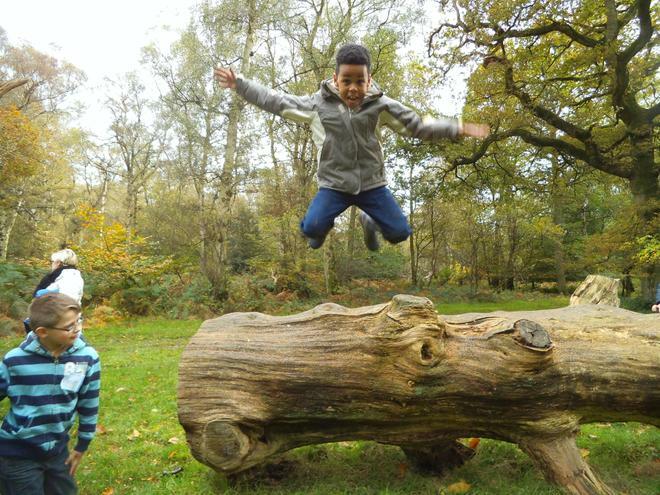 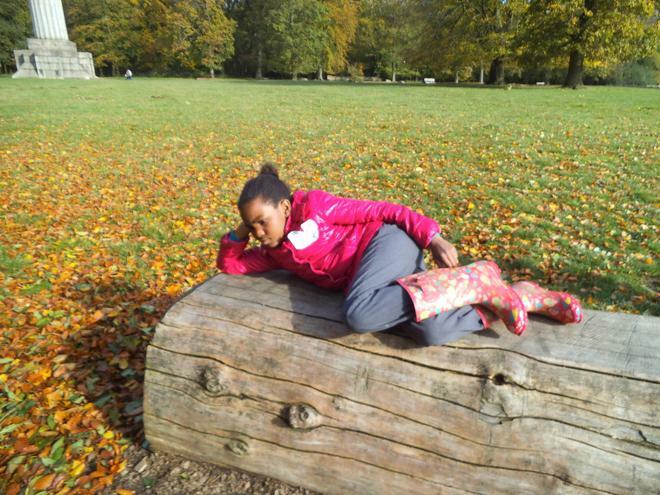 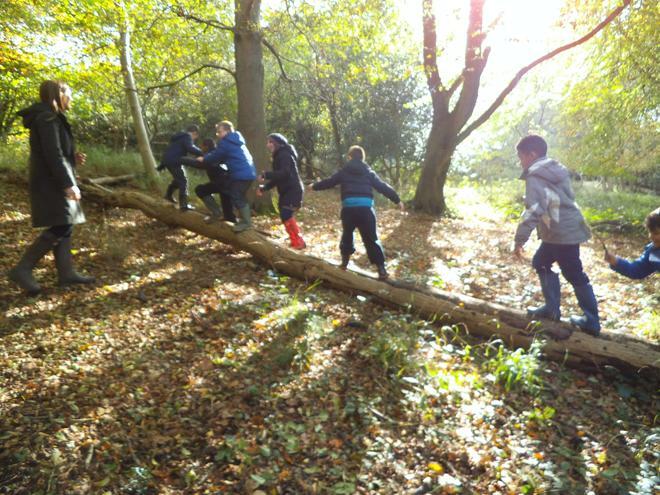 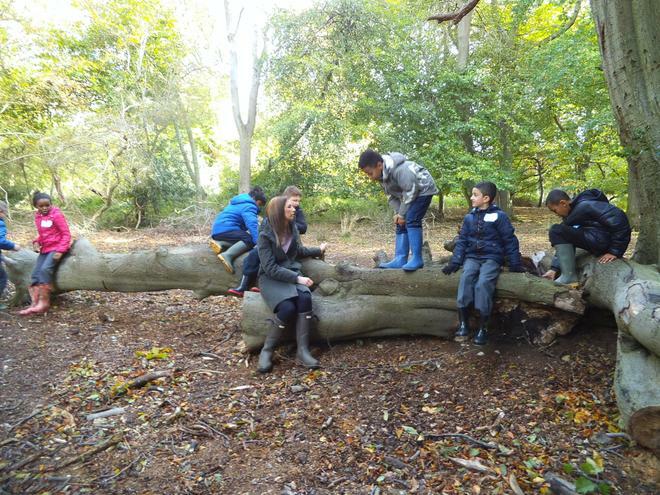 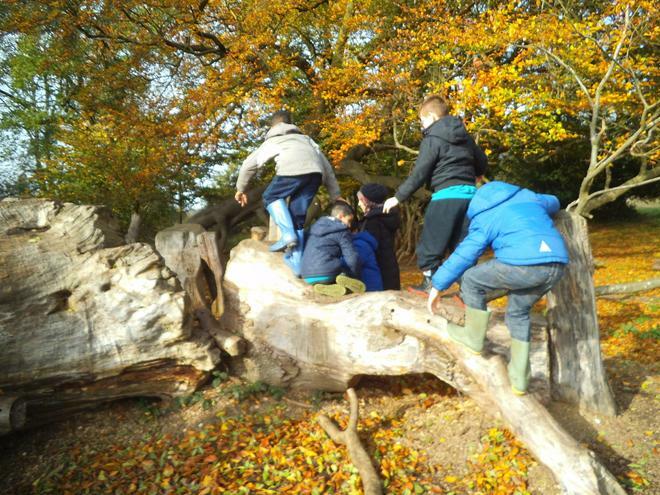 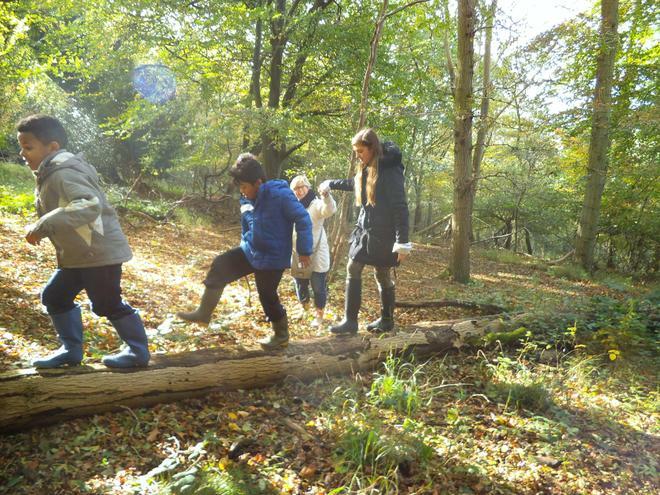 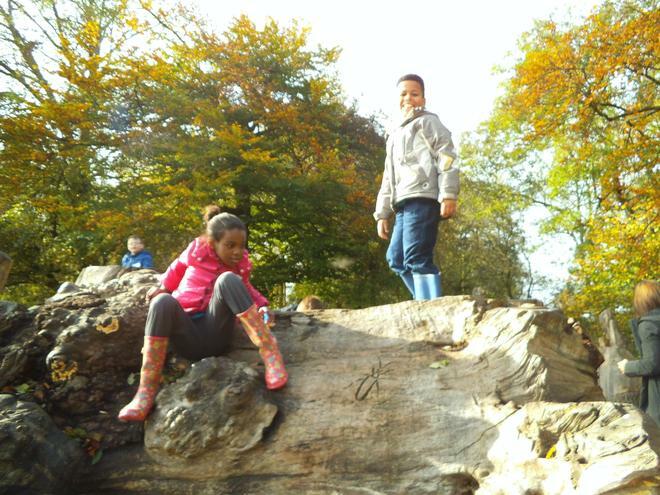 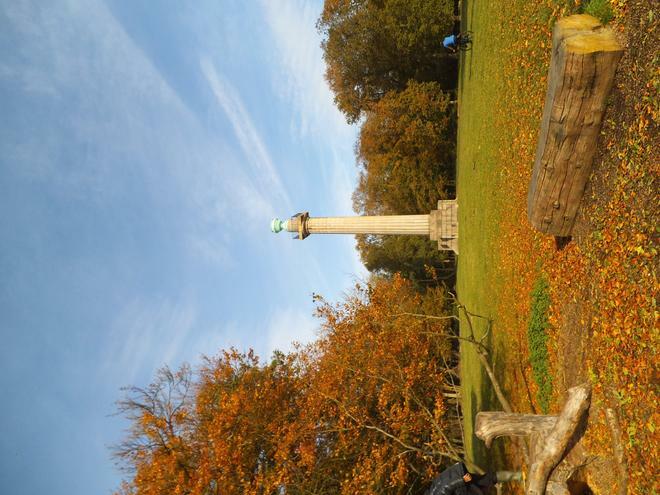 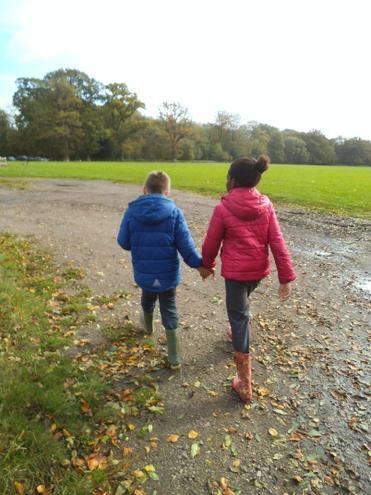 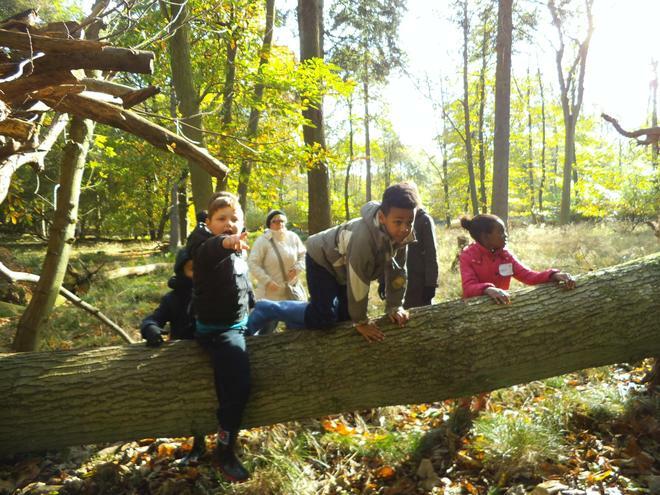 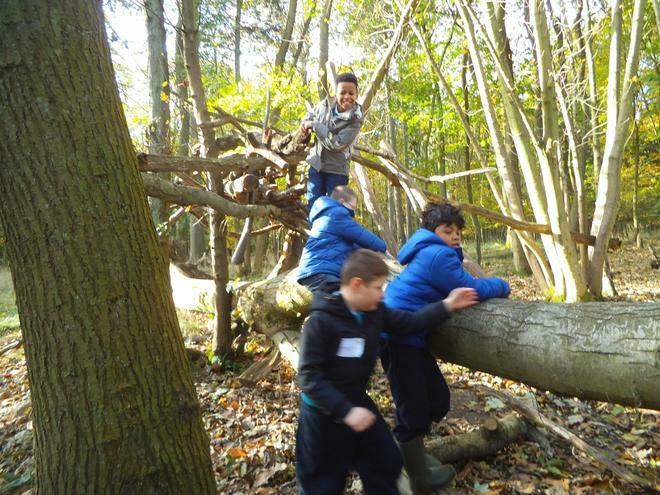 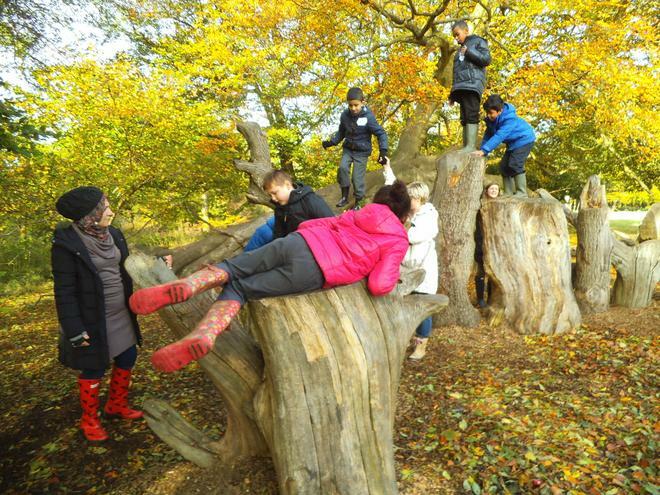 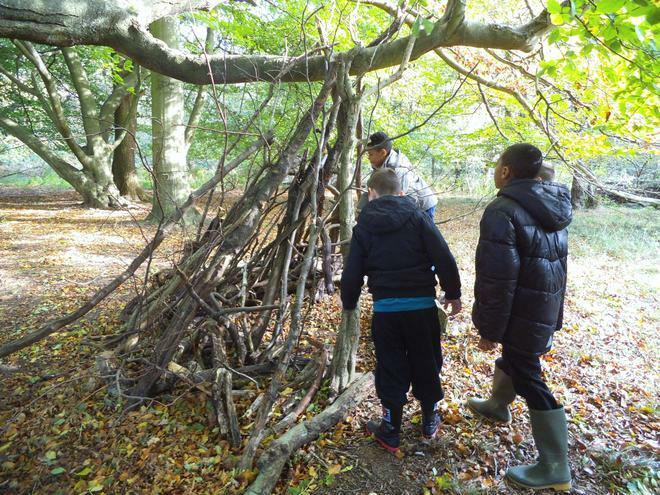 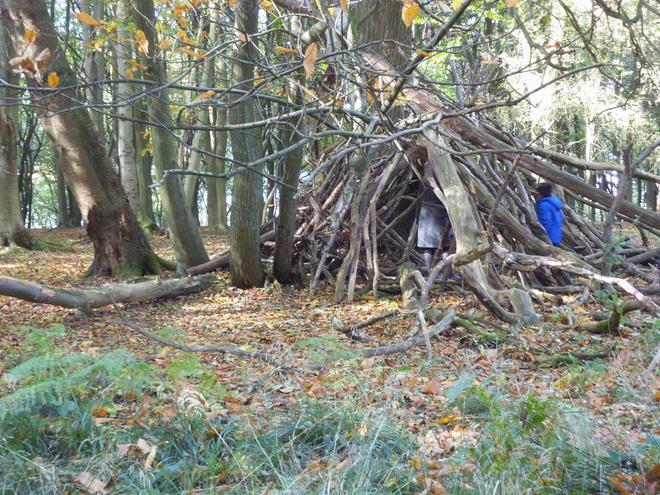 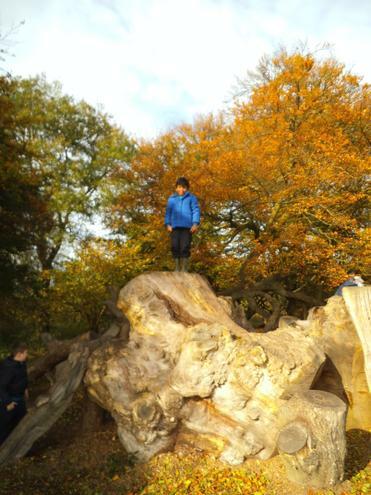 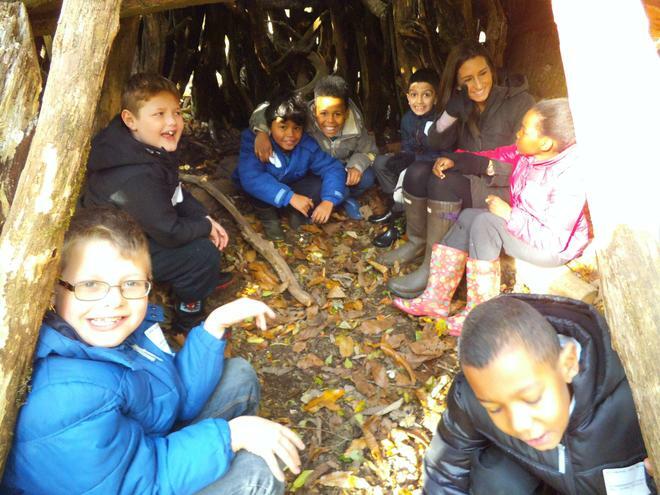 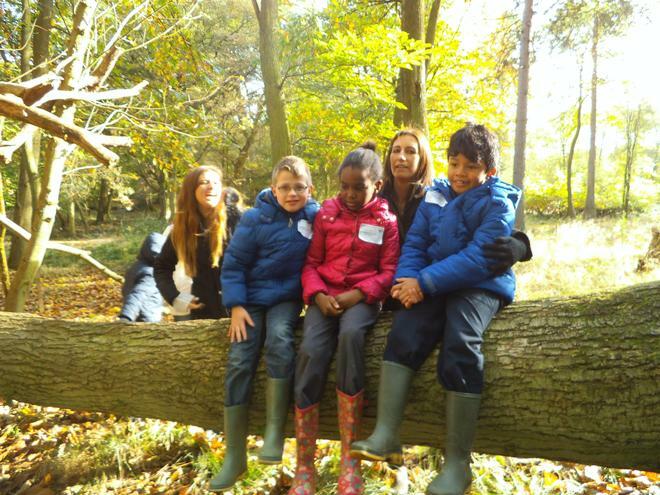 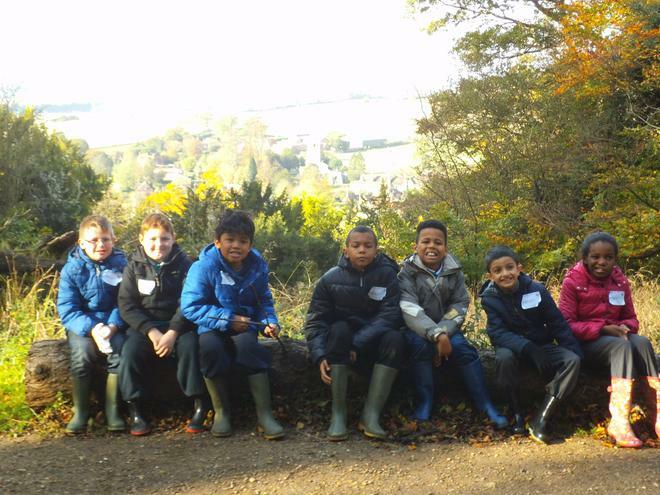 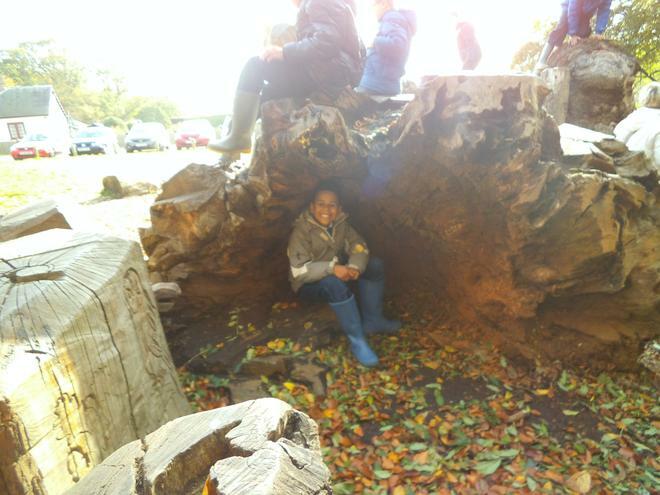 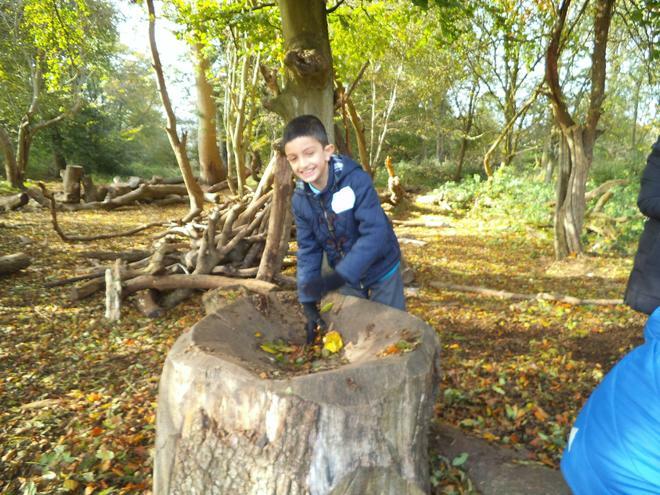 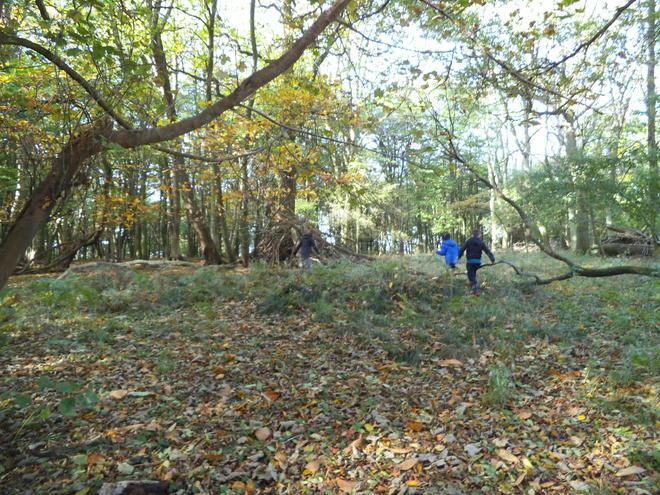 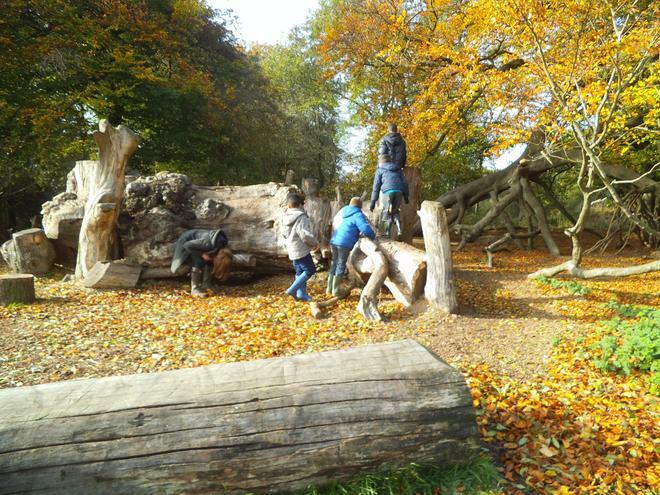 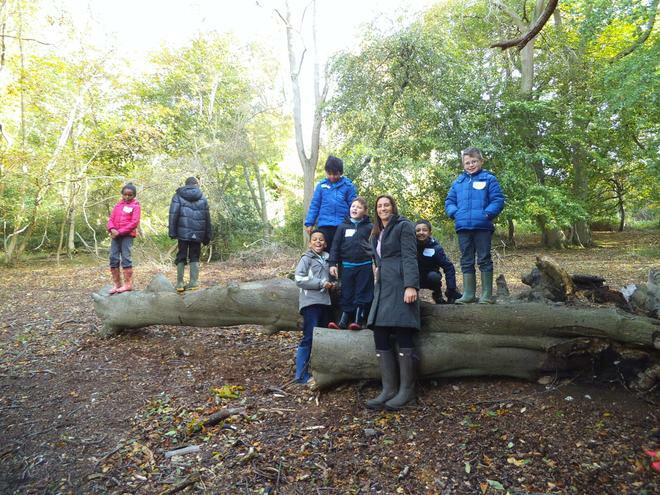 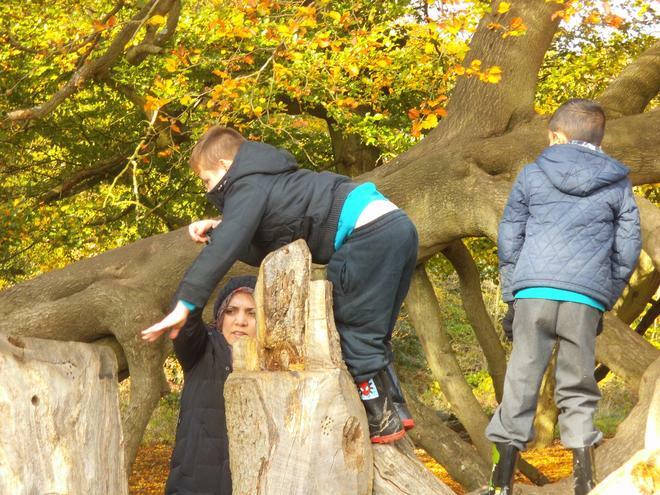 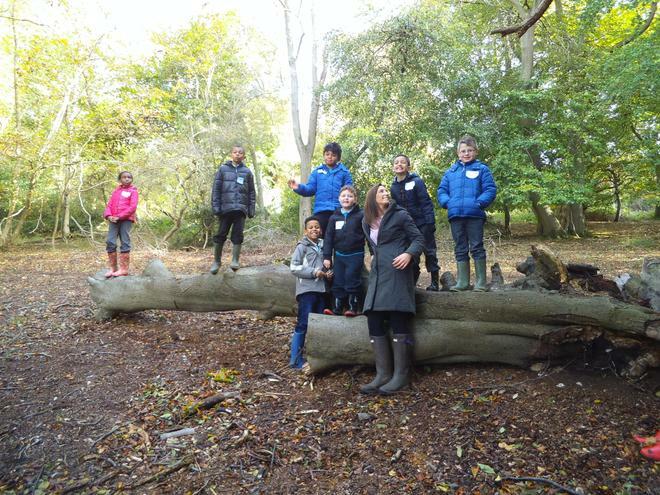 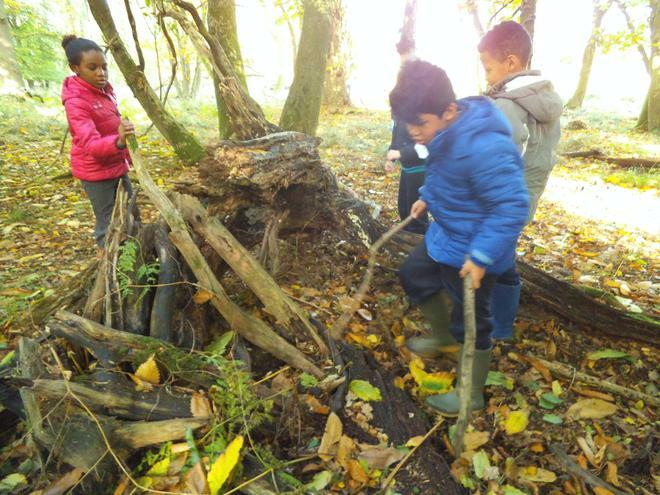 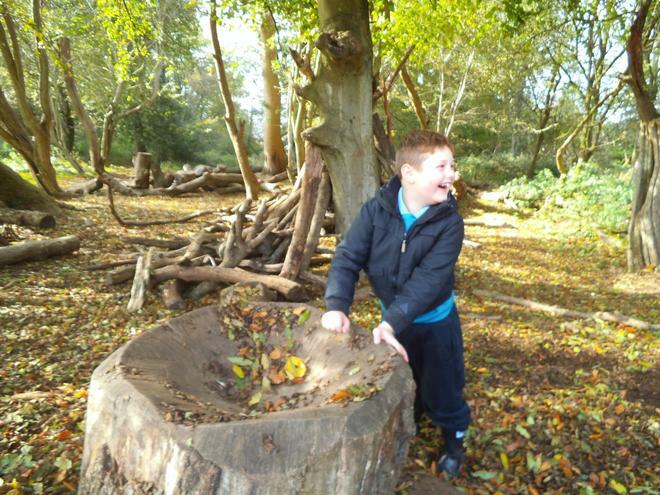 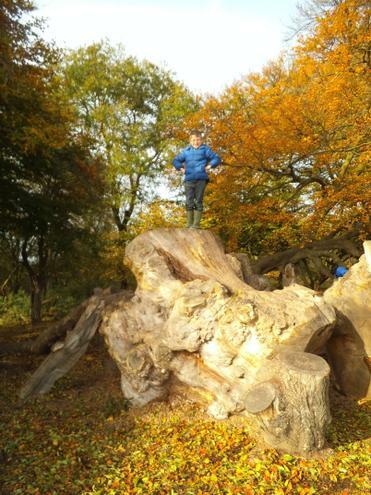 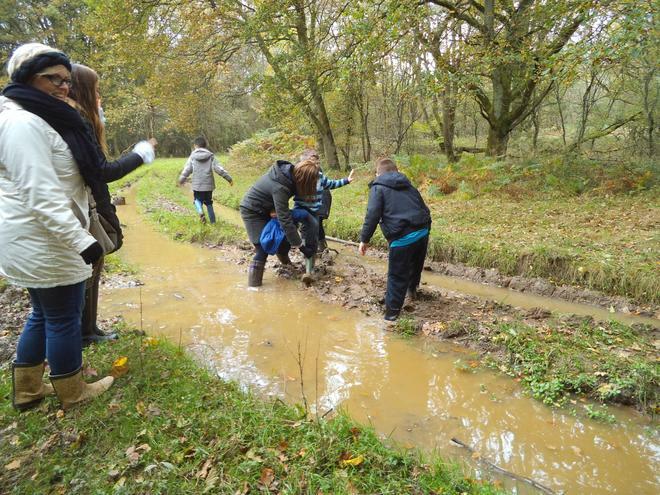 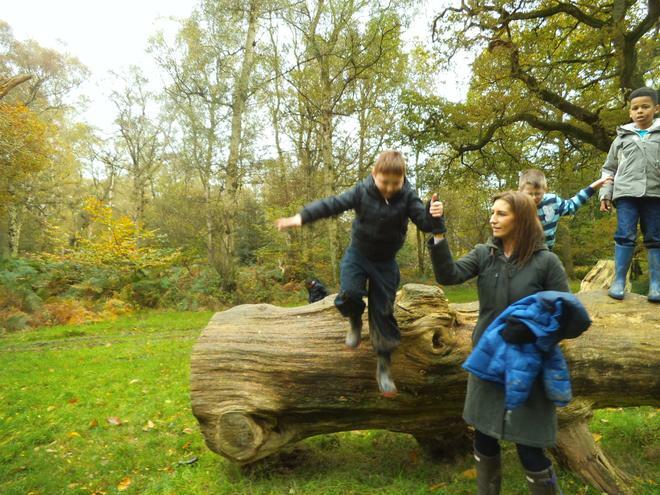 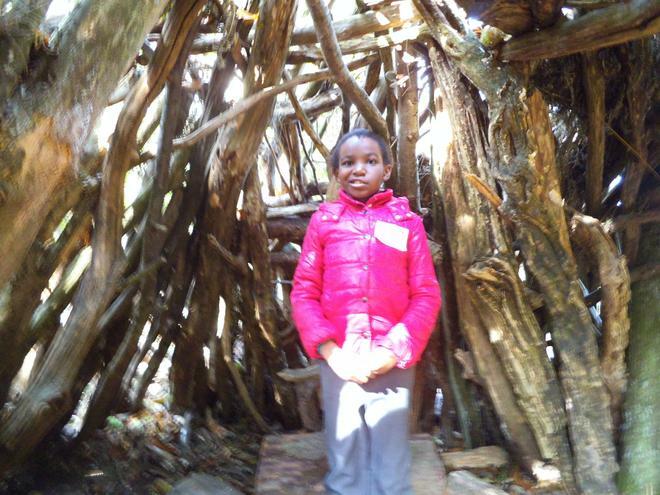 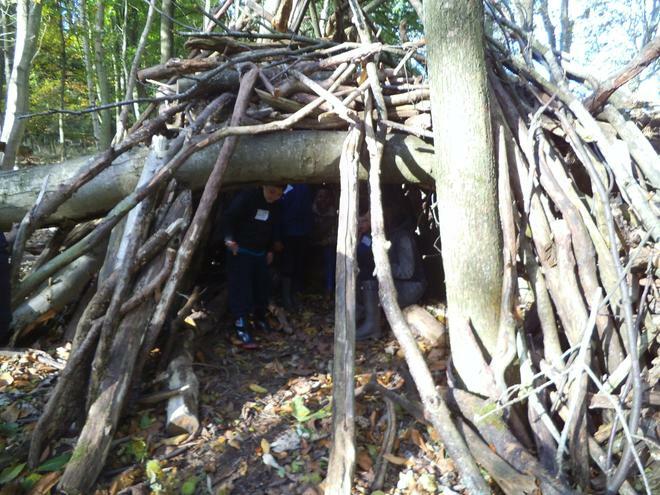 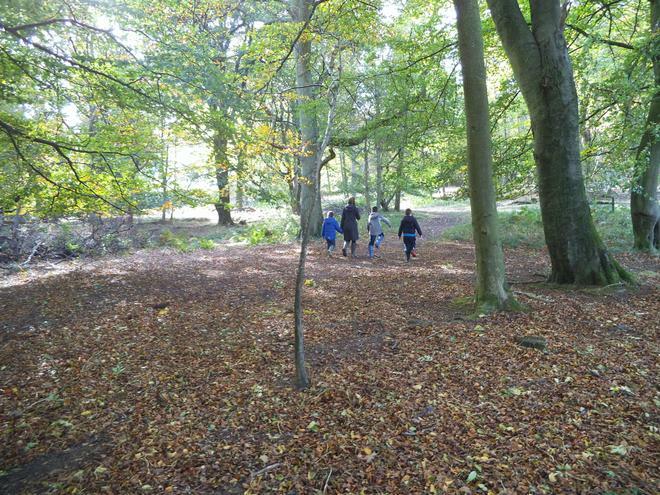 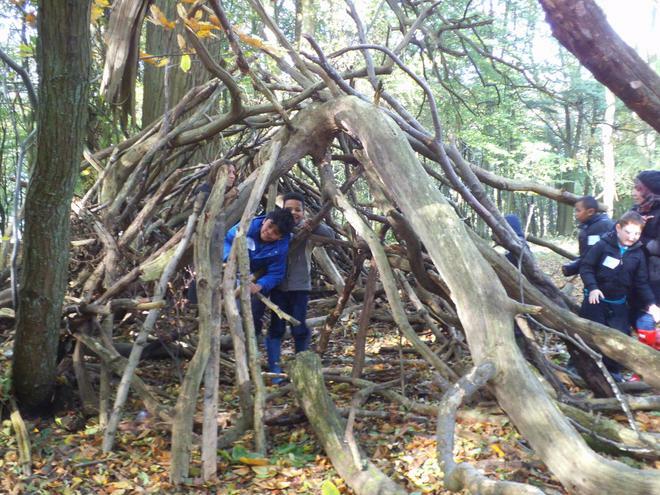 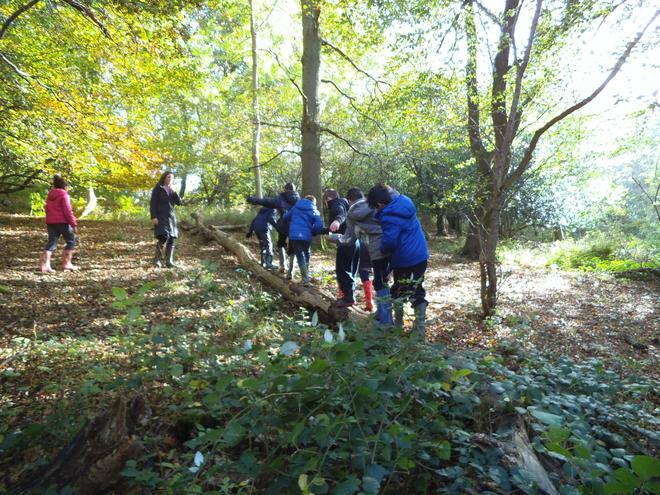 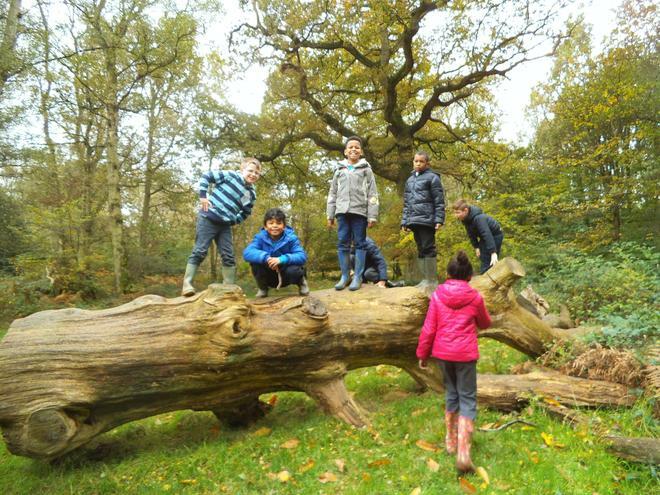 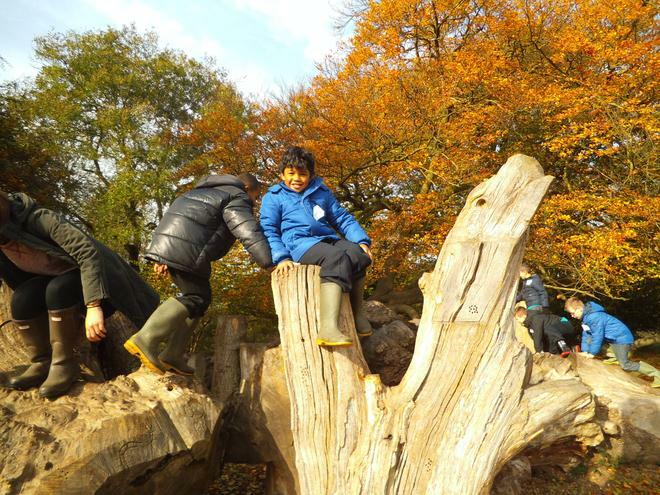 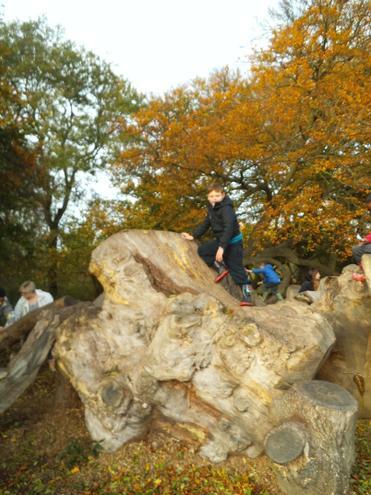 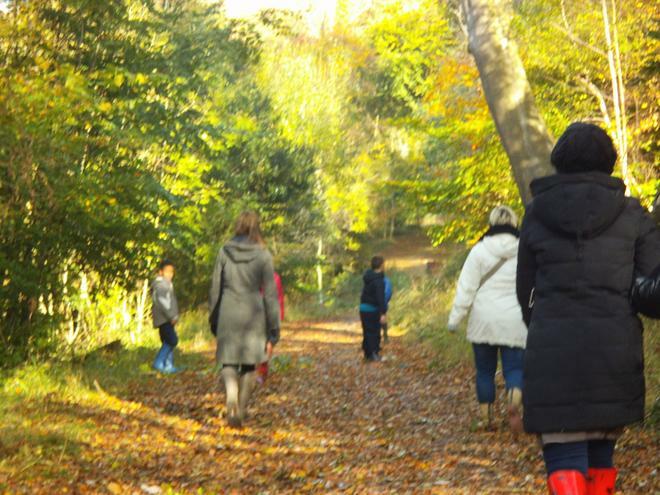 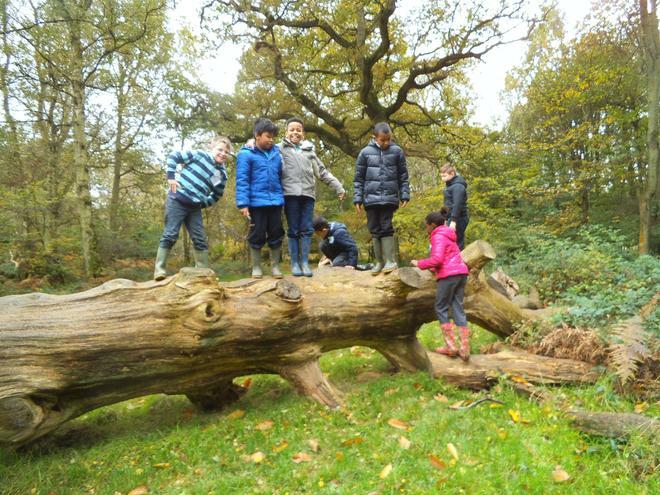 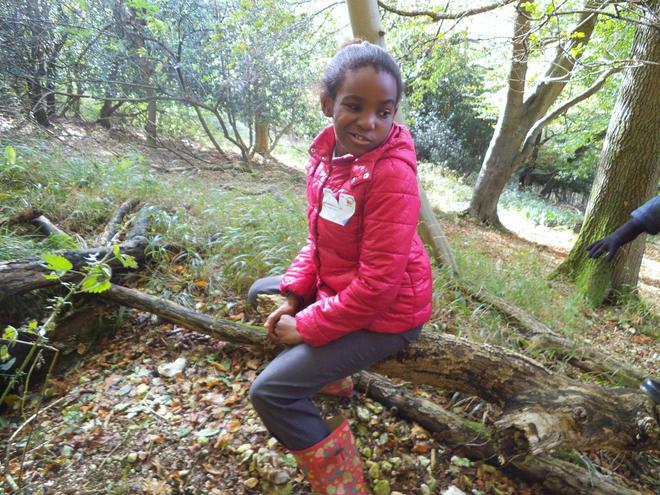 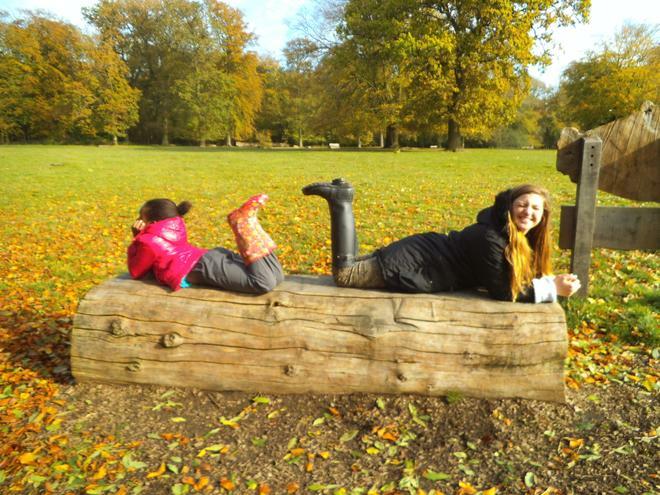 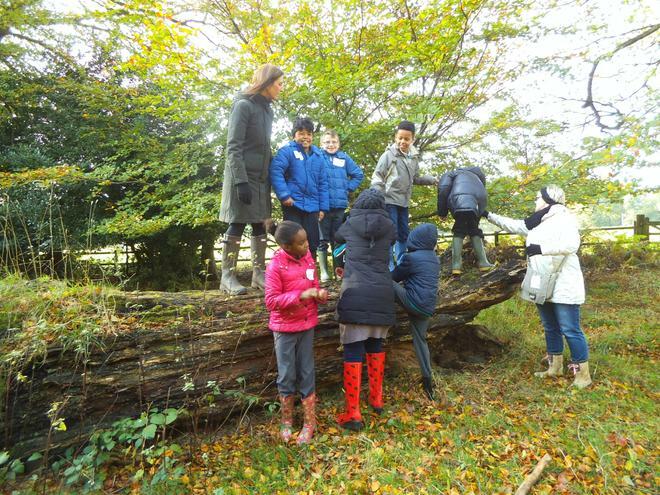 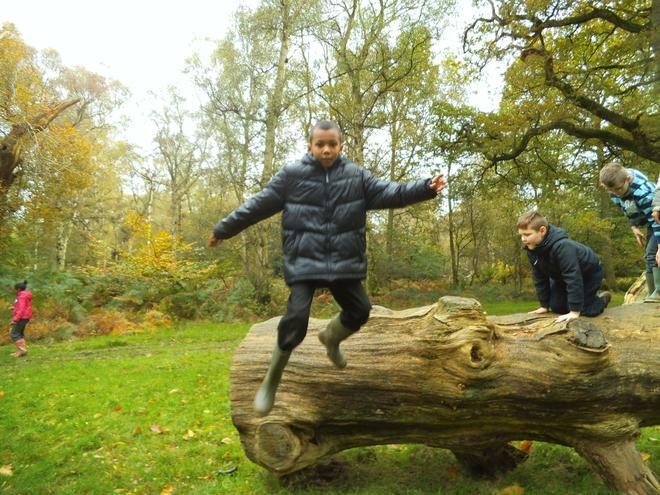 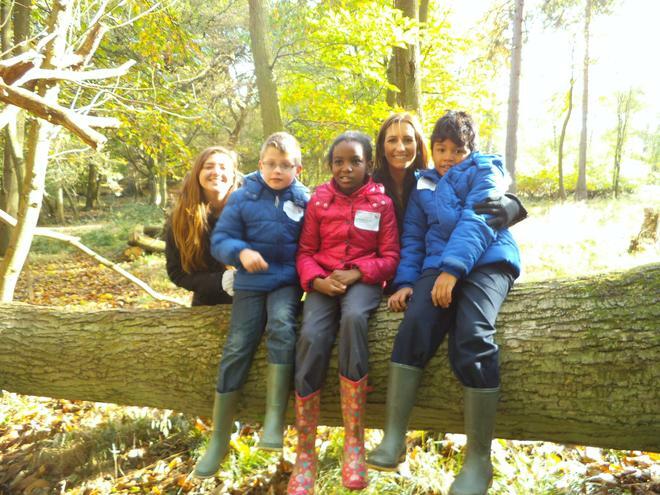 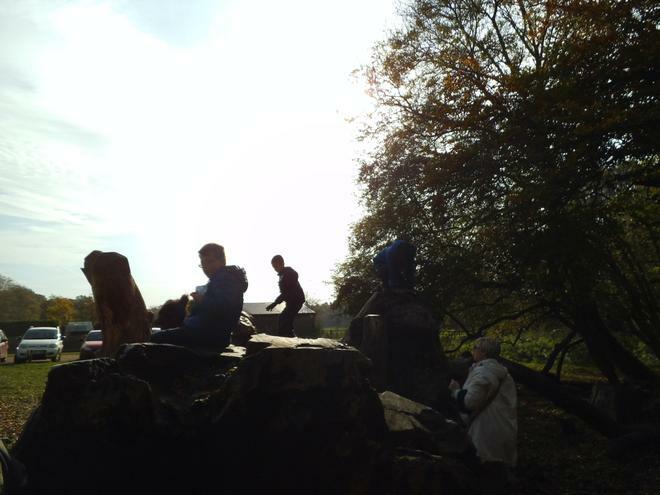 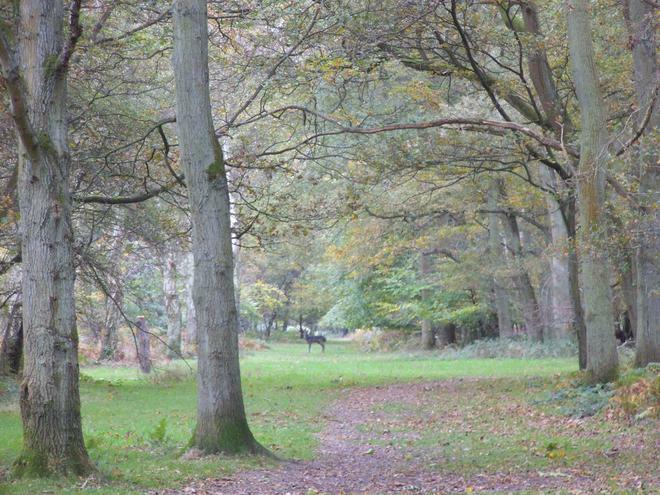 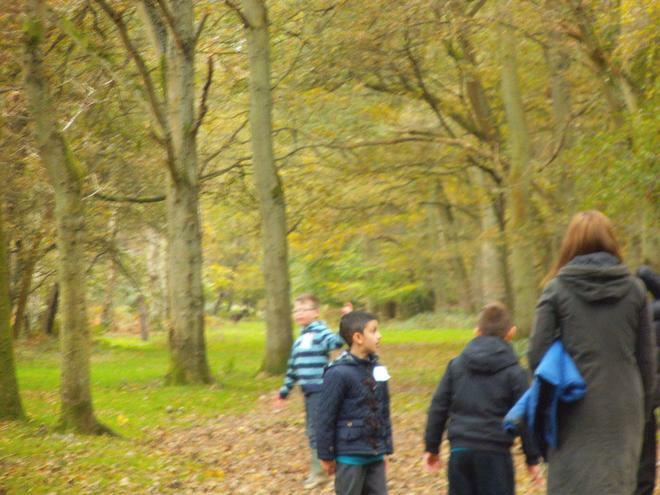 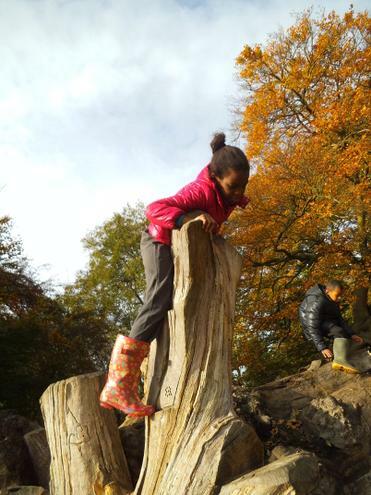 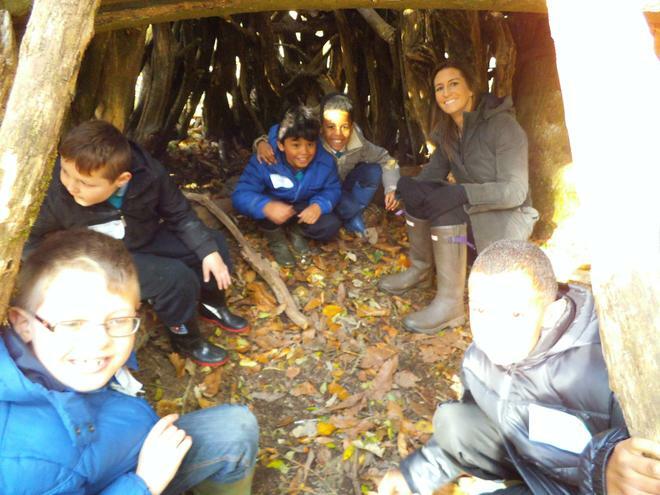 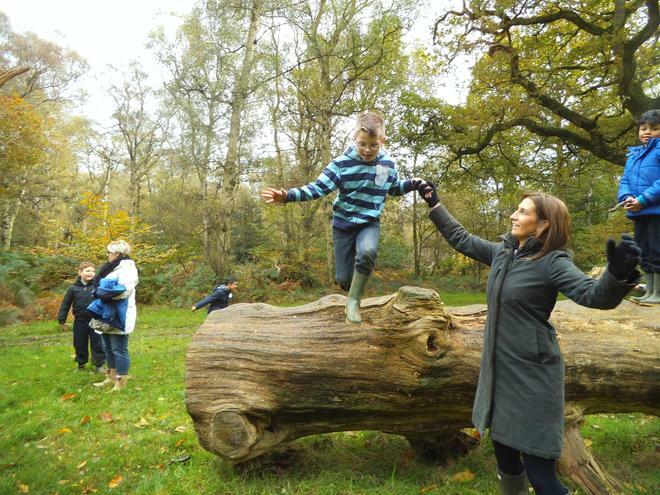 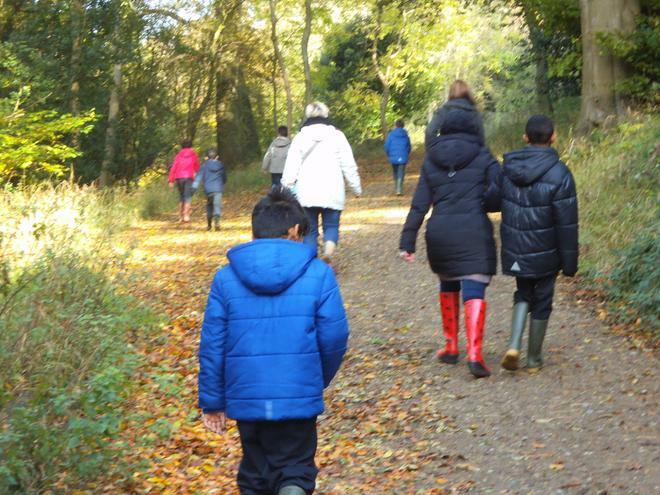 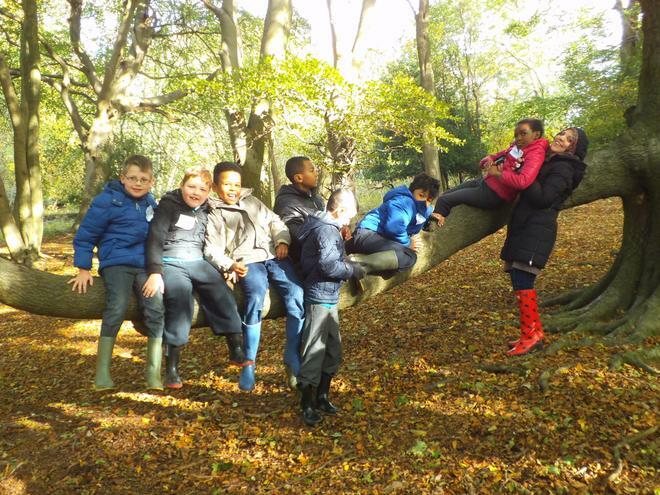 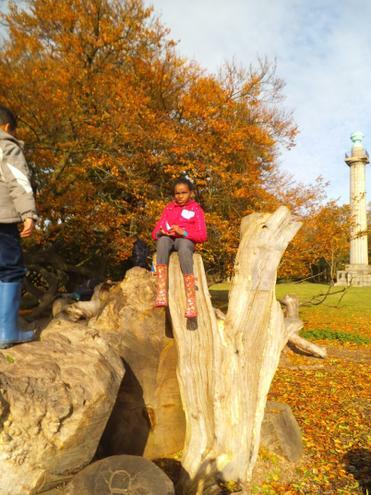 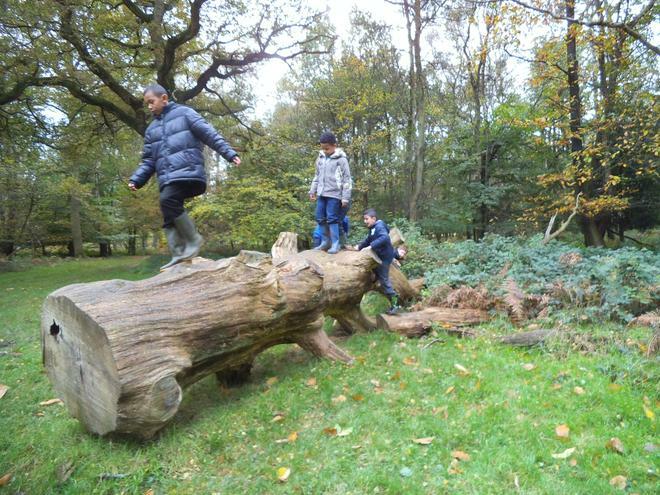 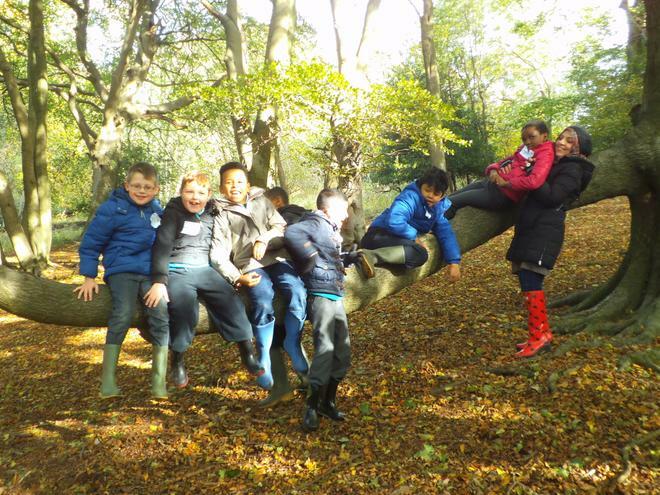 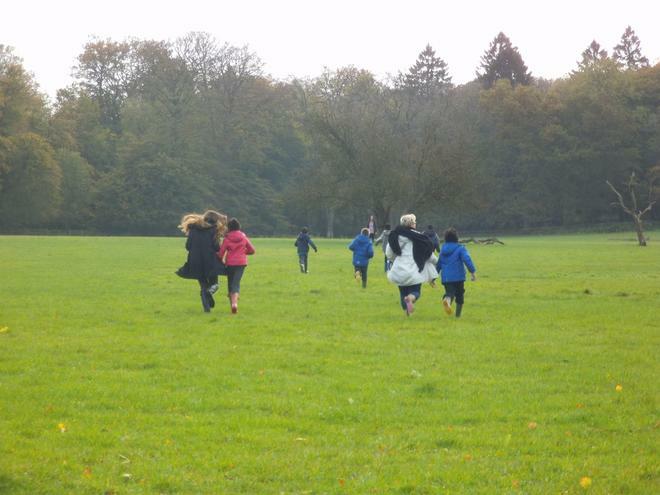 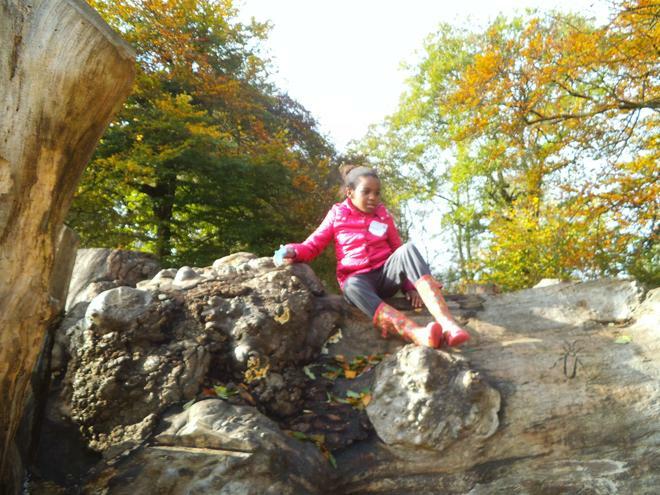 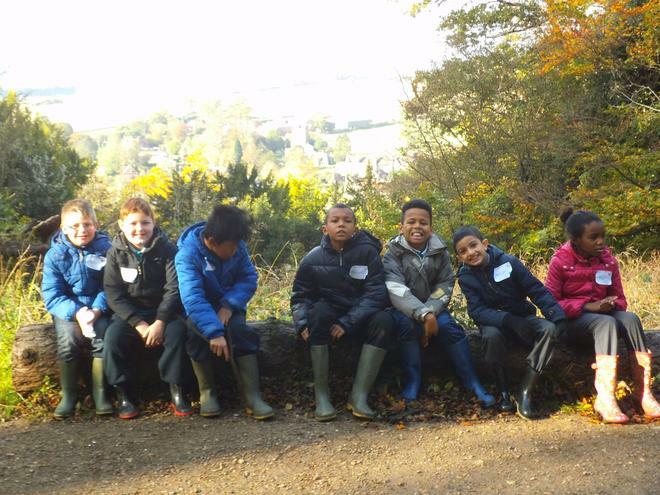 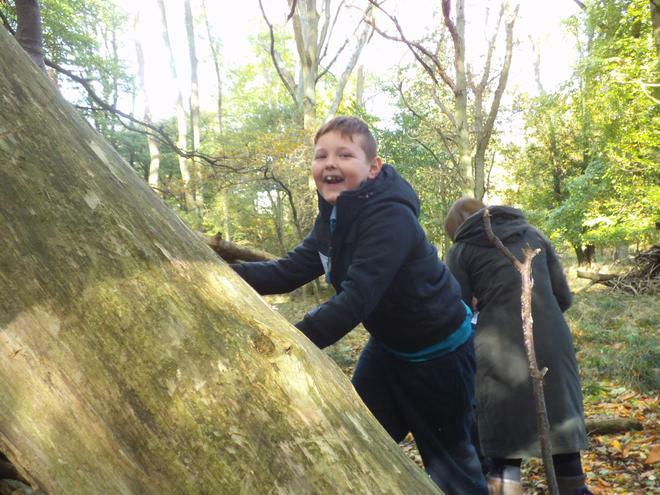 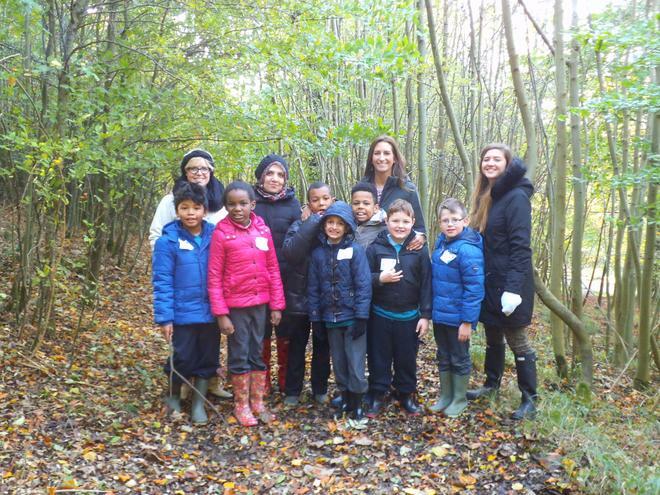 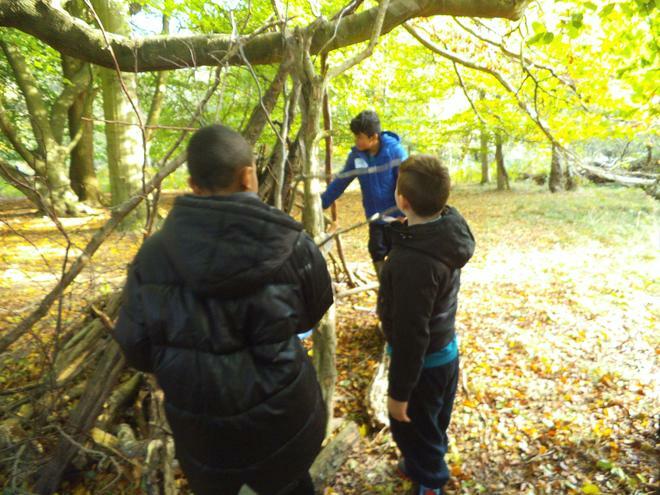 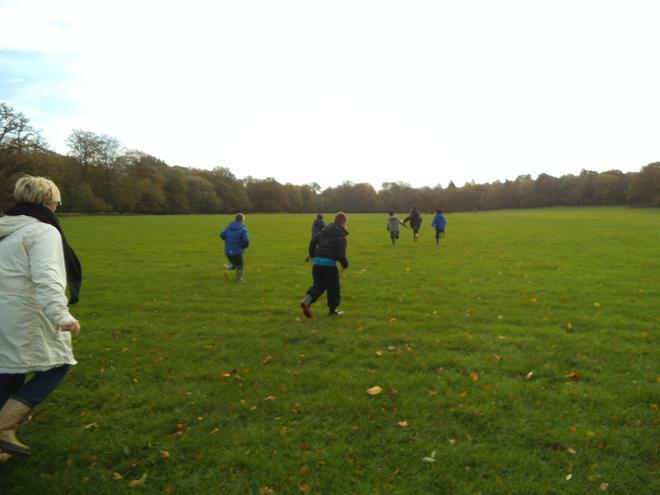 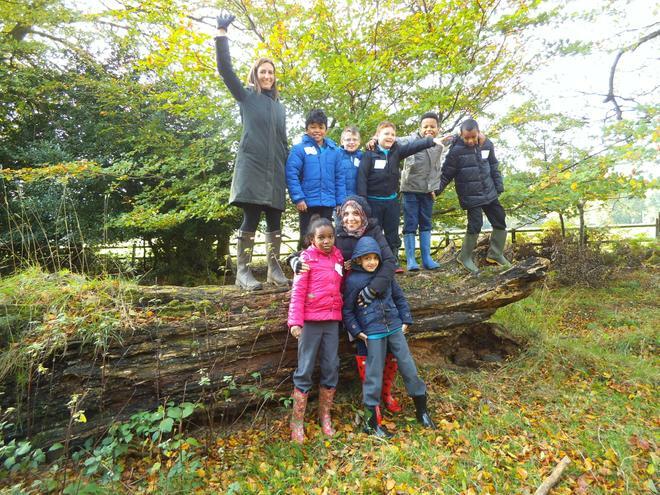 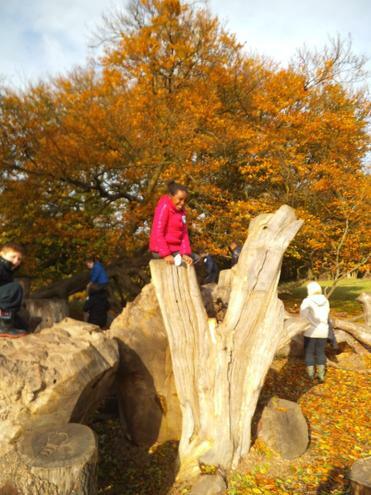 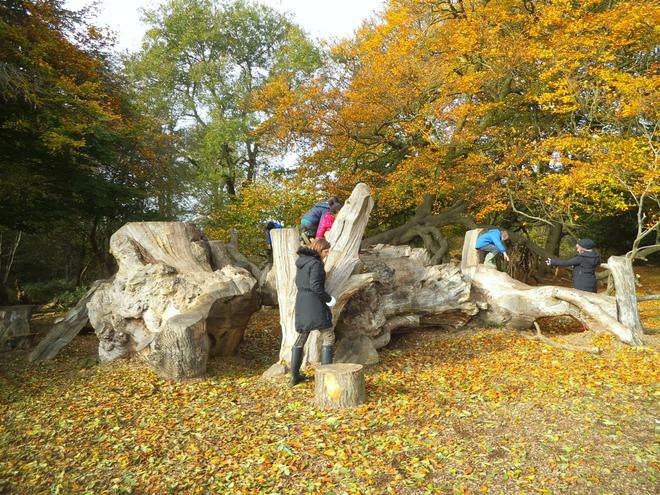 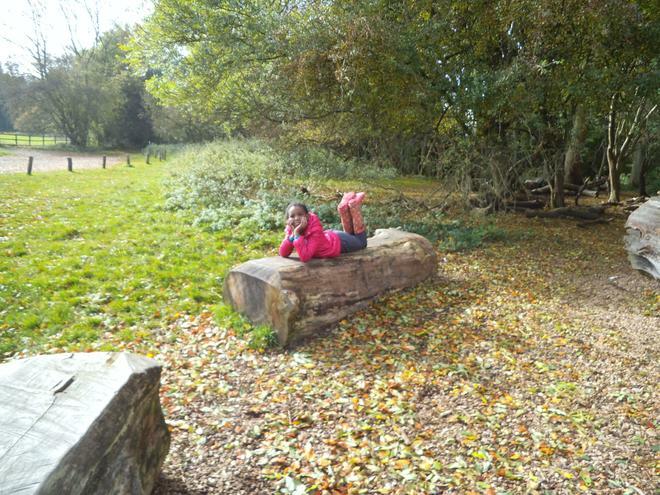 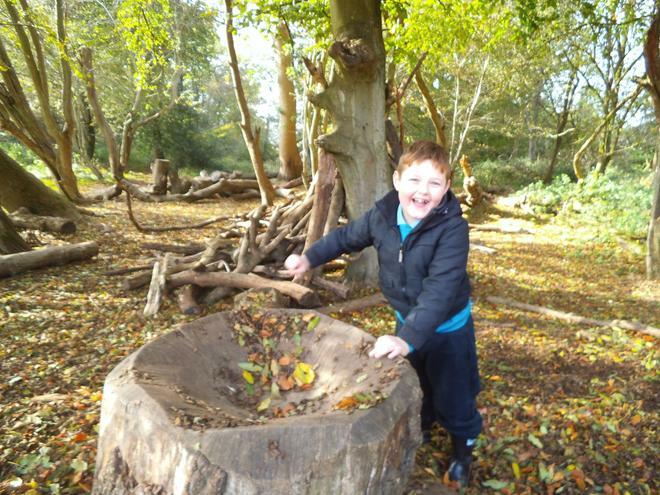 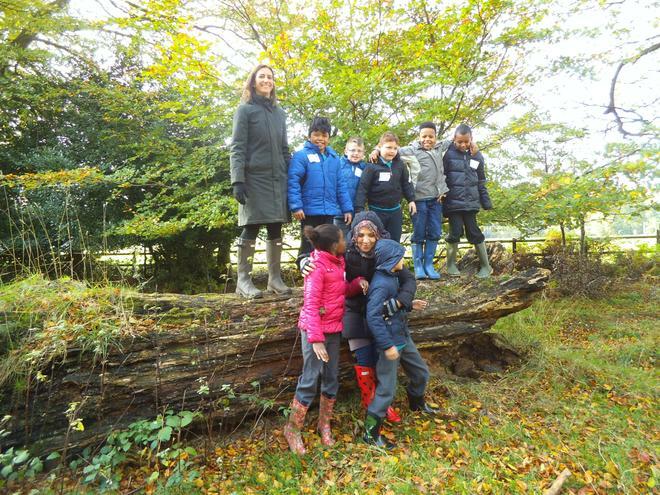 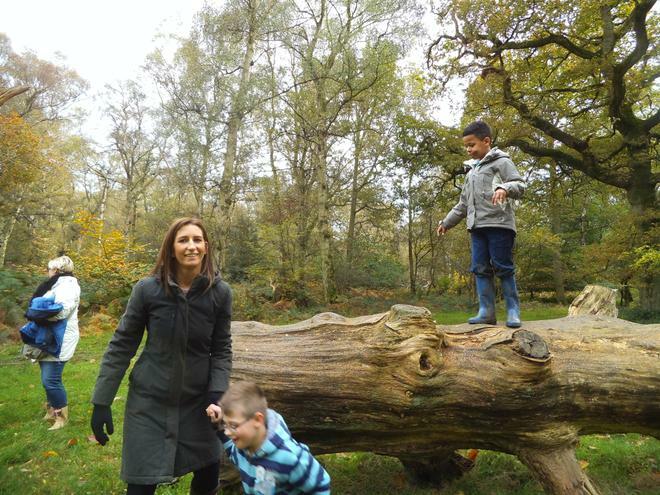 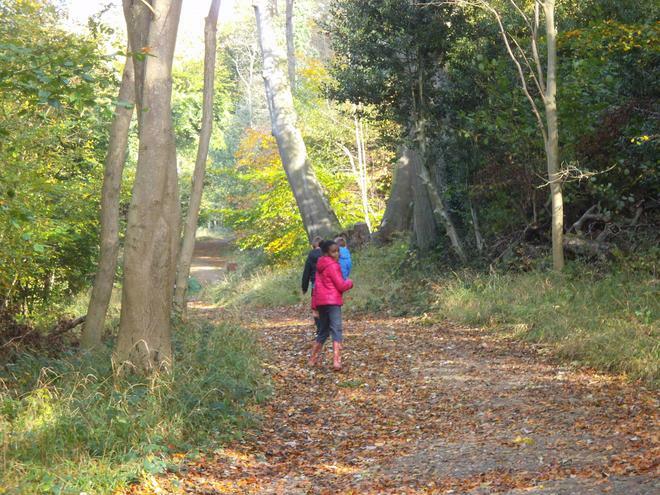 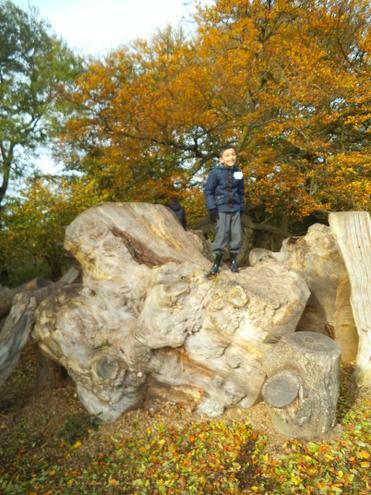 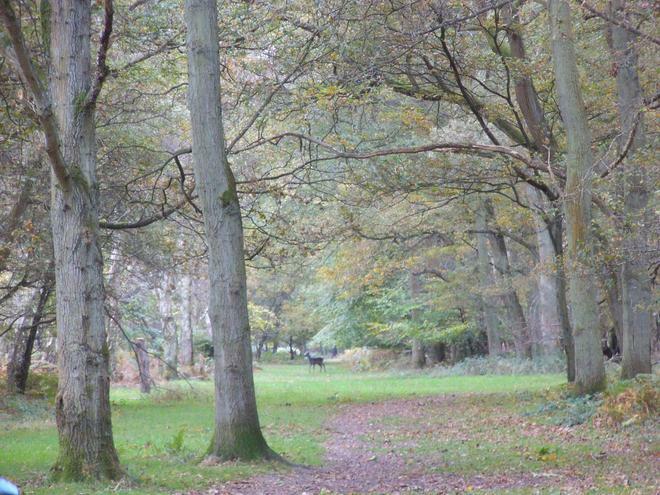 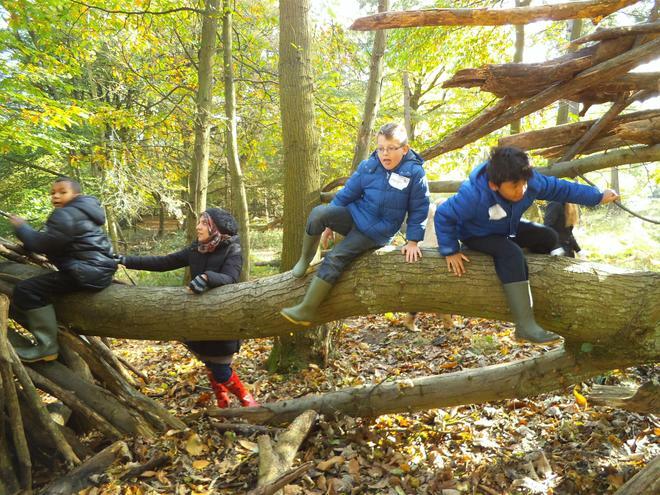 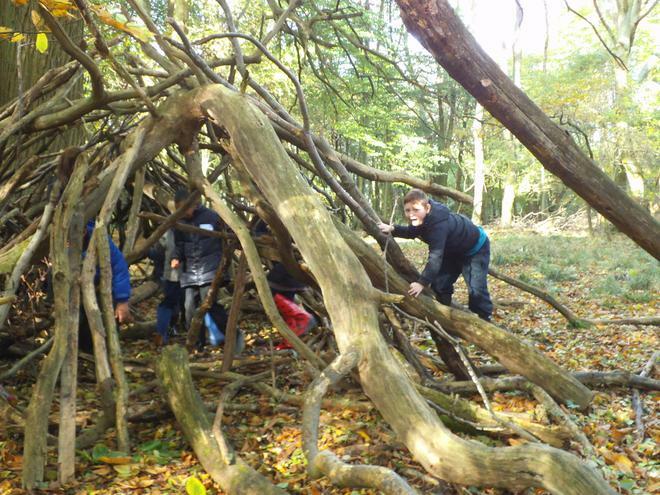 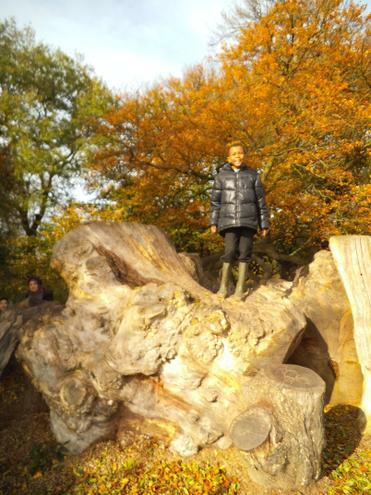 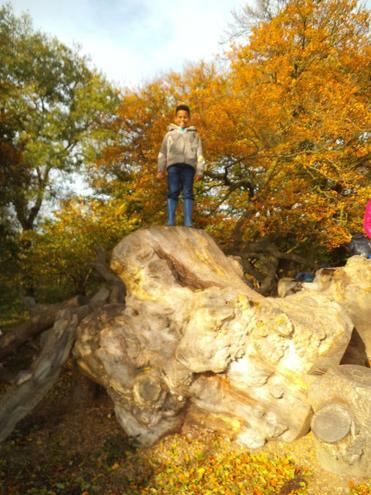 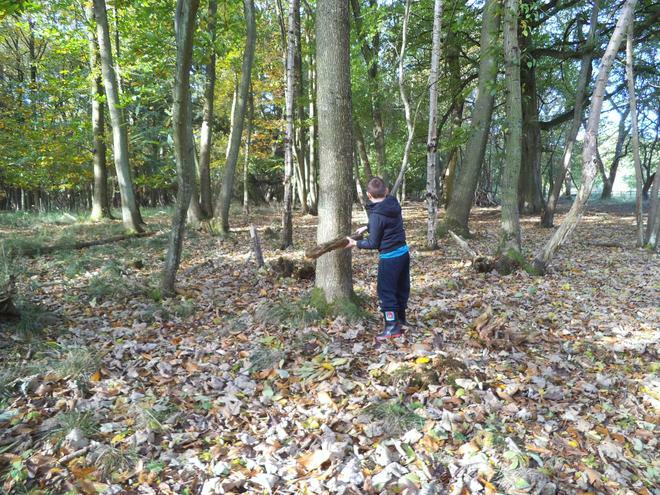 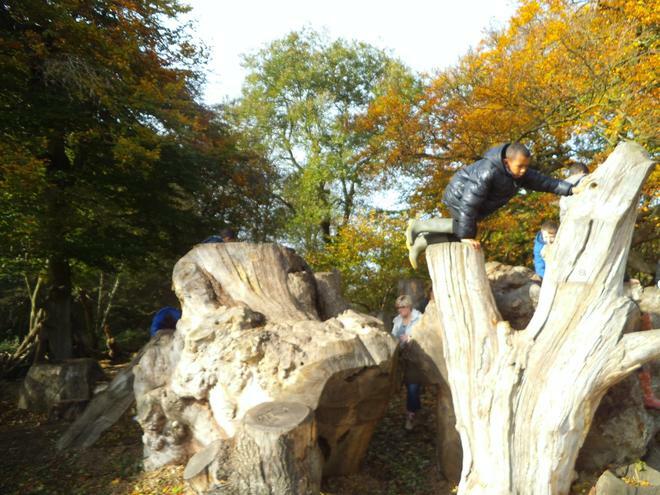 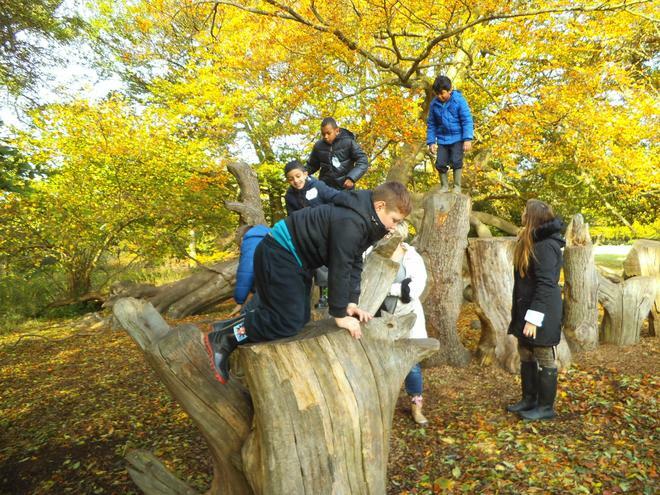 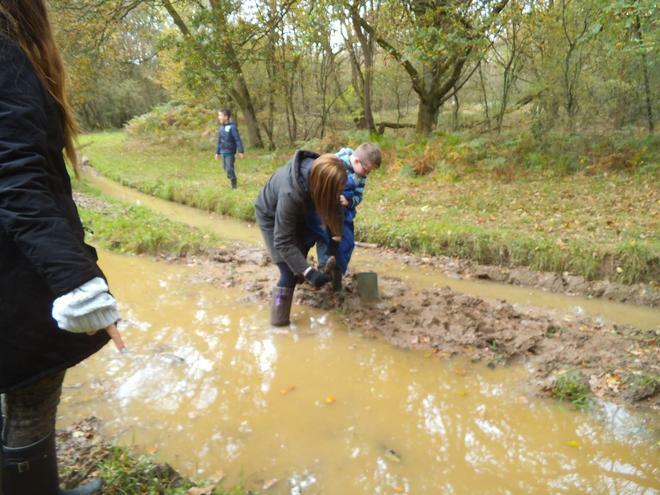 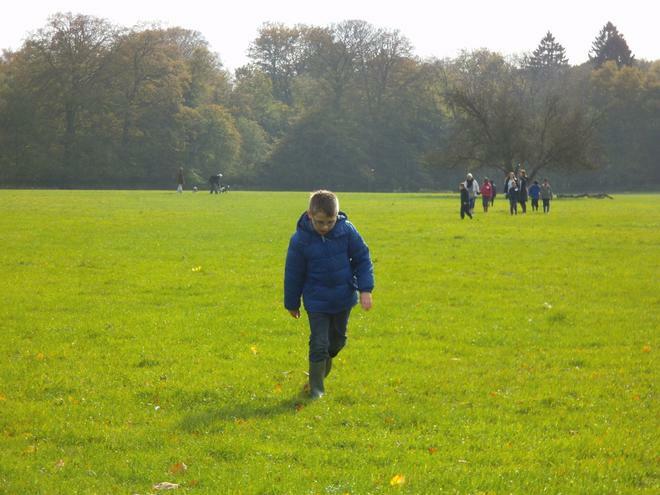 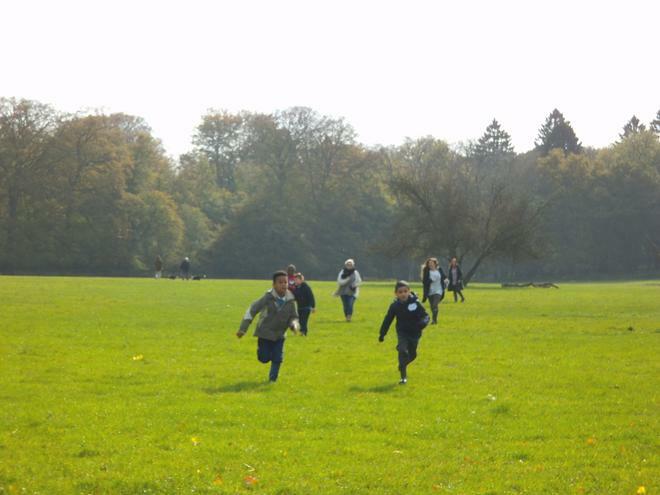 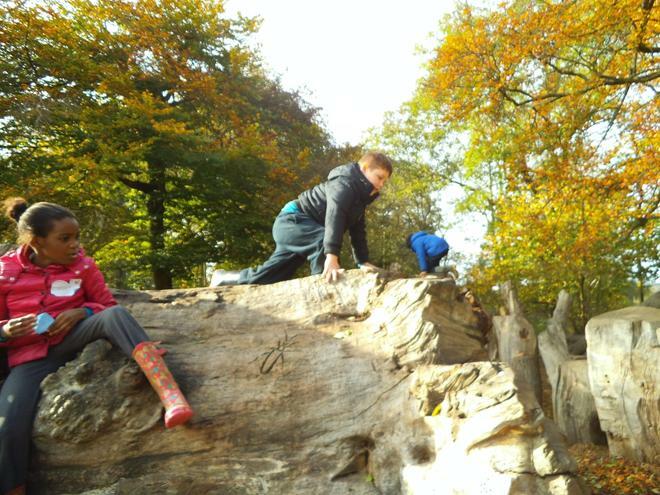 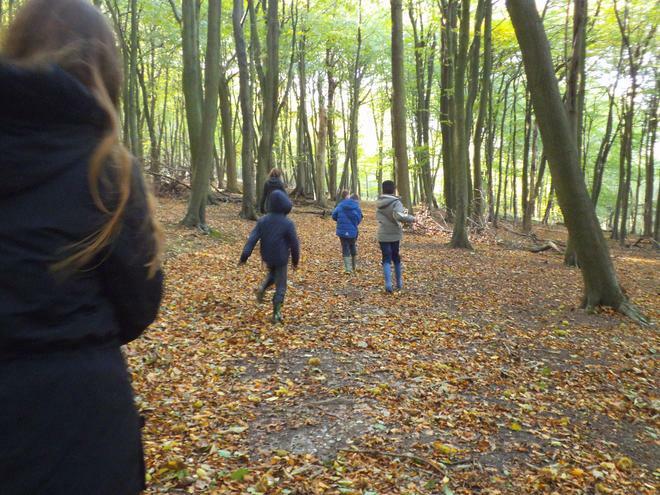 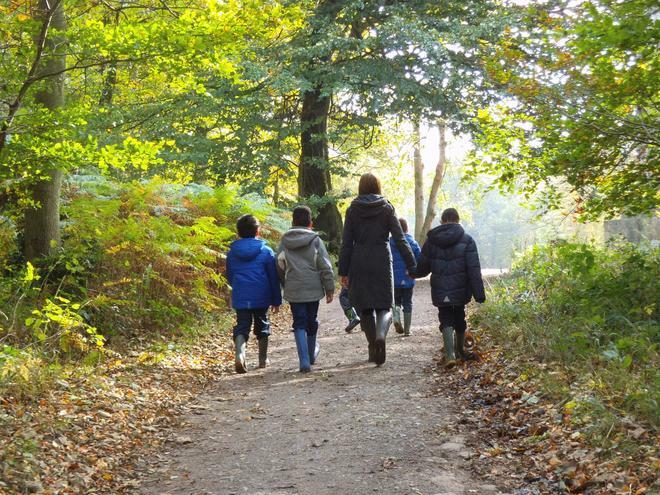 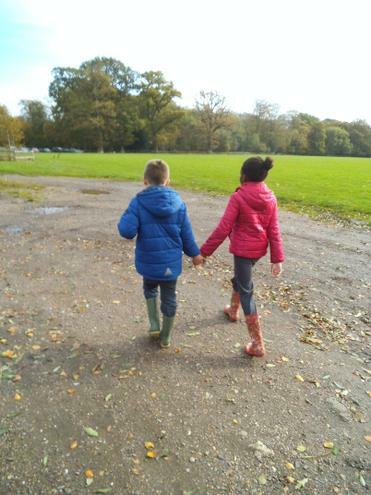 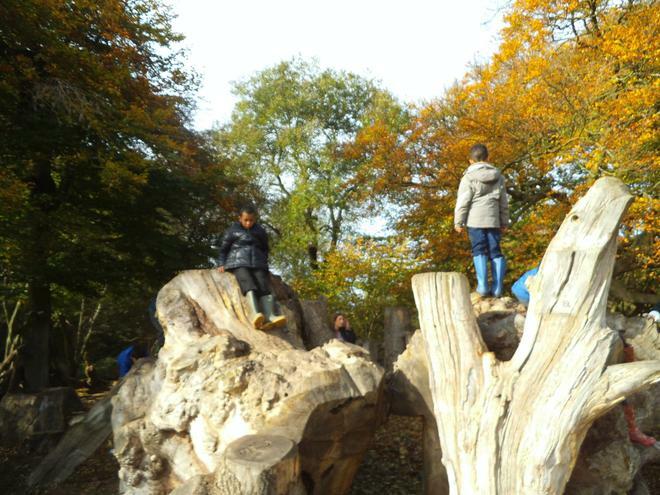 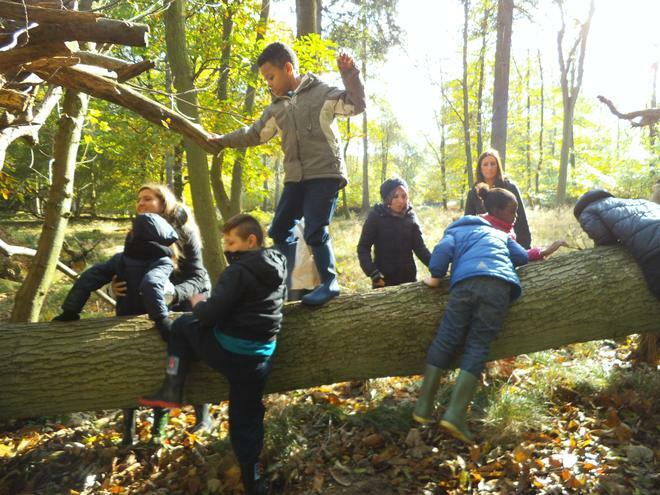 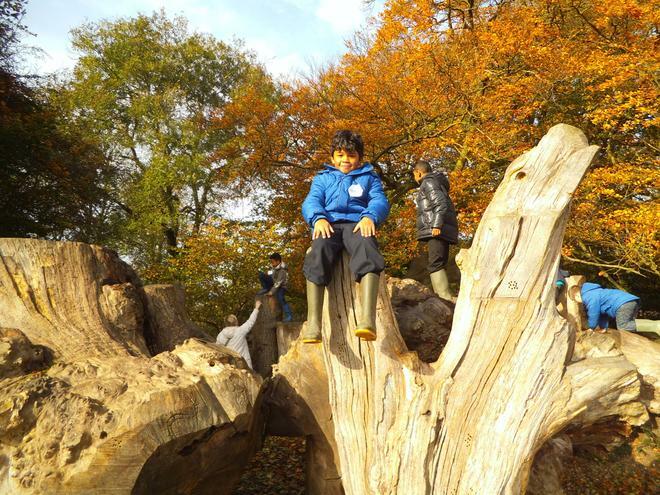 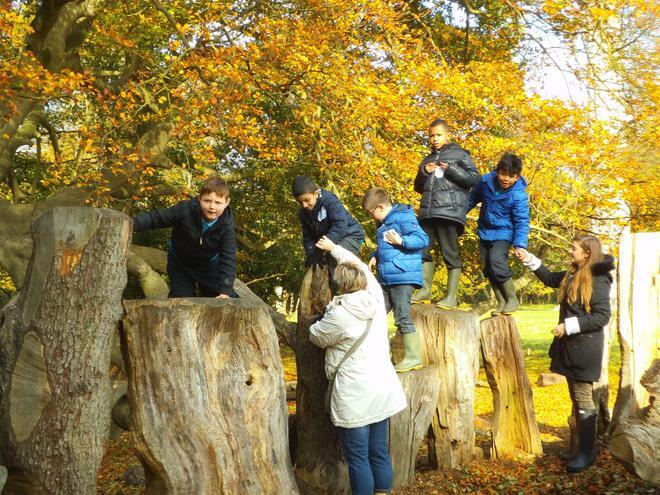 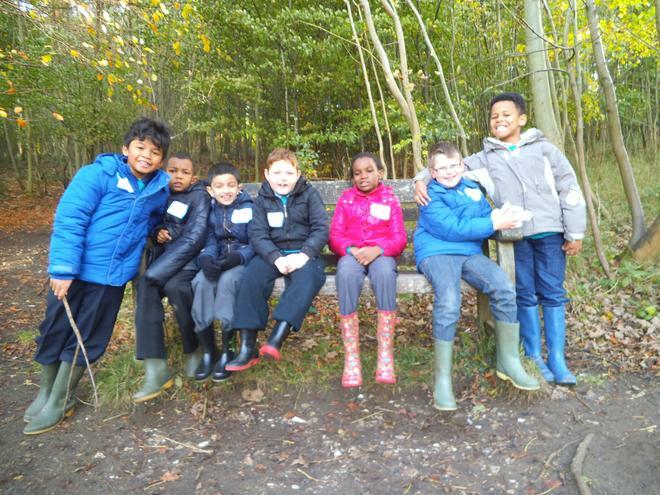 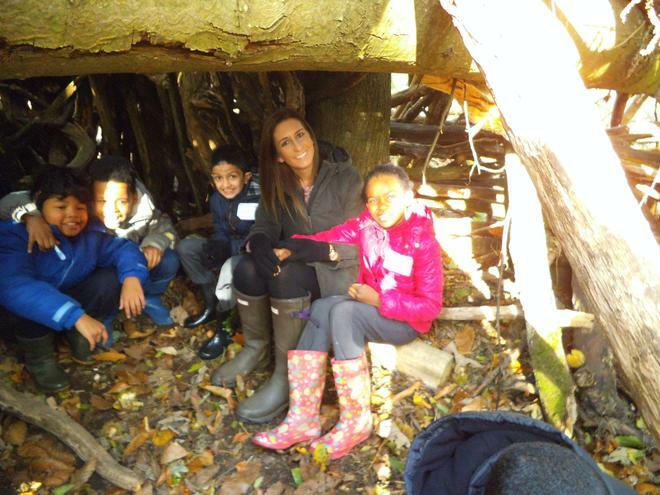 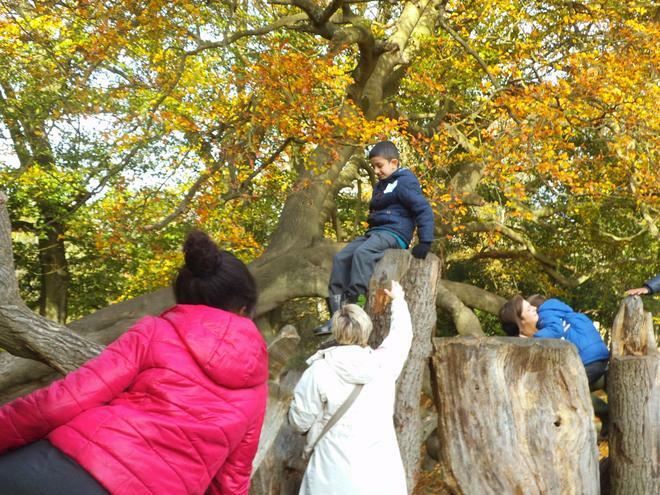 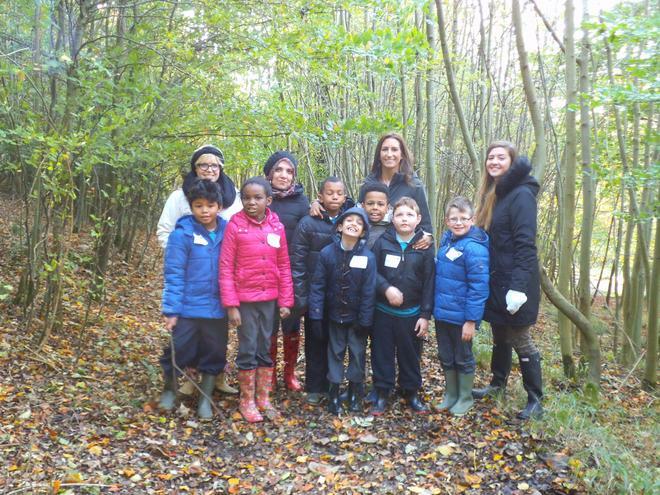 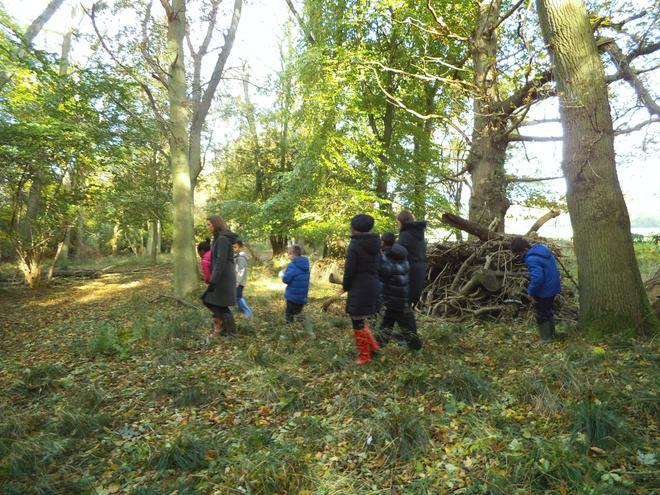 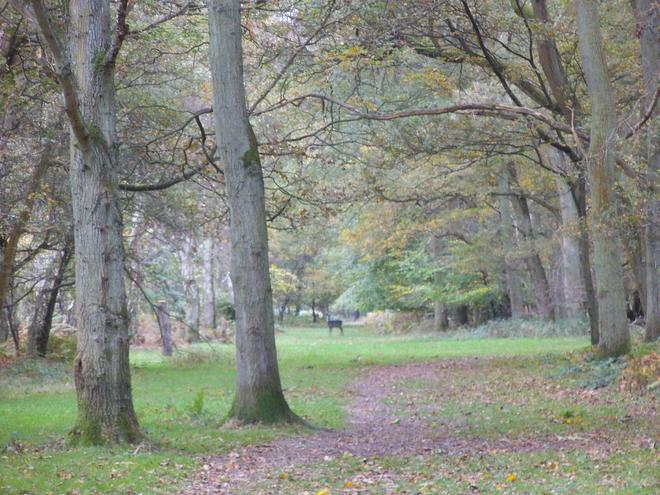 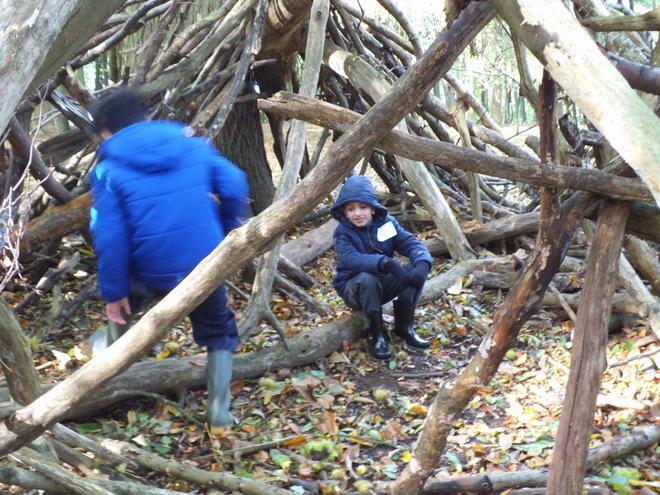 We're ending our half term with a trip to Ashridge to explore nature and see if we can find any witches or little pigs! 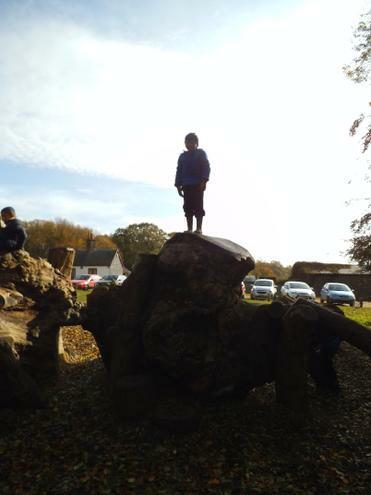 The children are hoping we don't bump into the Big Bad Wolf!!! 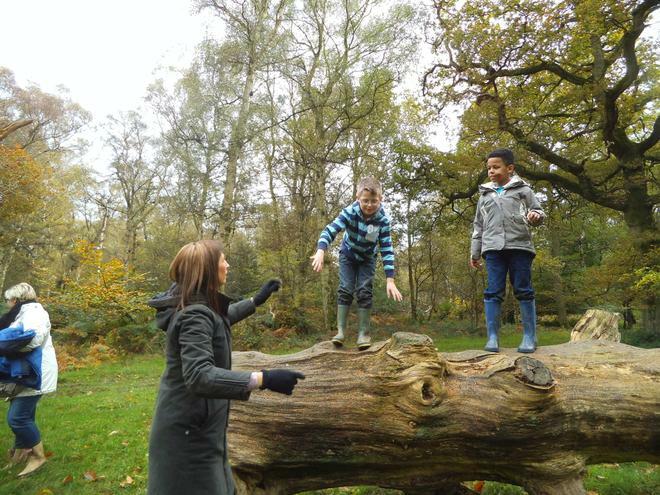 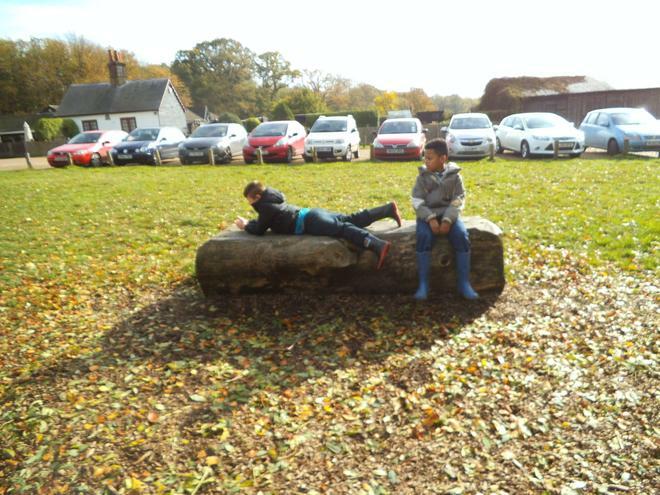 Have a look at some of our photo's and don't forget to look at Richmond Hill TV for some of our videos.